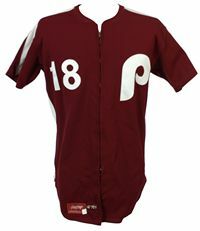 Home jersey lettering changes to maroon tackle twill, the logo "baseball stitch" line is gone, NOB are added, and white trim is removed. 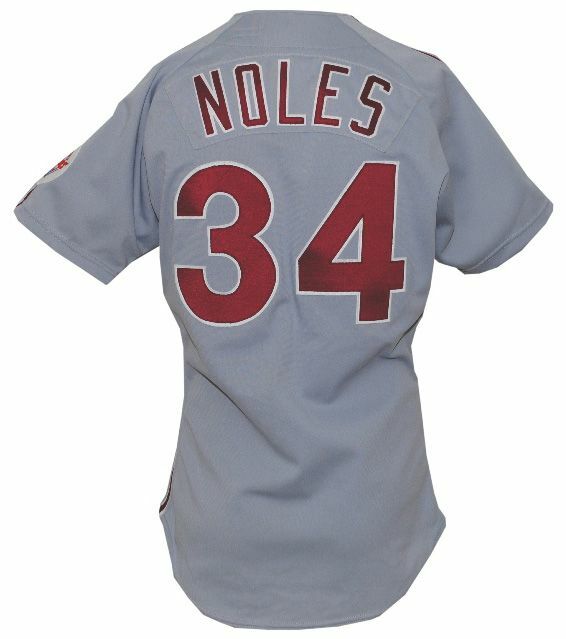 NOB was removed on this one. 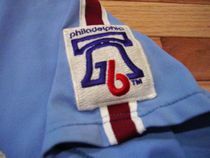 Home jerseys now get zippers as well. 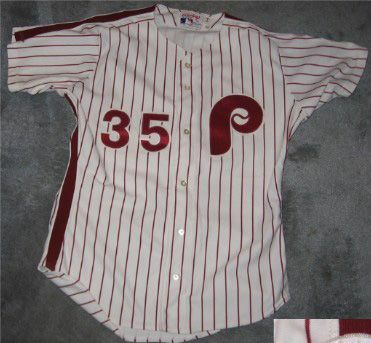 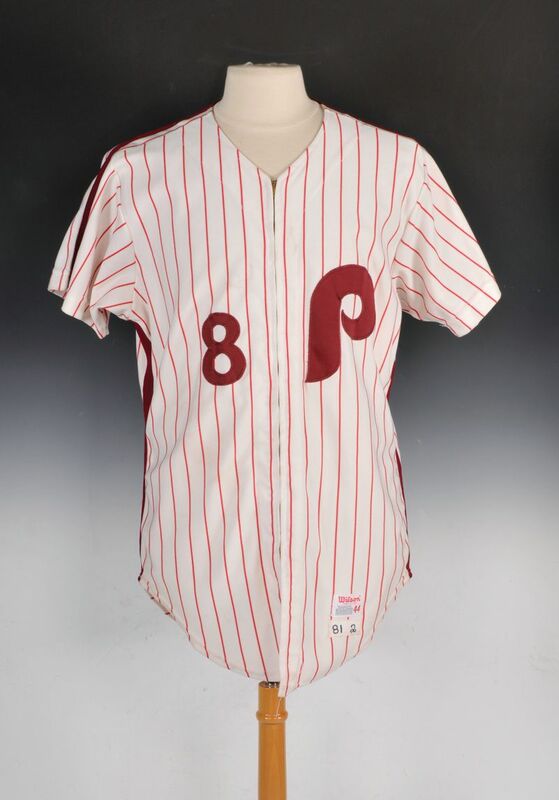 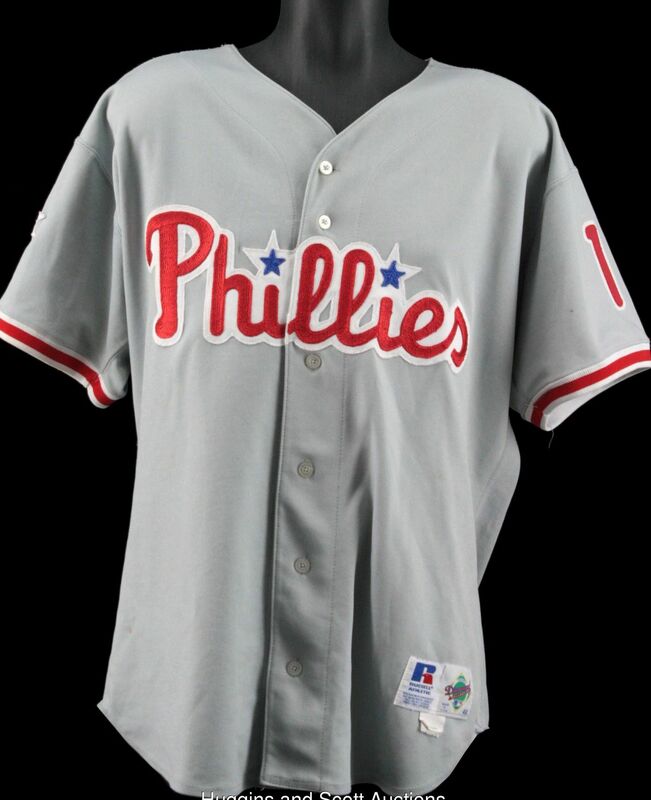 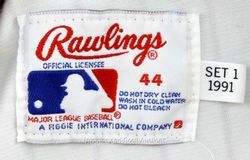 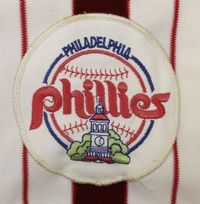 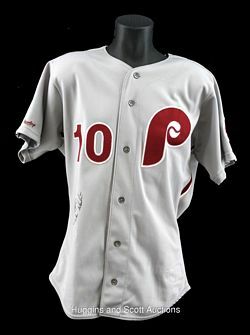 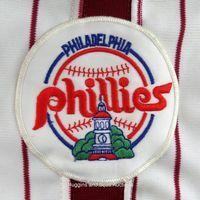 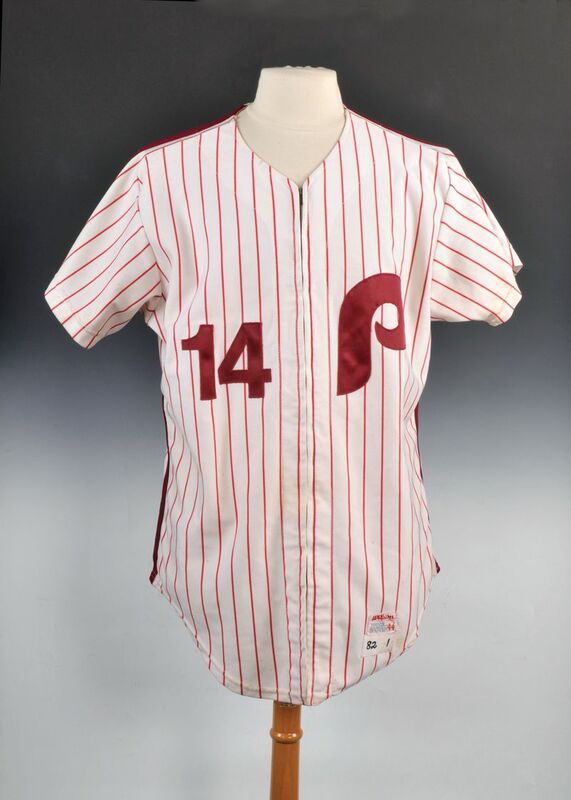 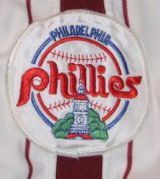 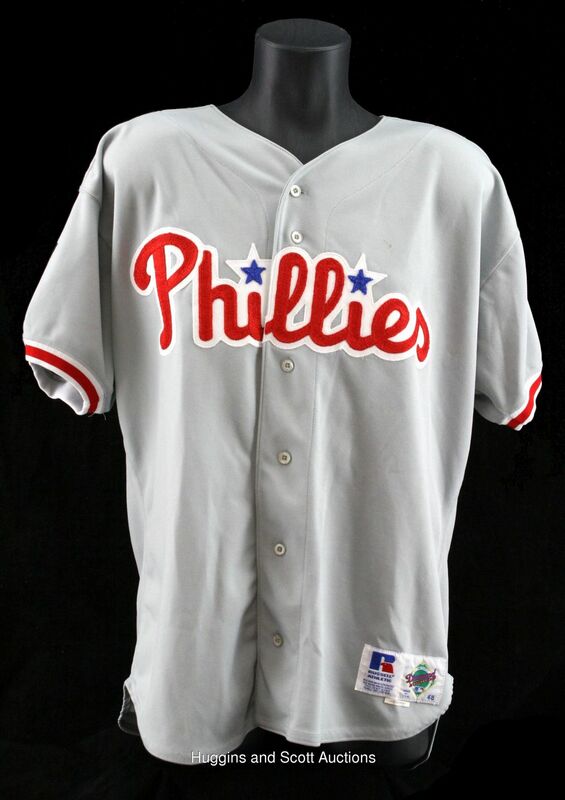 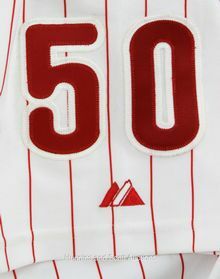 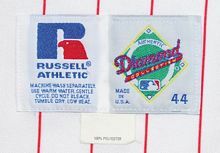 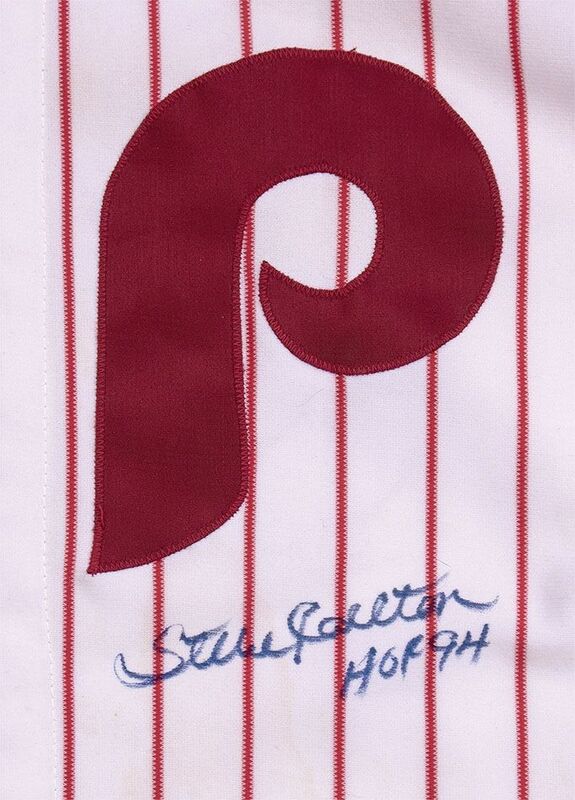 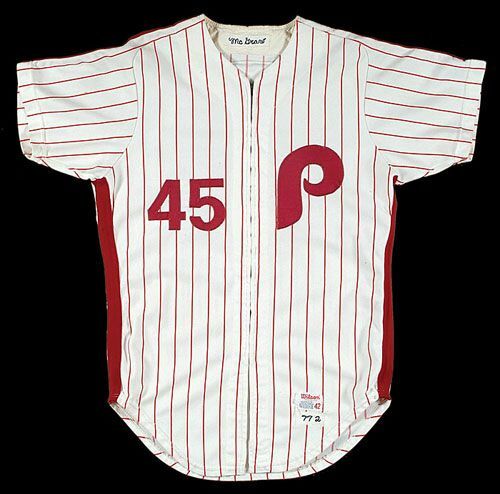 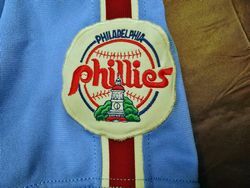 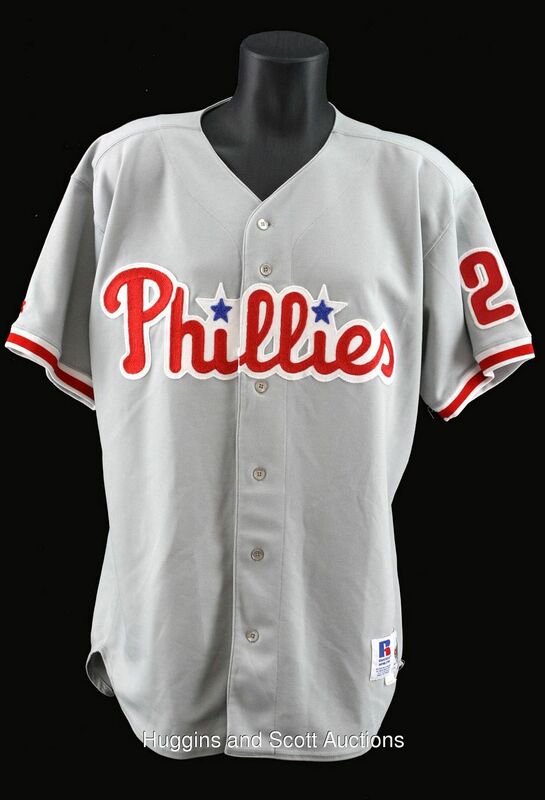 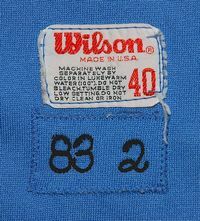 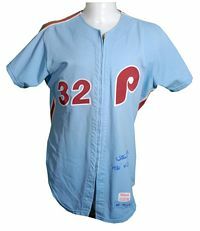 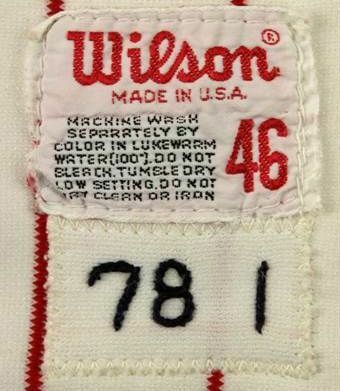 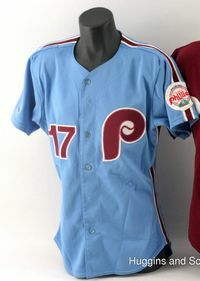 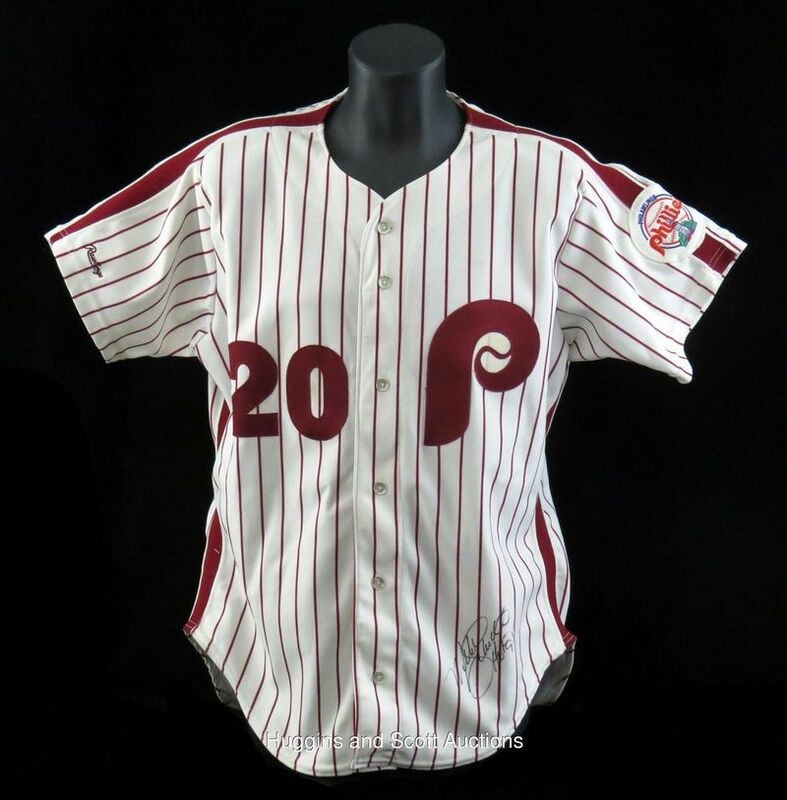 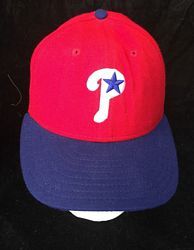 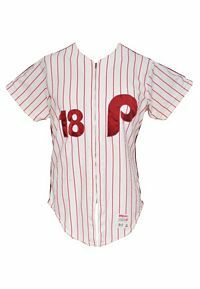 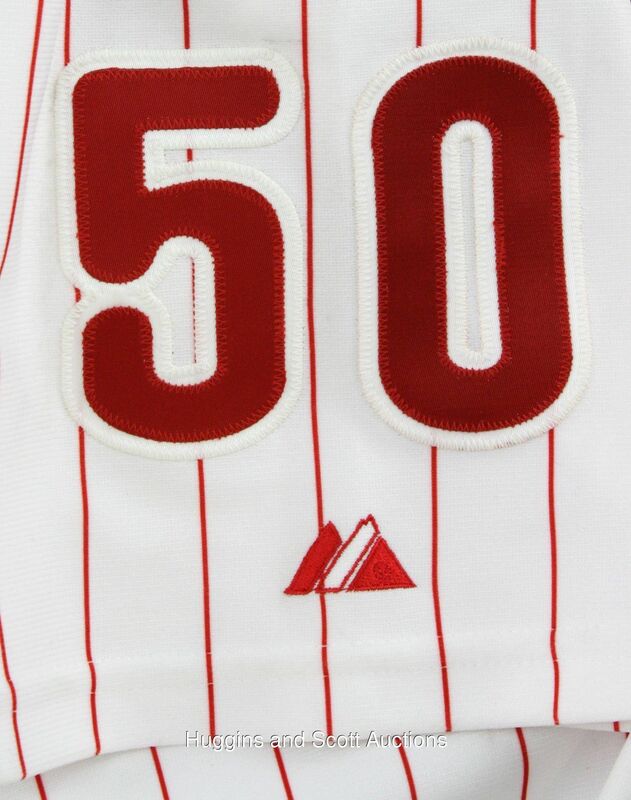 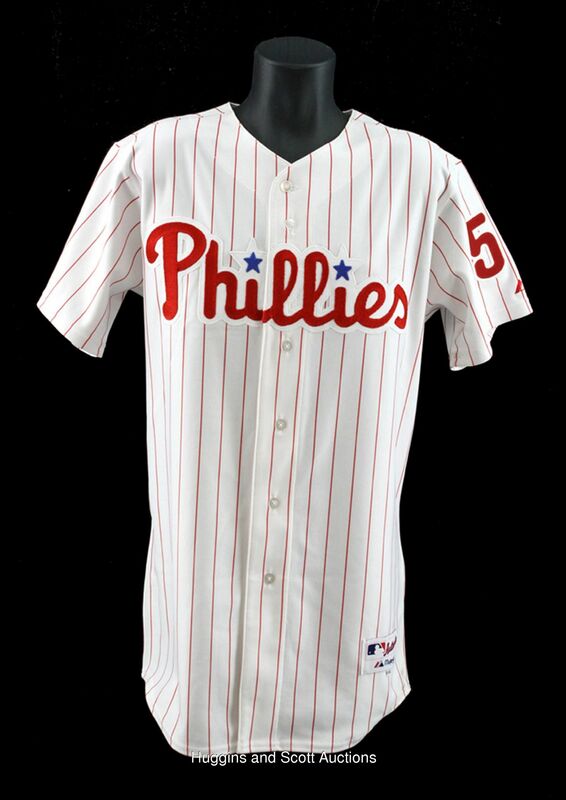 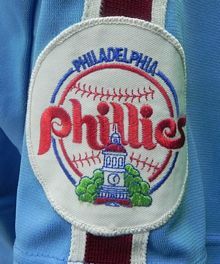 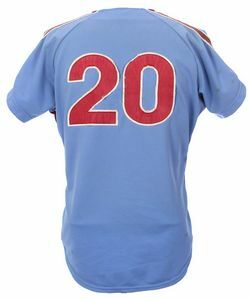 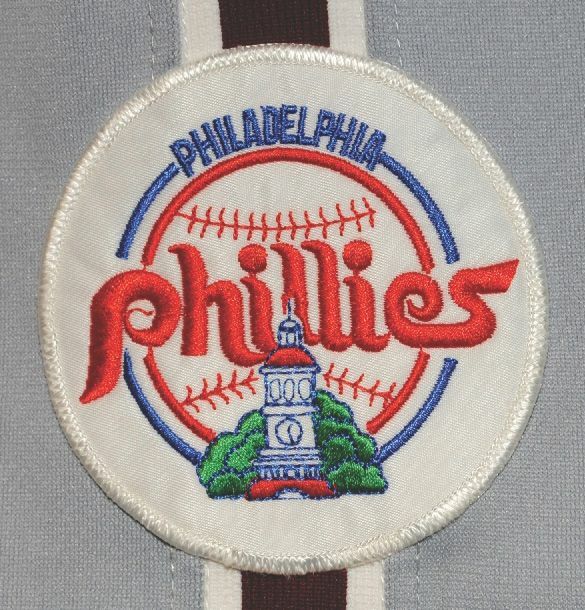 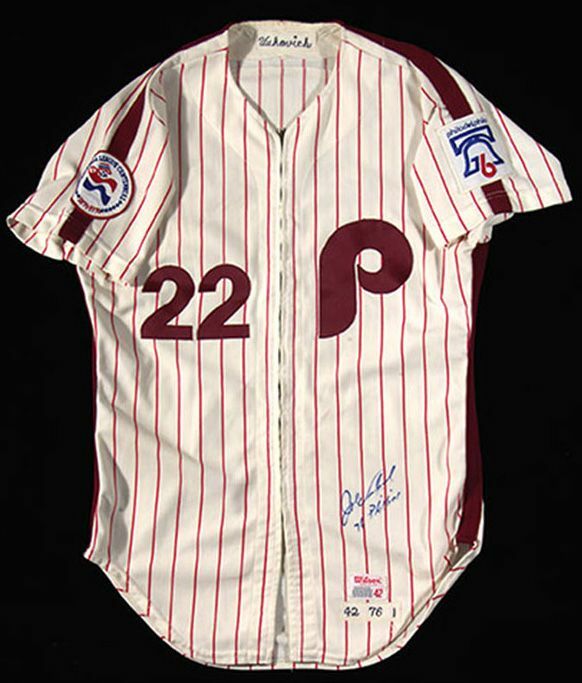 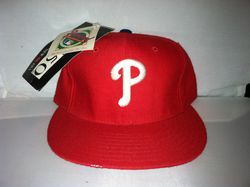 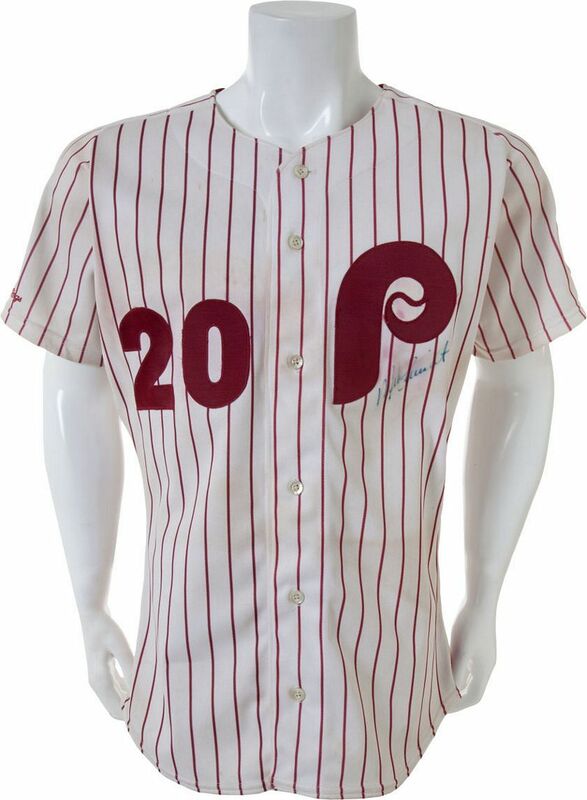 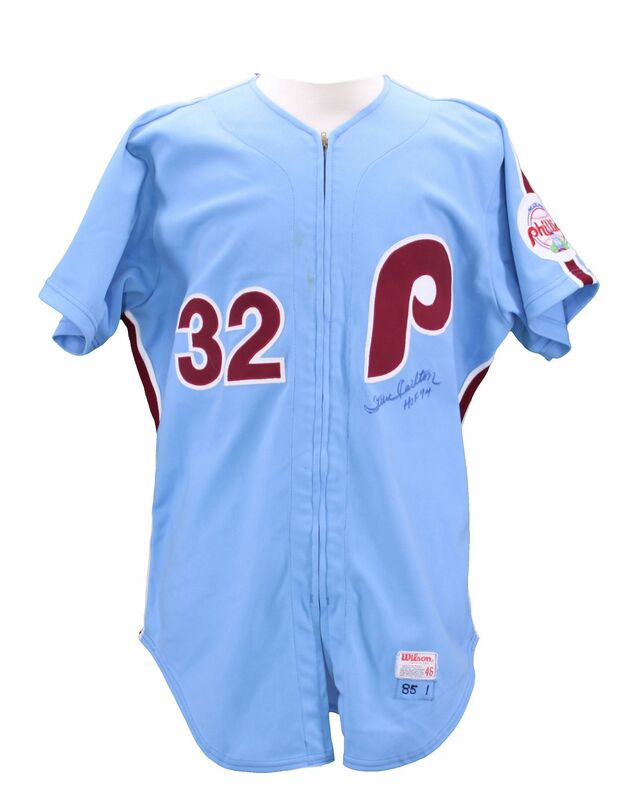 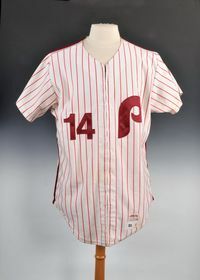 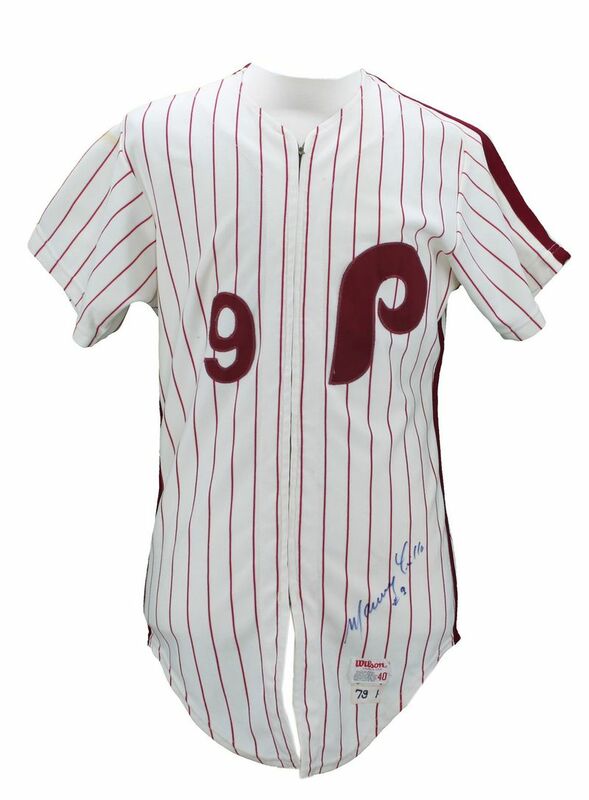 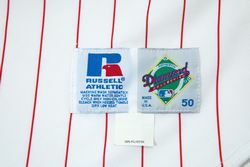 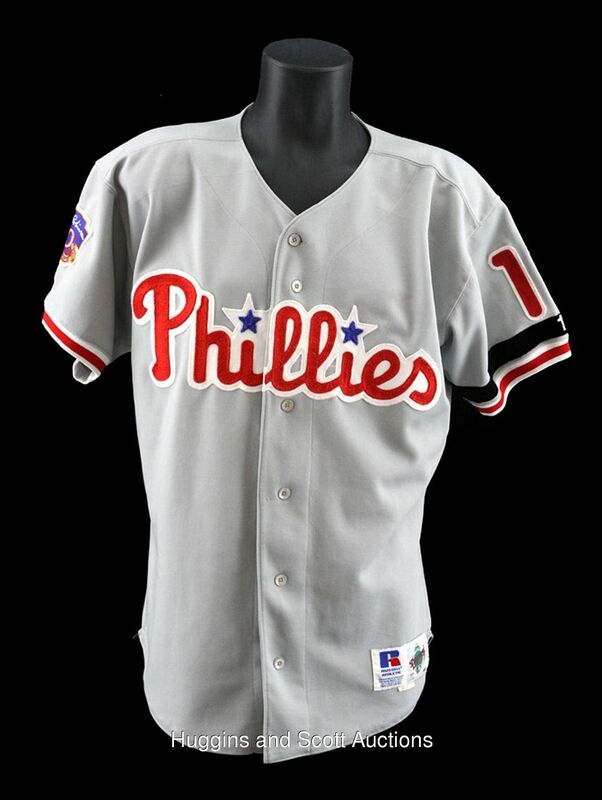 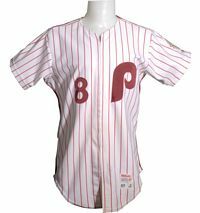 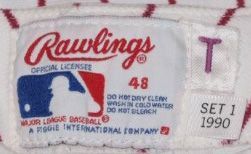 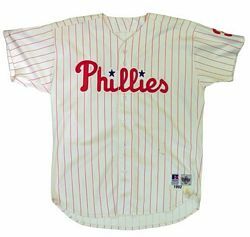 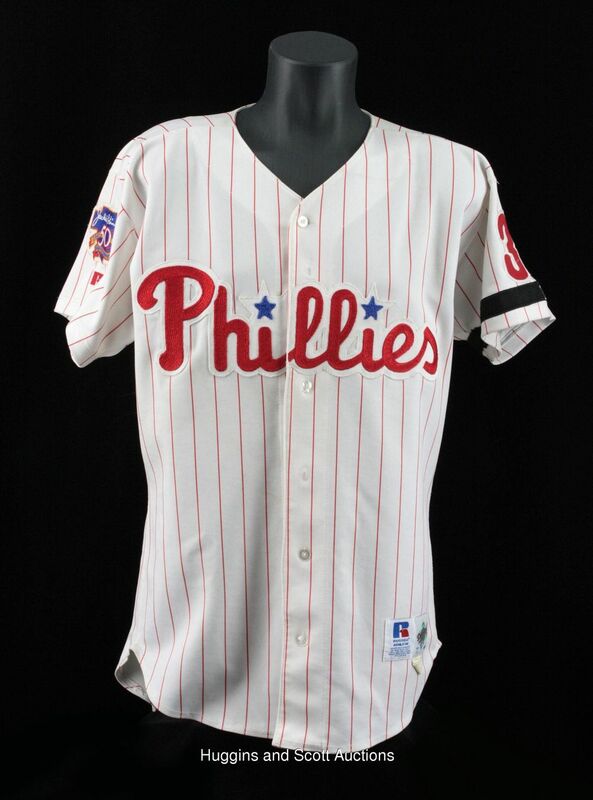 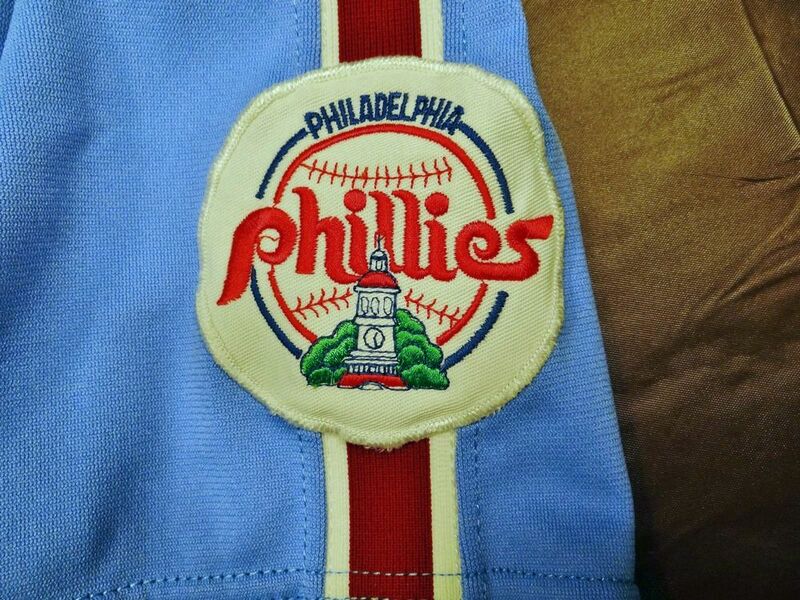 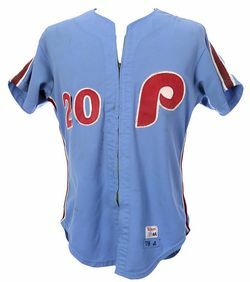 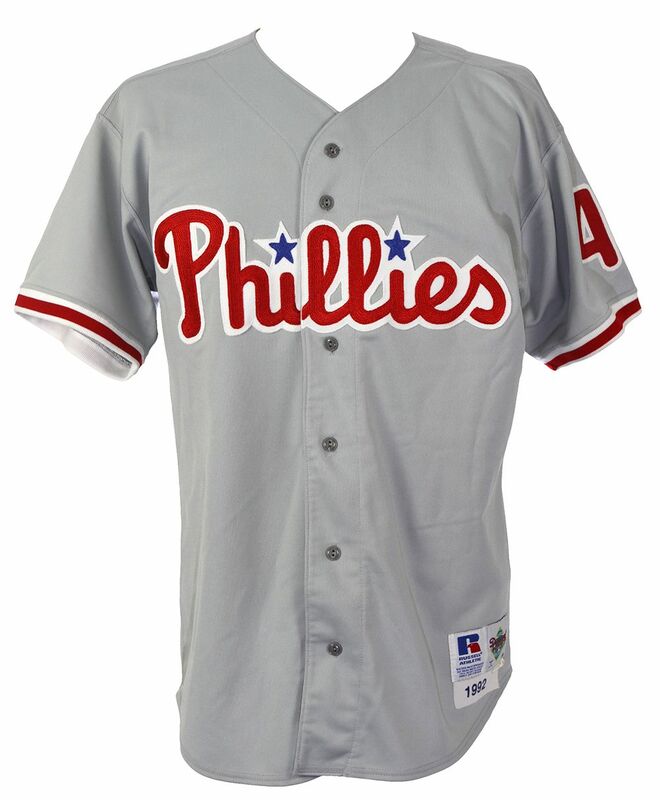 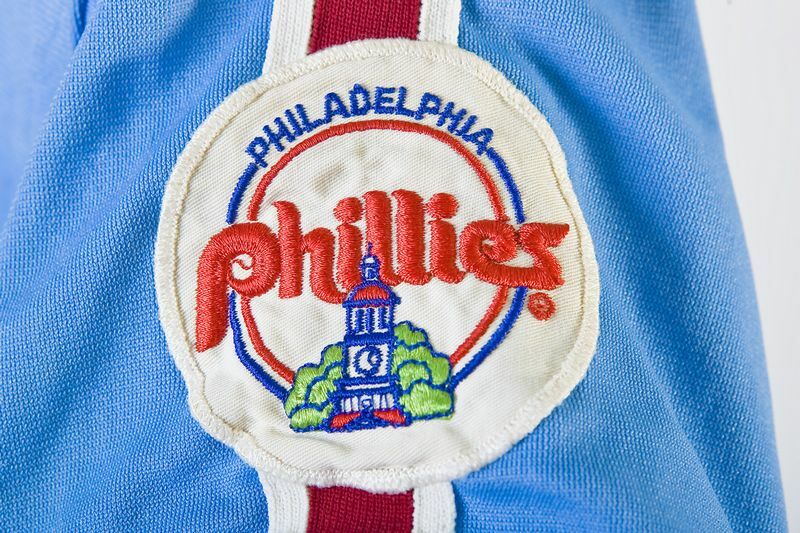 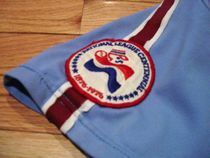 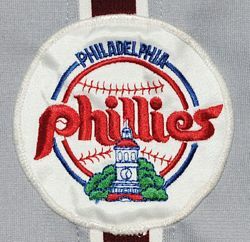 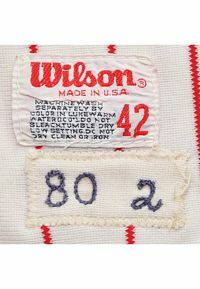 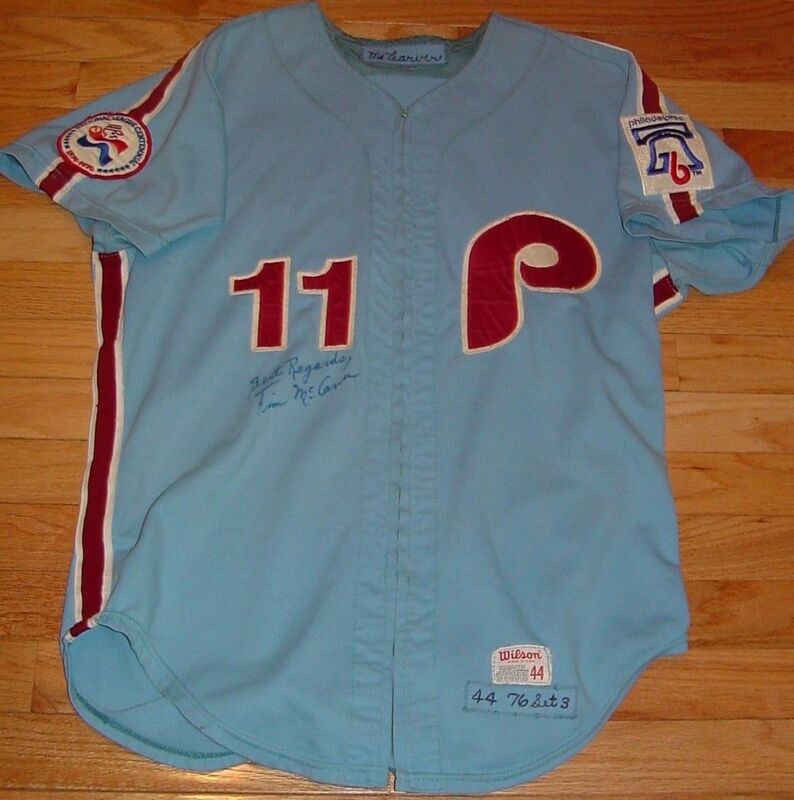 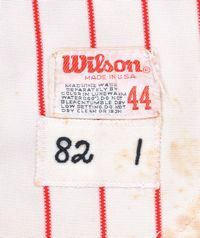 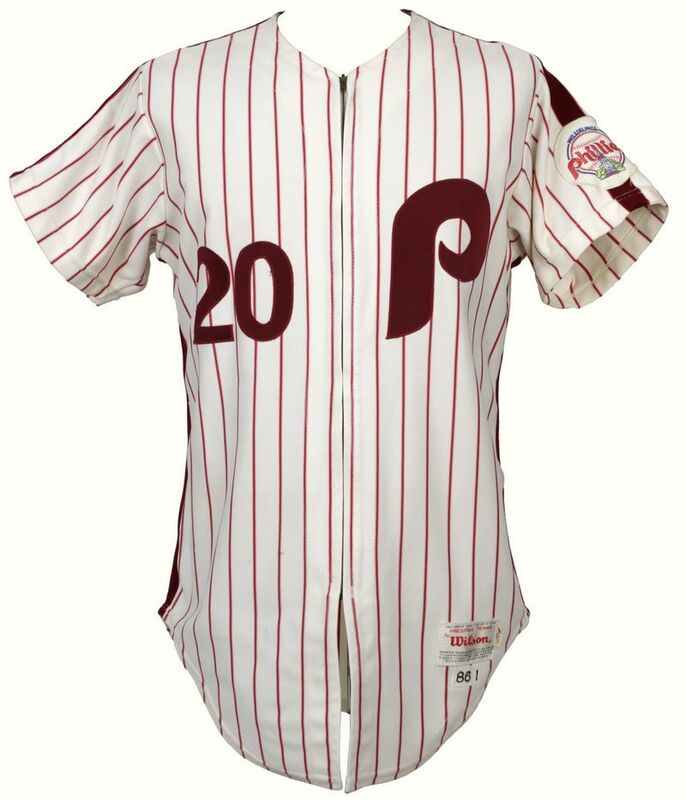 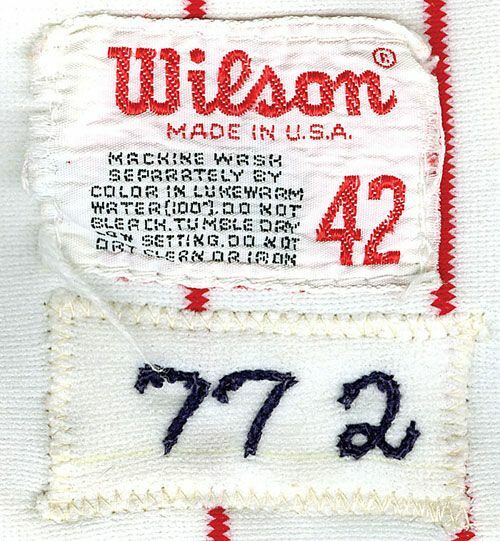 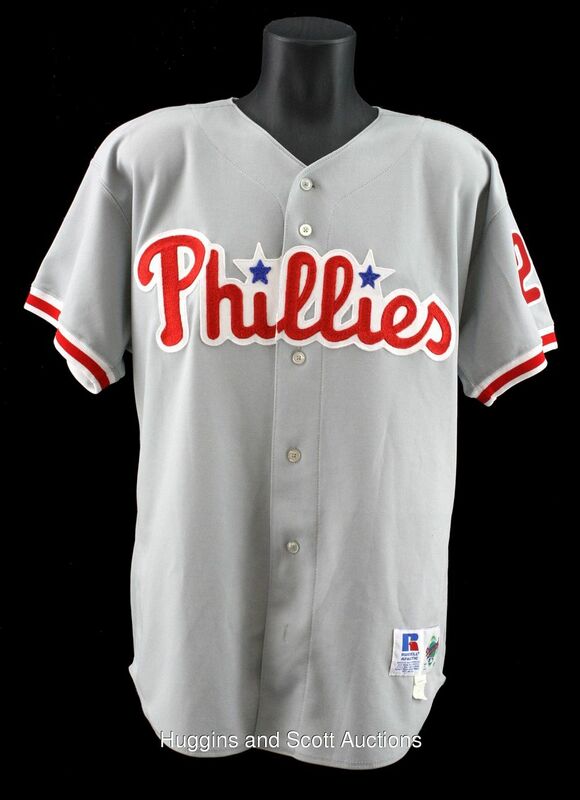 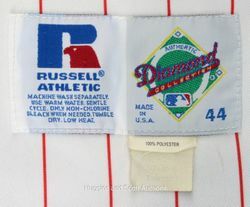 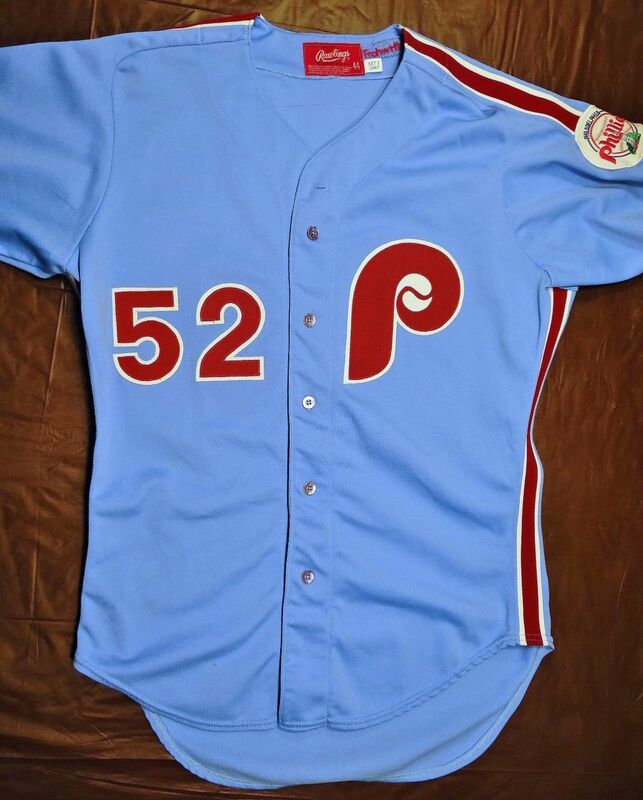 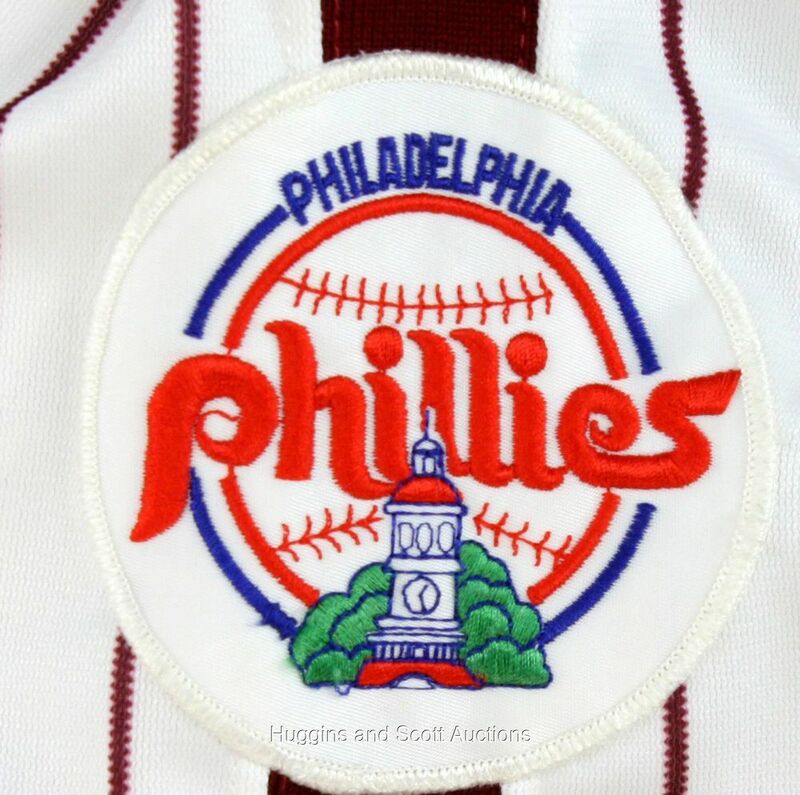 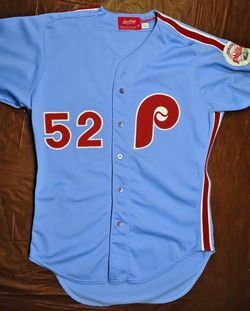 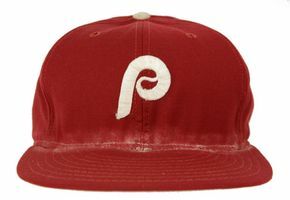 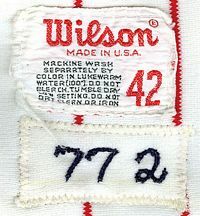 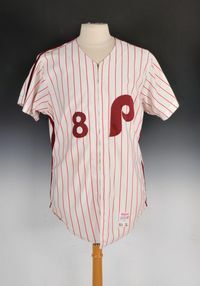 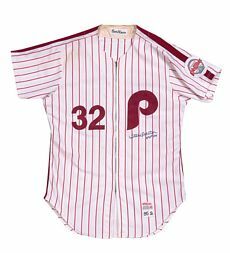 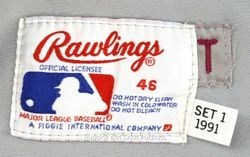 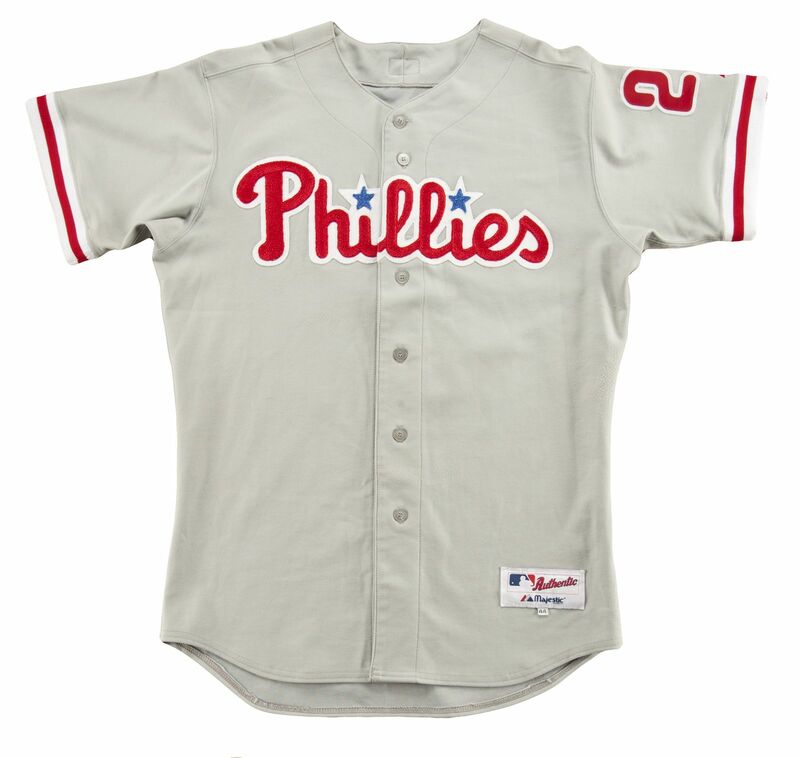 City of Philadelphia and NL Centennial patches worn in 1976. 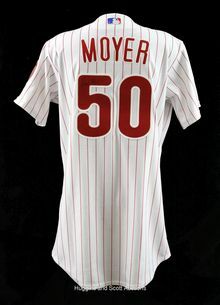 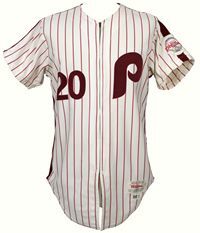 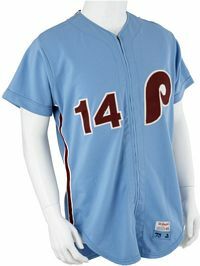 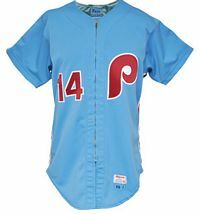 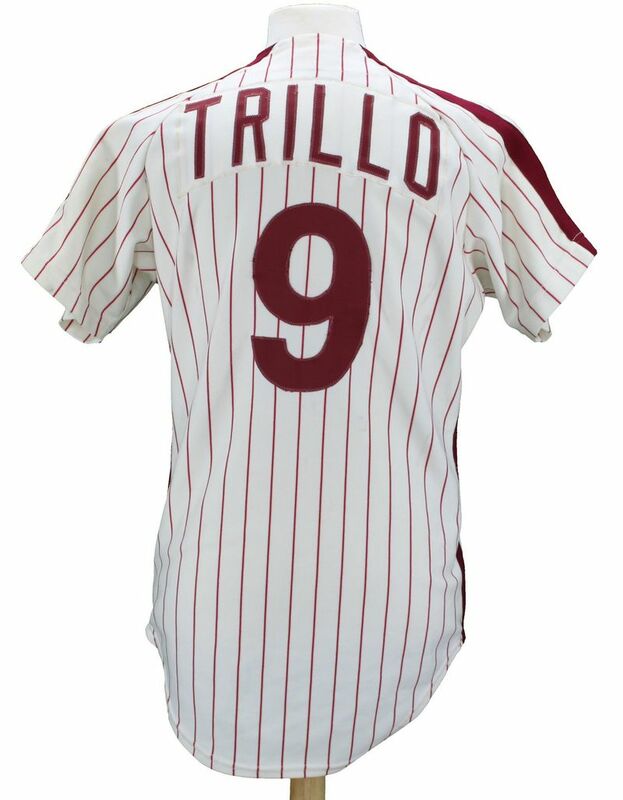 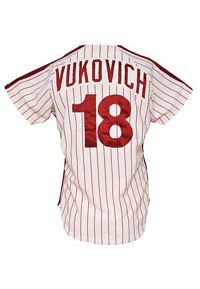 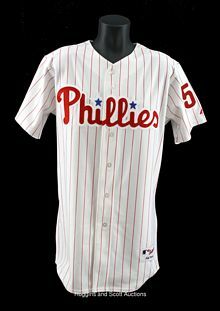 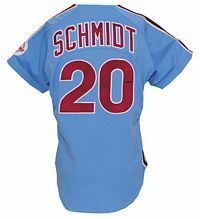 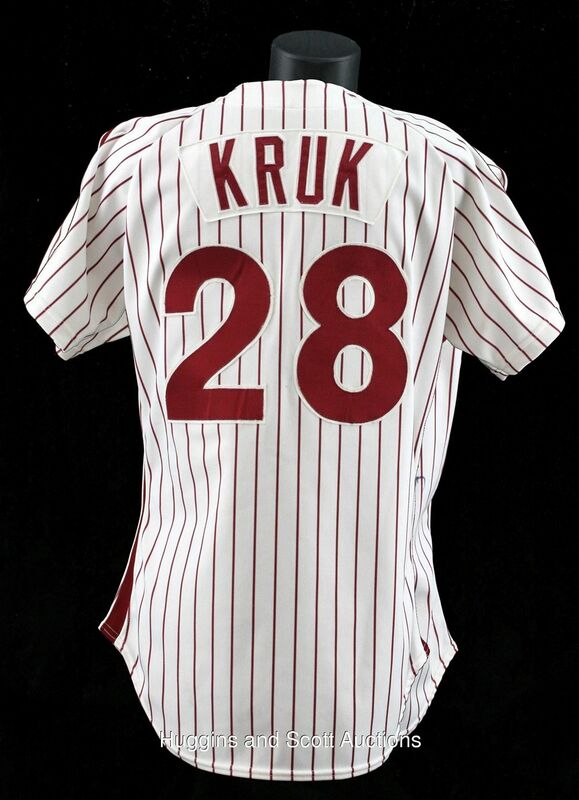 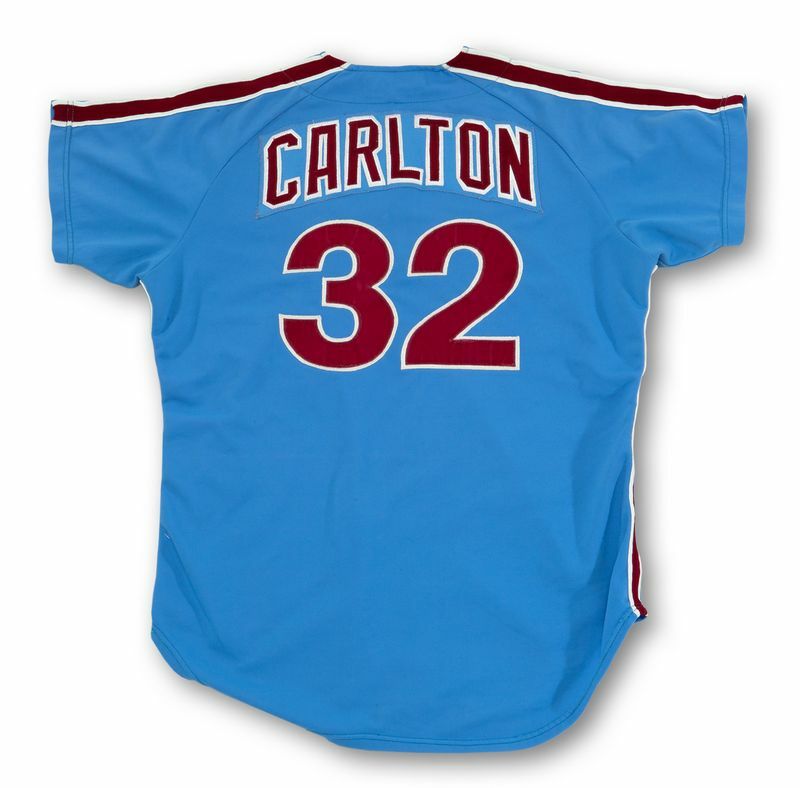 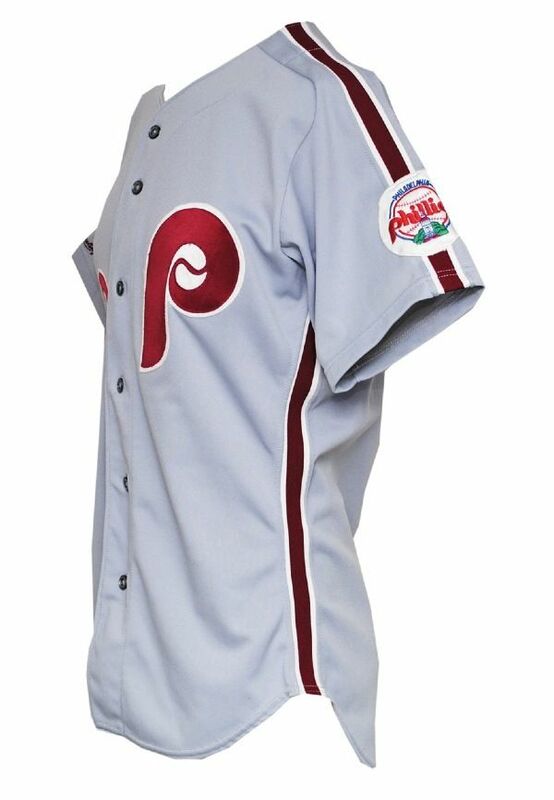 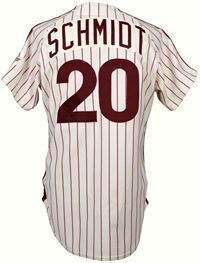 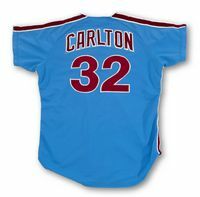 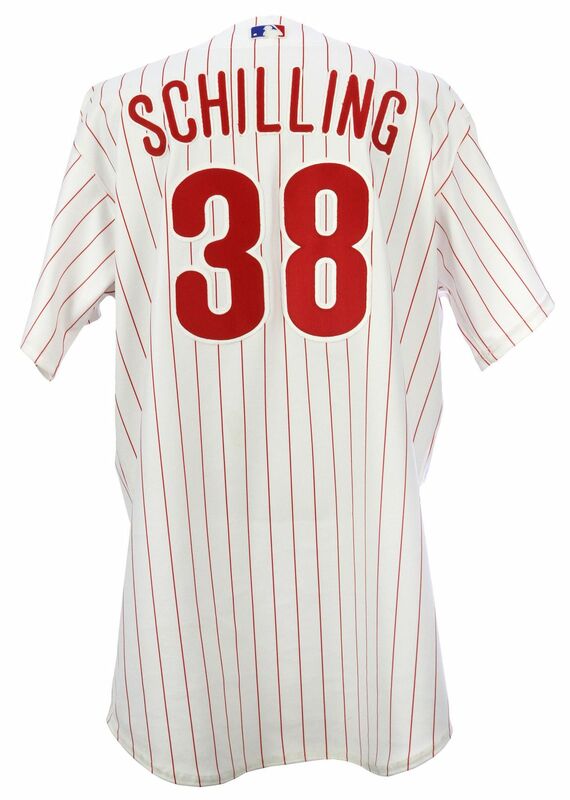 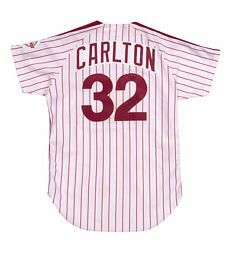 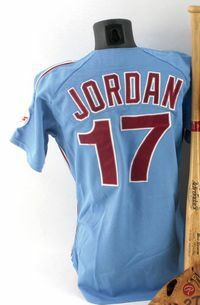 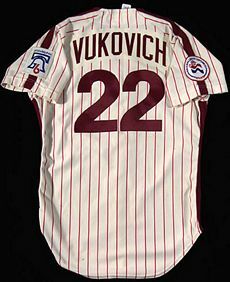 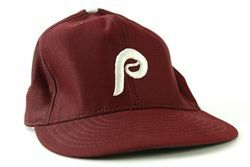 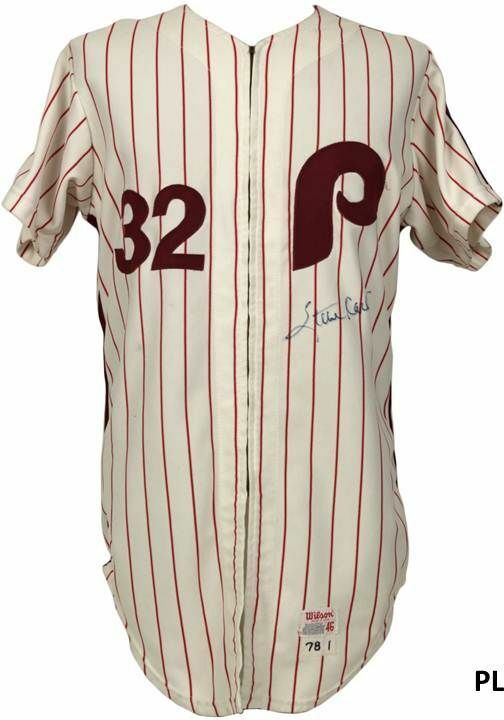 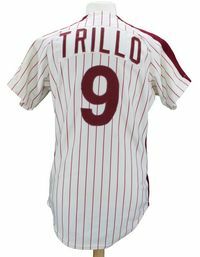 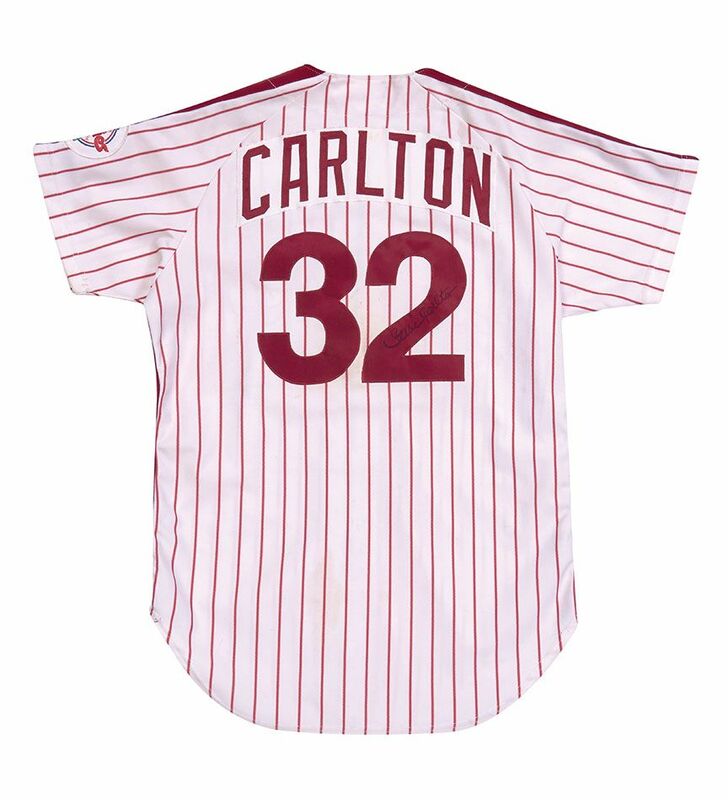 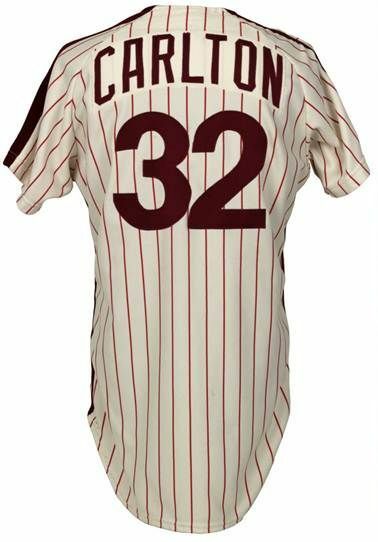 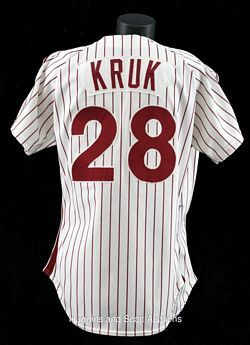 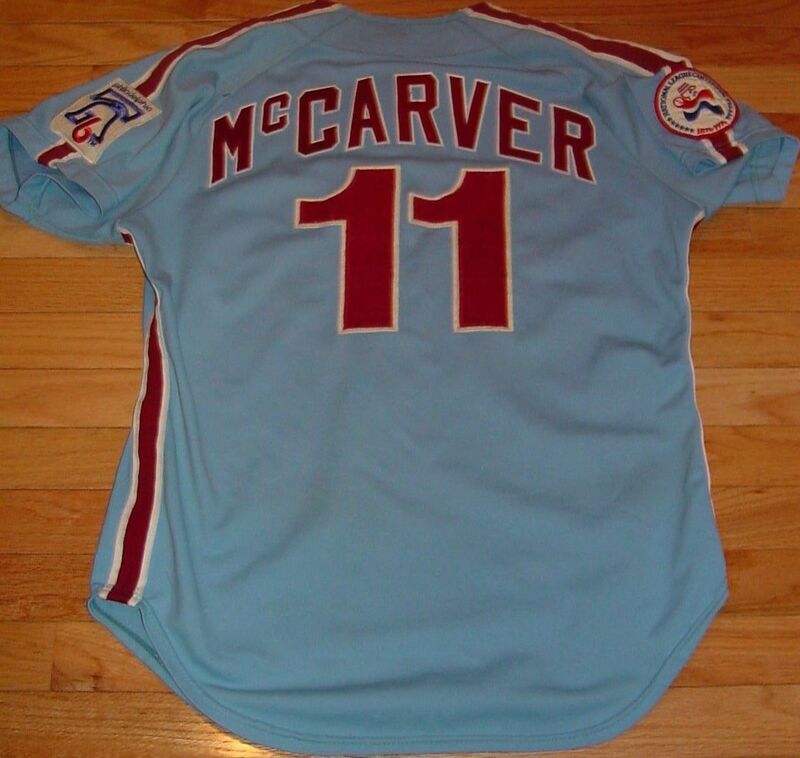 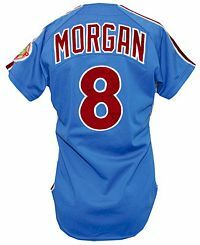 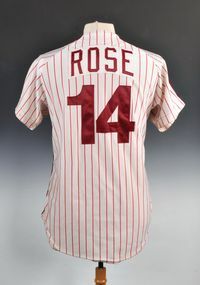 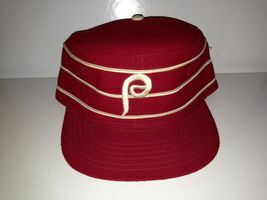 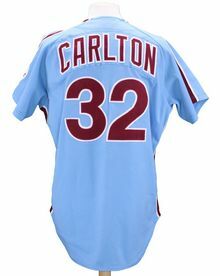 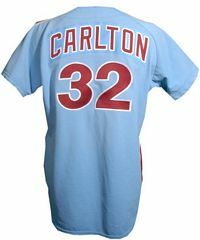 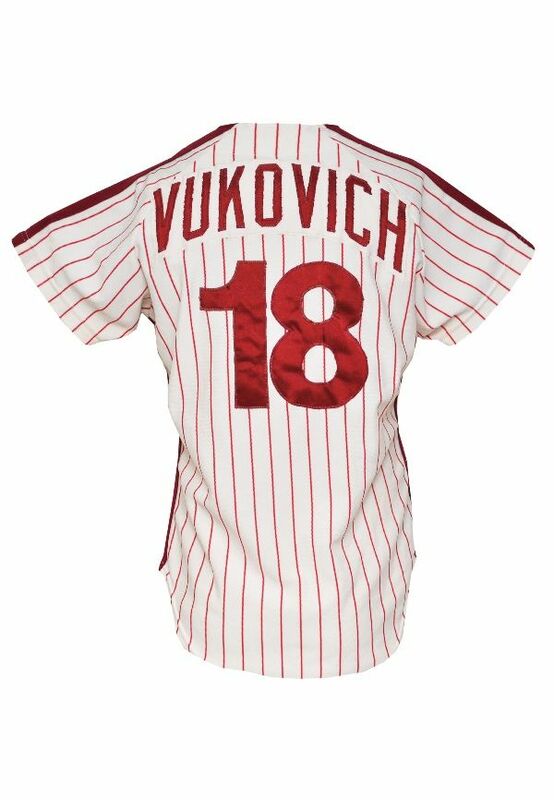 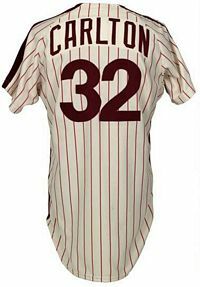 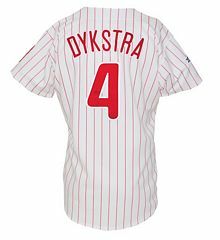 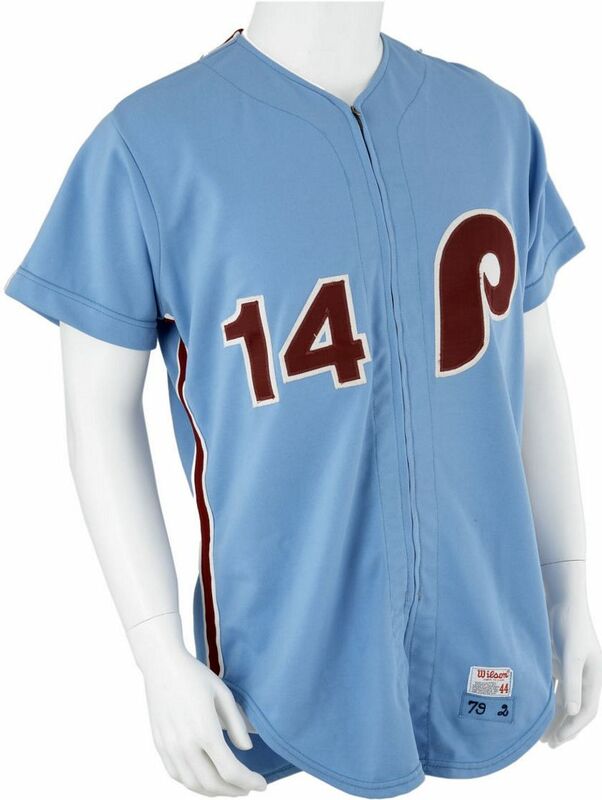 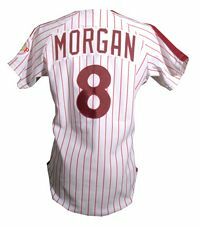 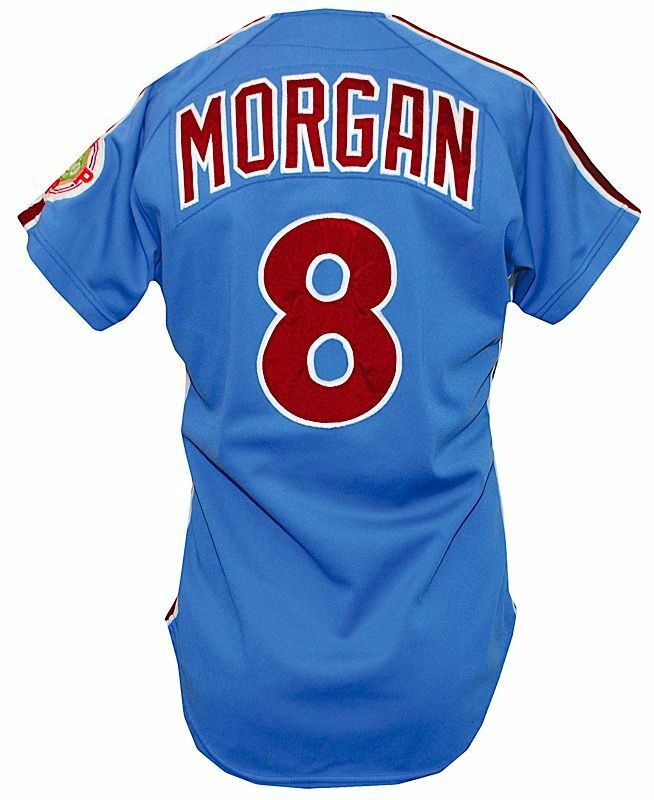 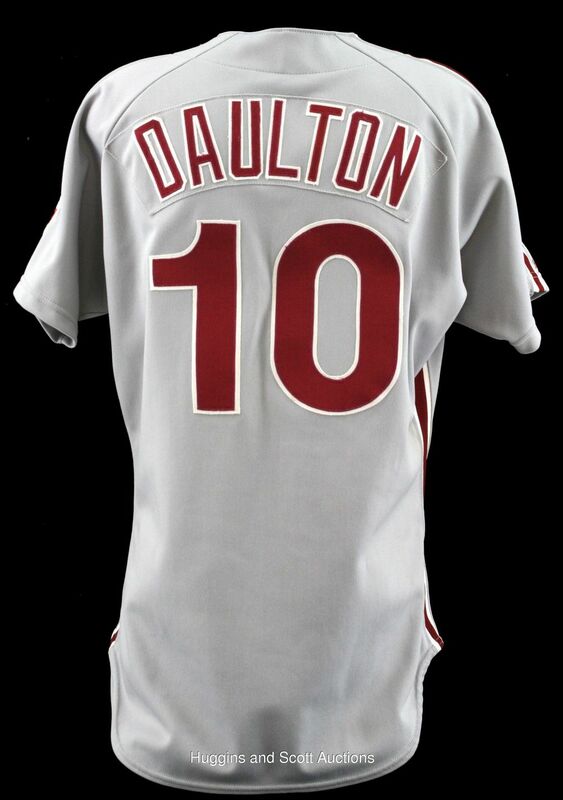 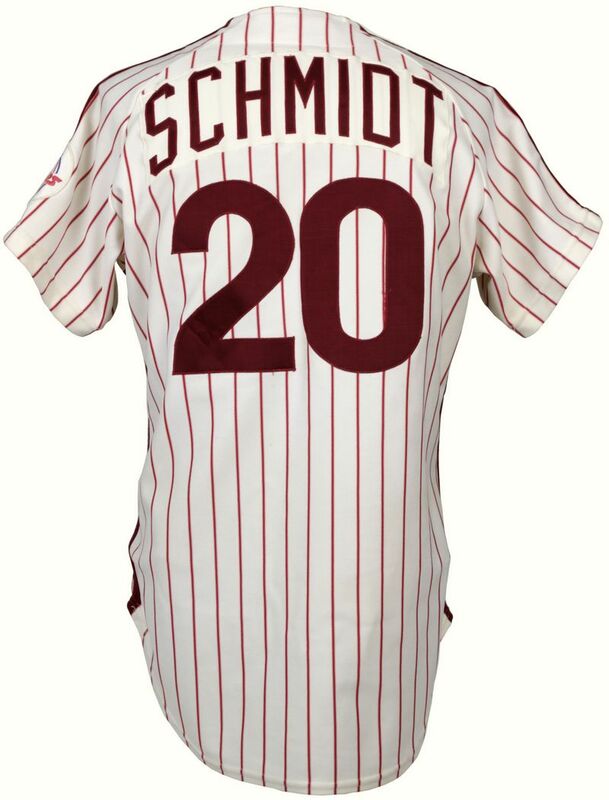 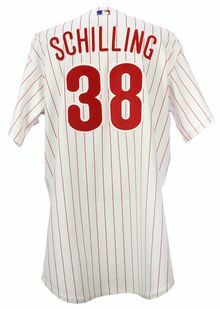 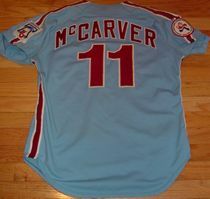 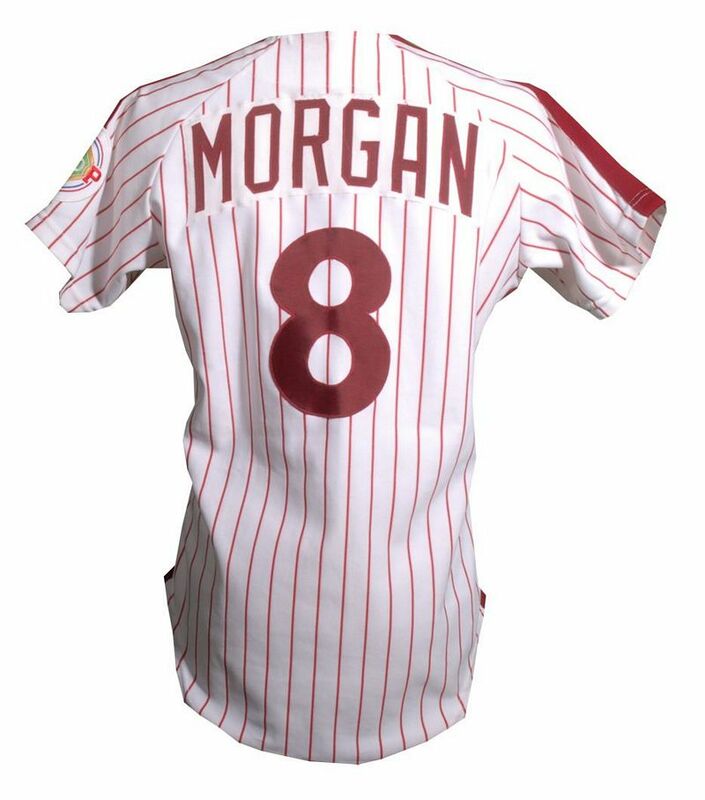 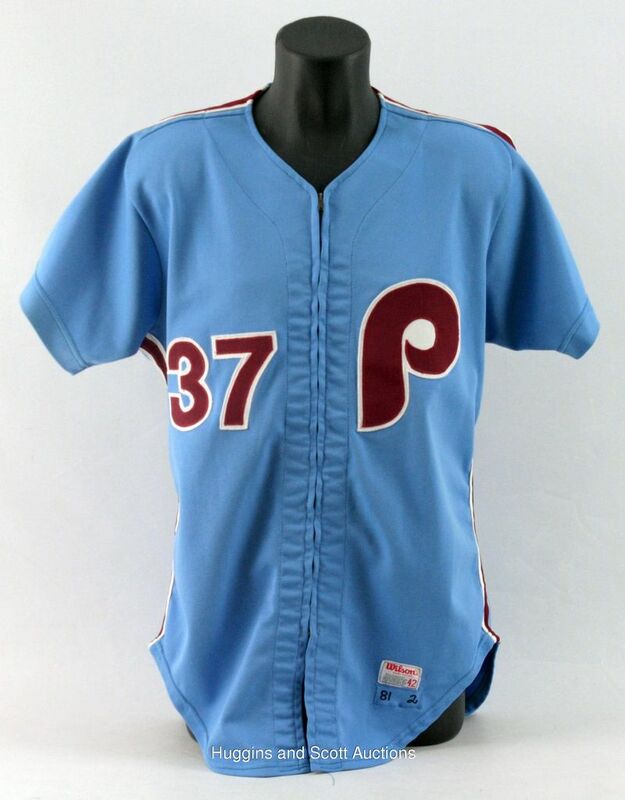 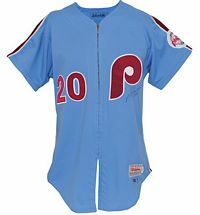 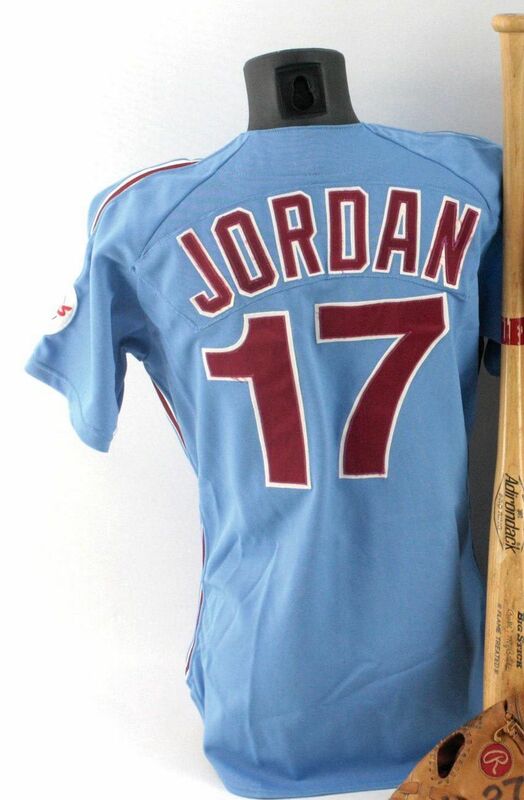 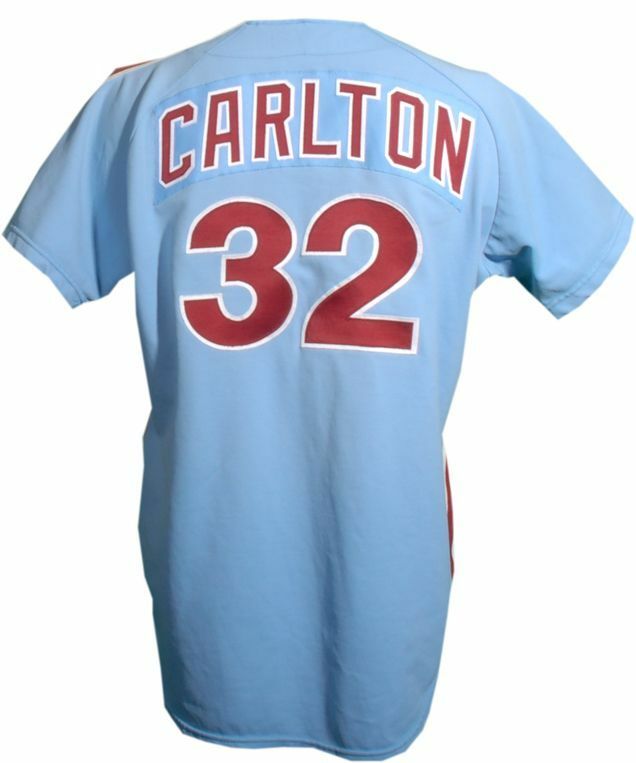 The Phillies unveil a maroon alternate jersey, with maroon pants and maroon nylon cap, so hideous and loathed by players it gets retired instantly after one game. 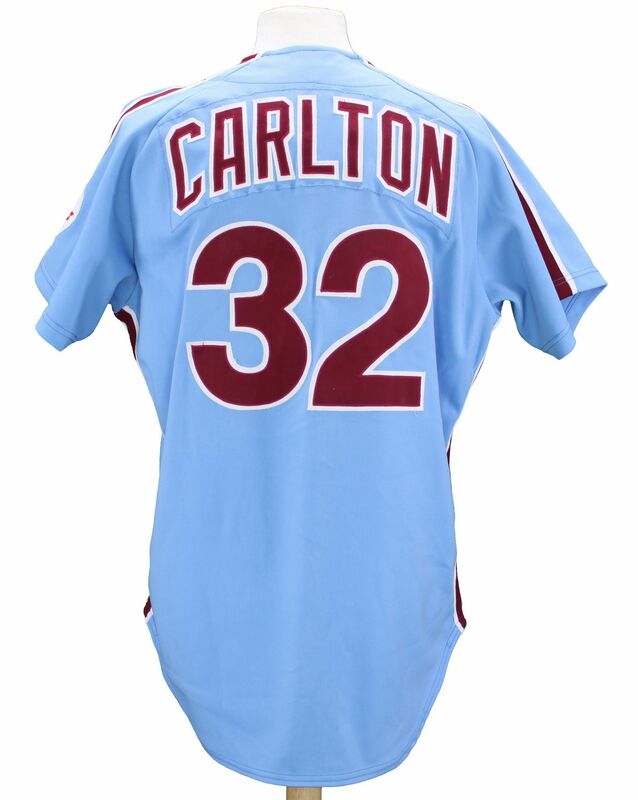 Maroon alternate to the dustbin. 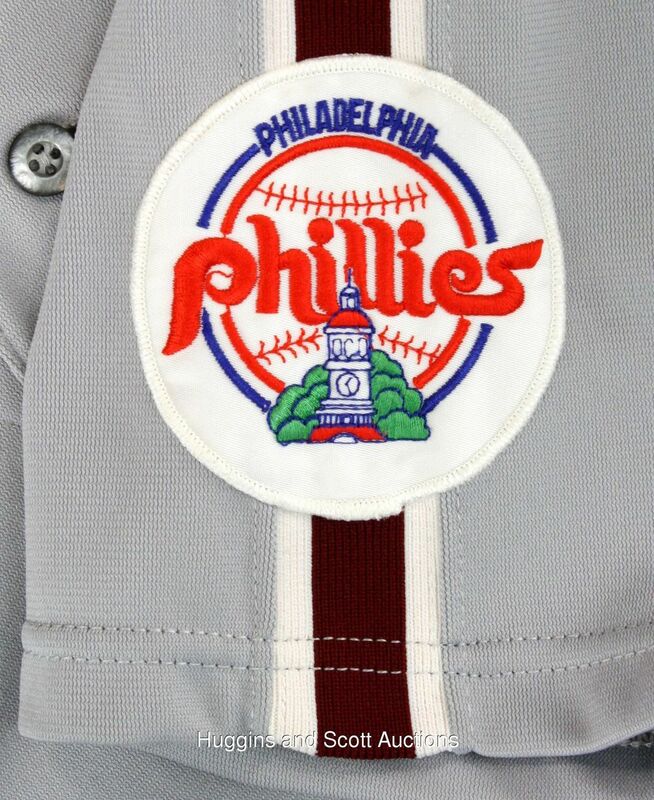 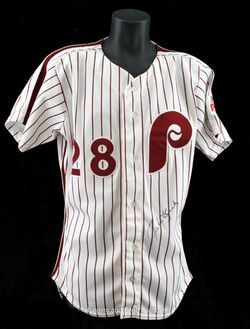 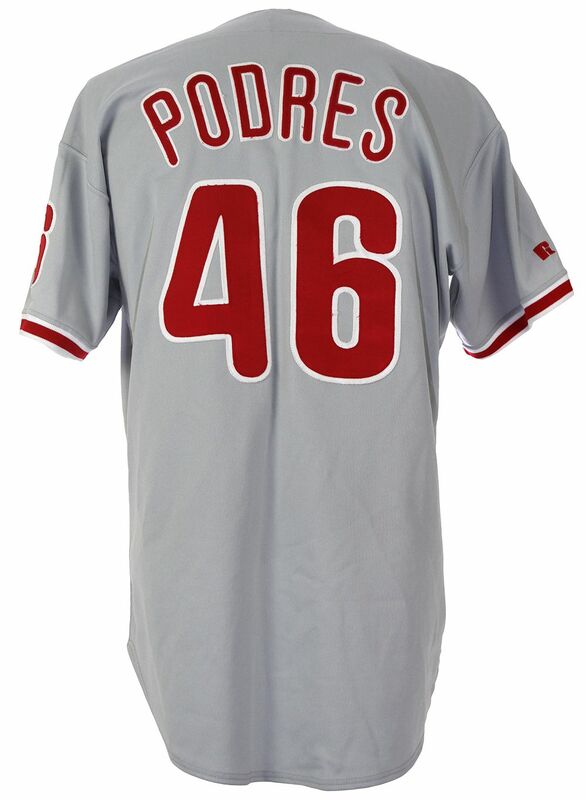 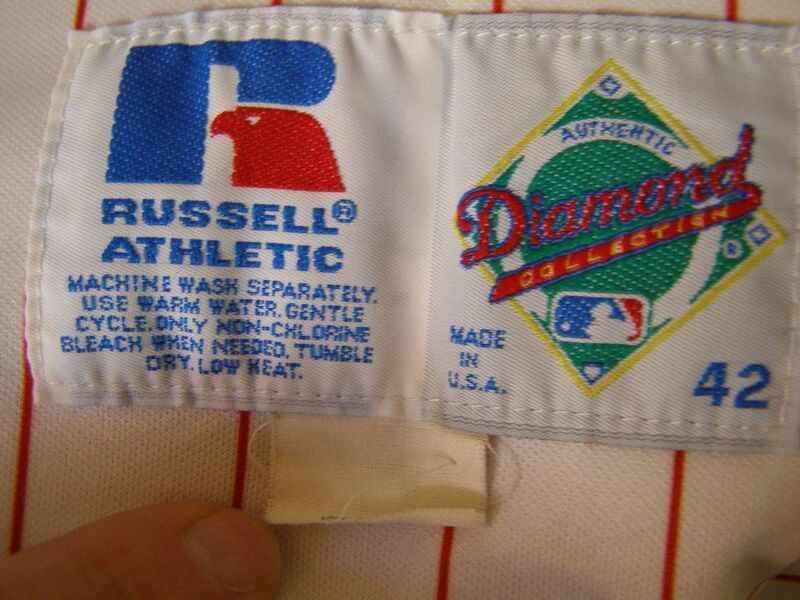 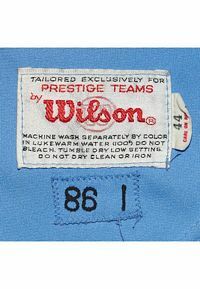 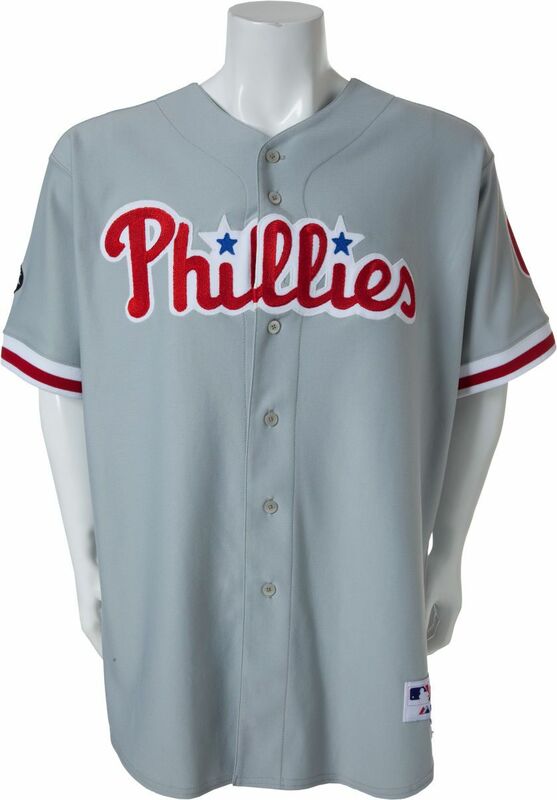 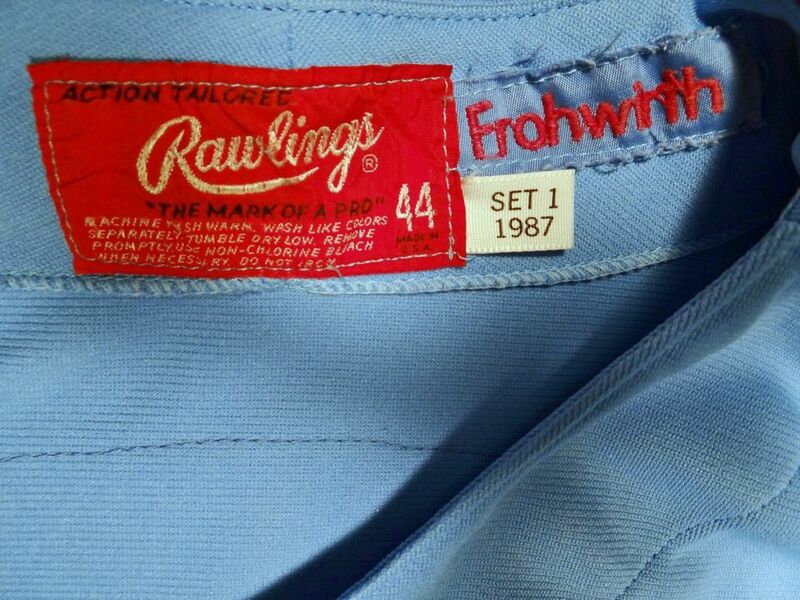 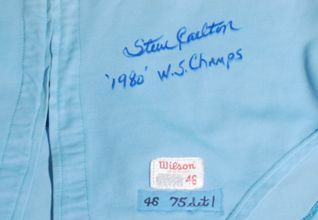 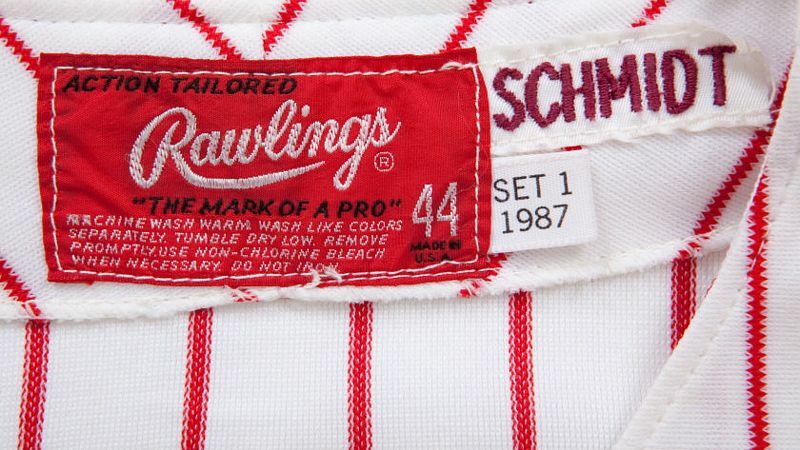 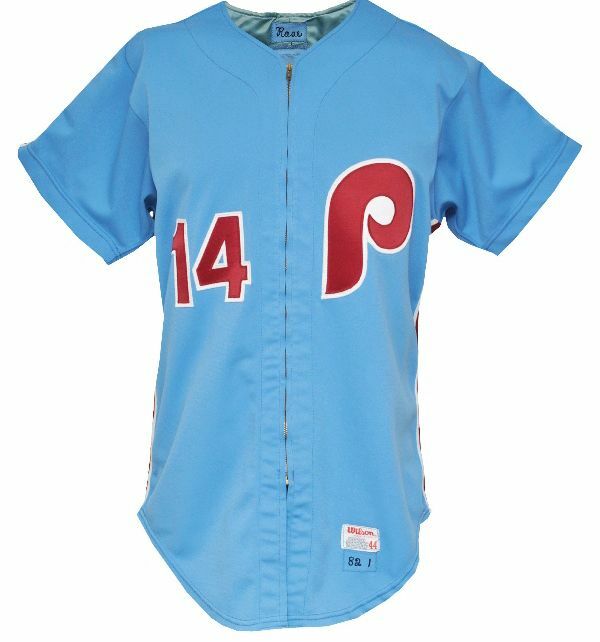 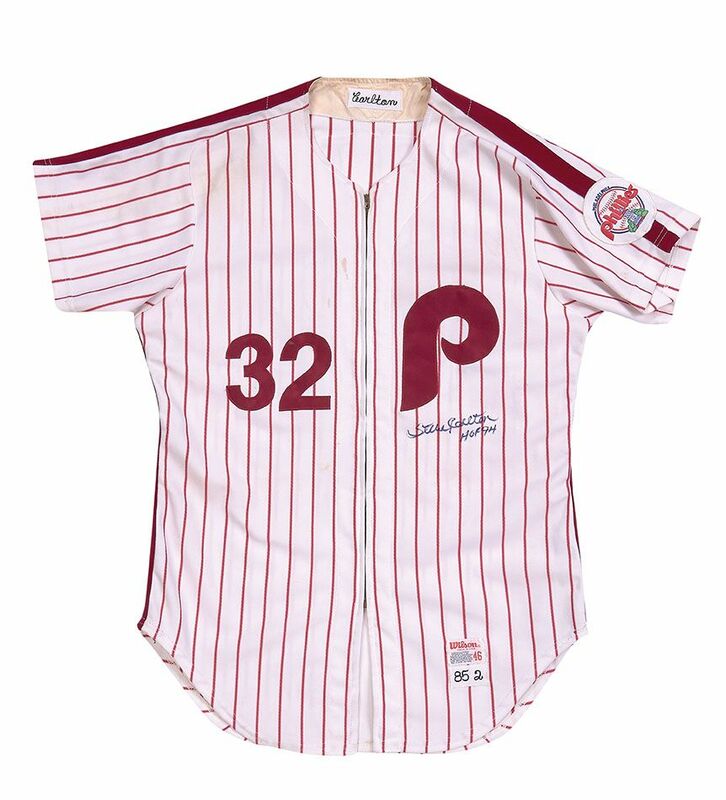 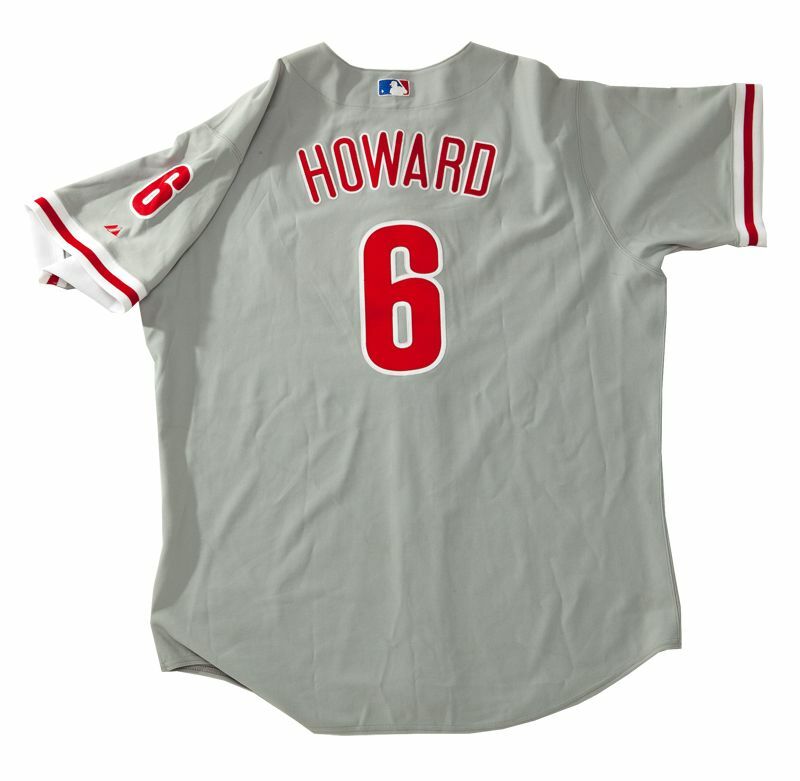 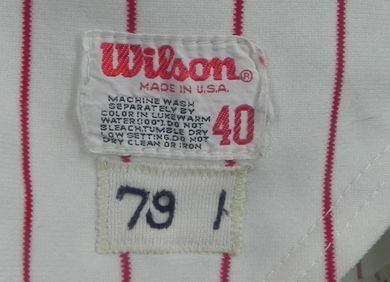 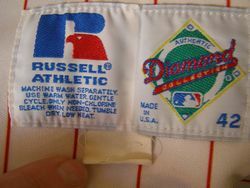 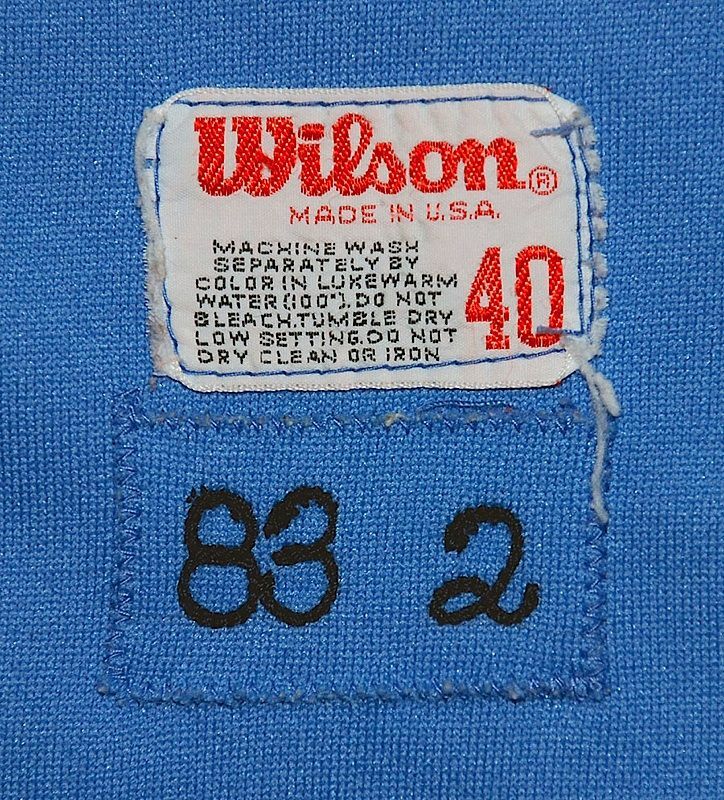 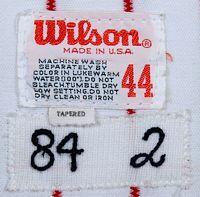 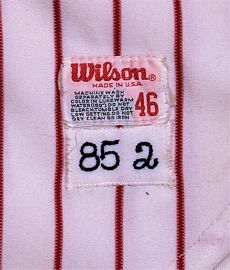 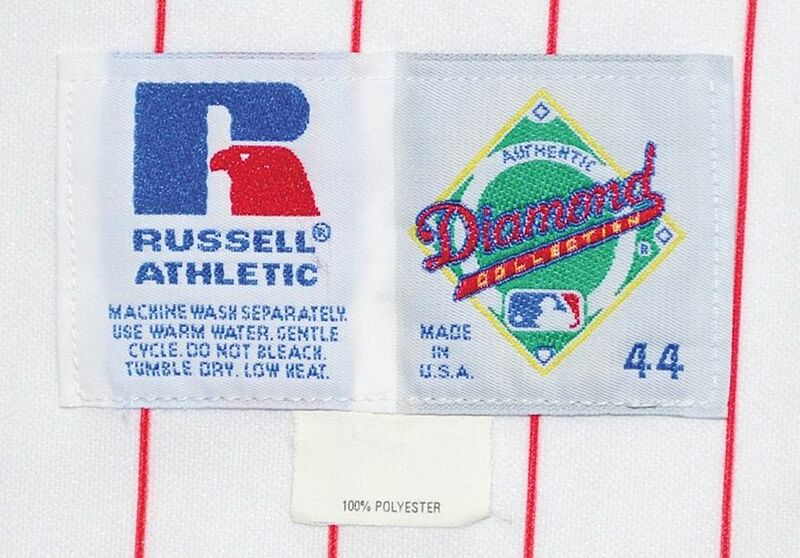 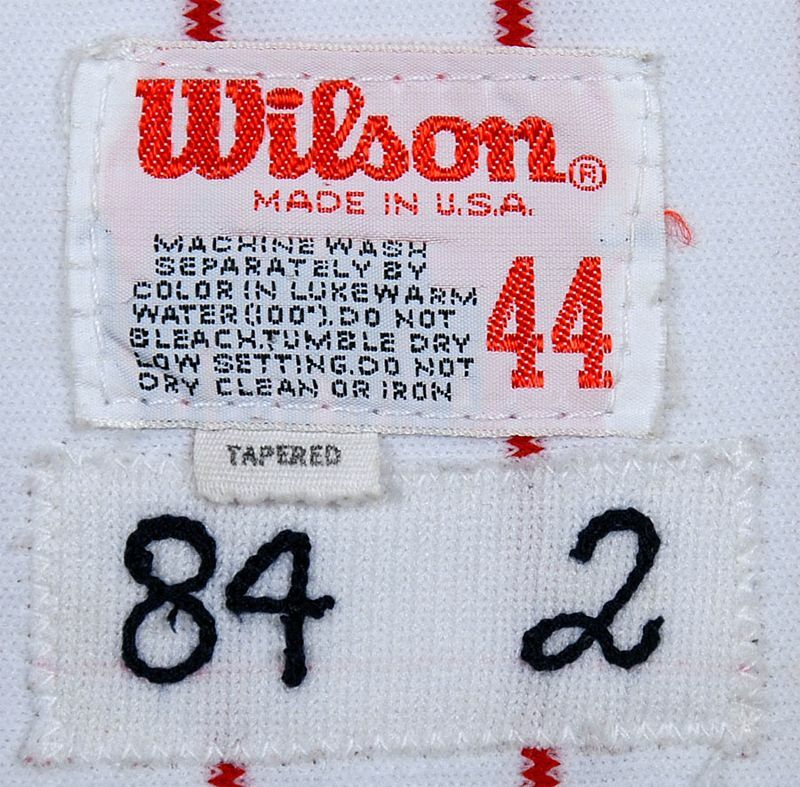 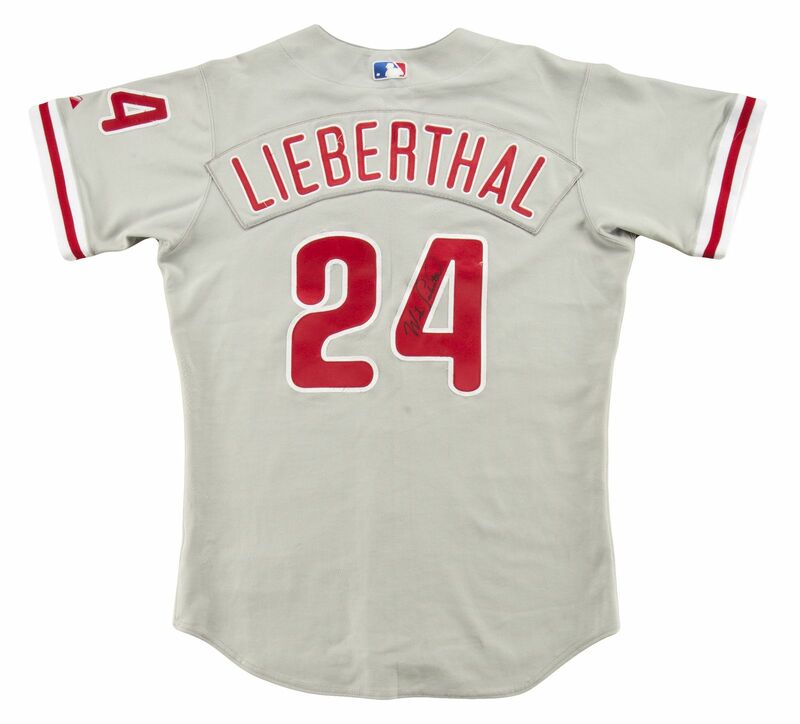 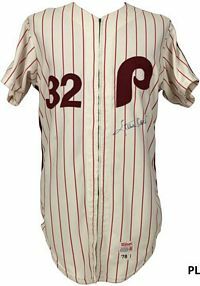 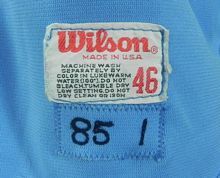 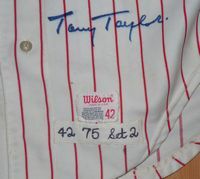 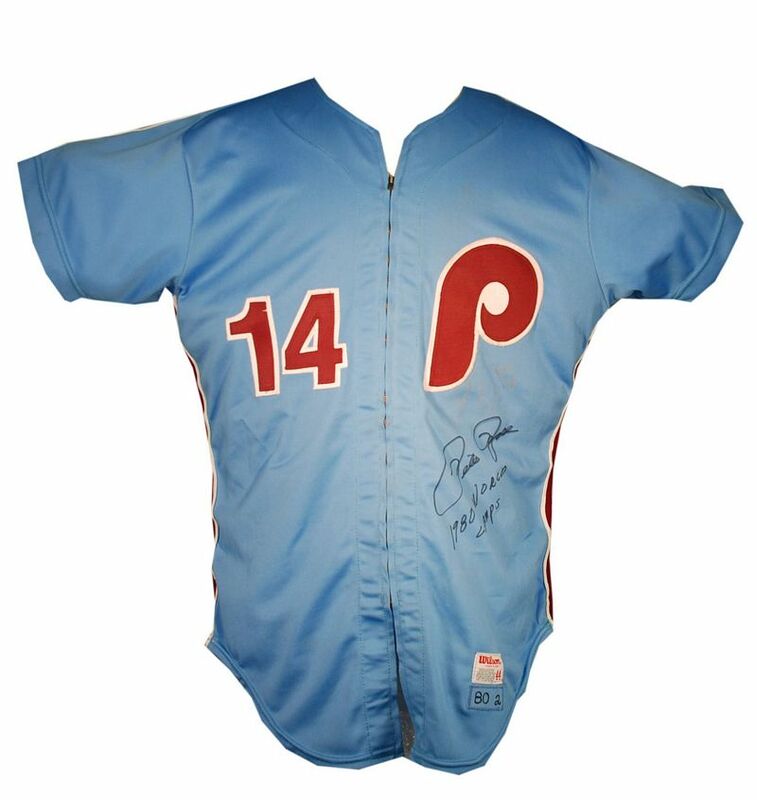 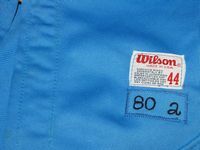 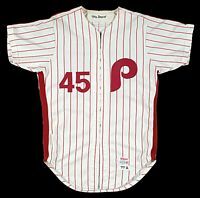 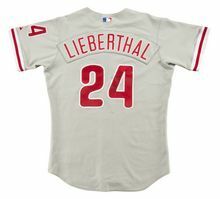 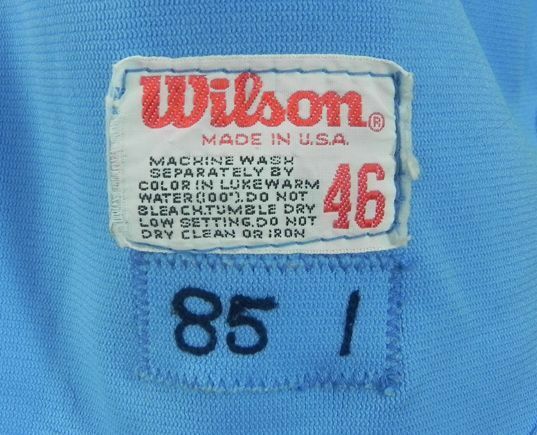 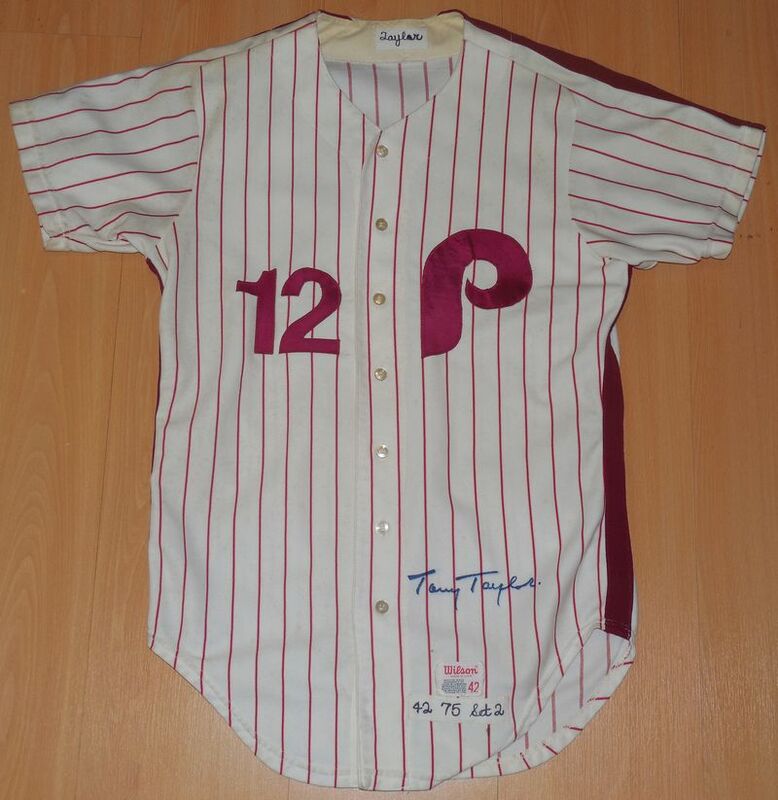 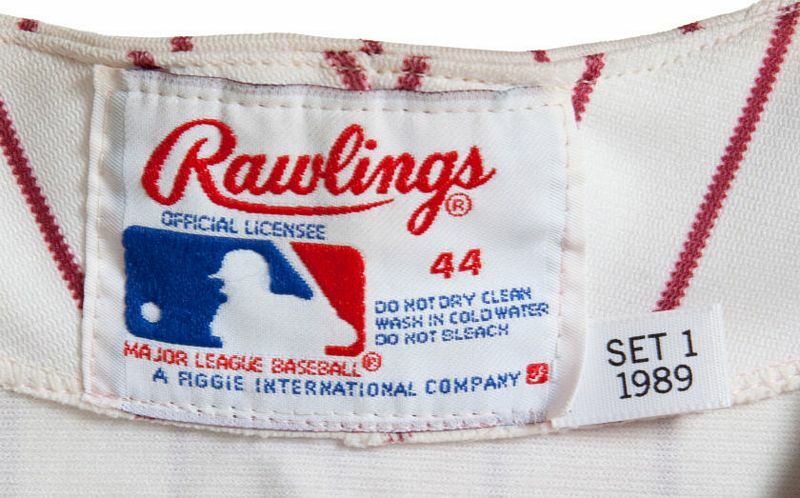 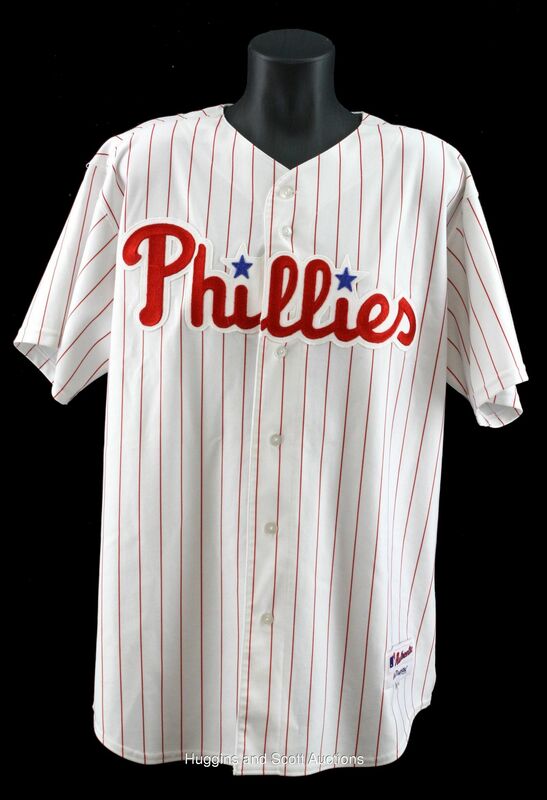 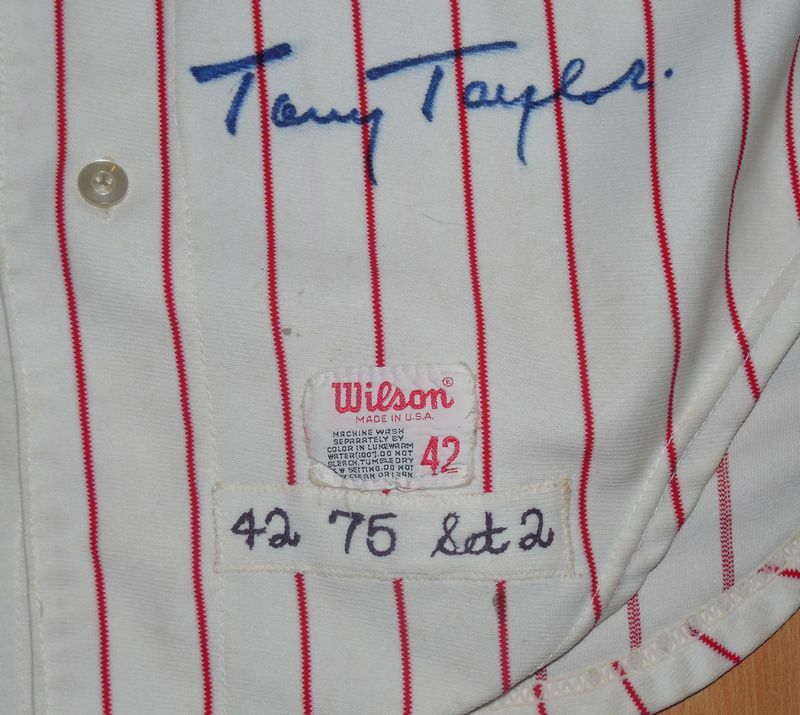 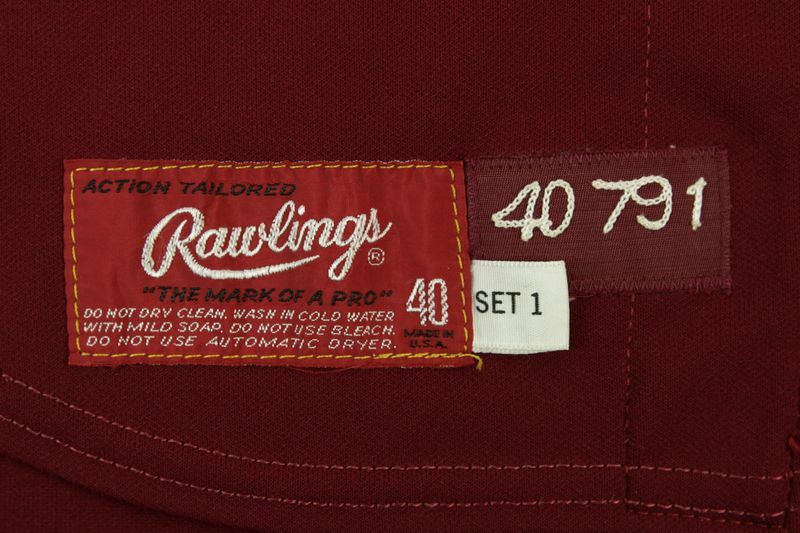 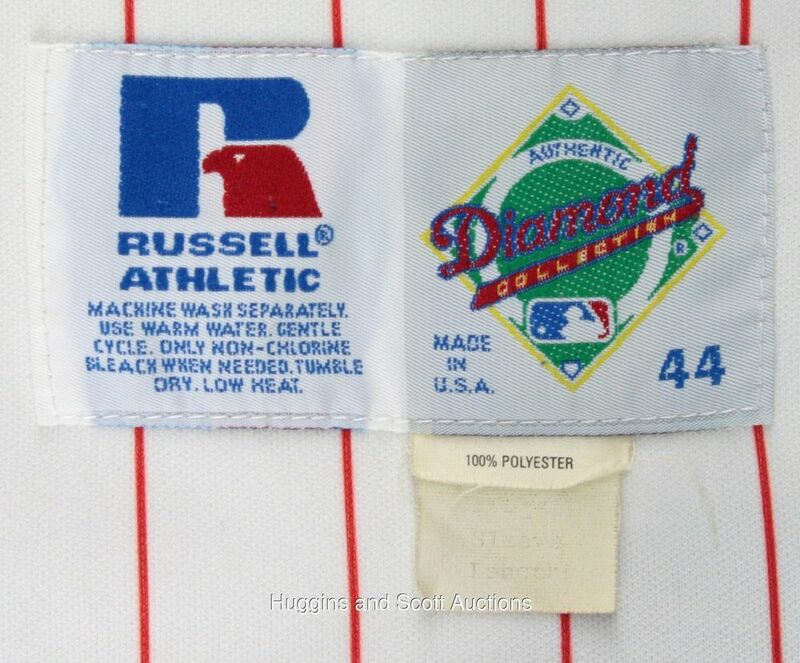 Button-downs appear as the Phillies are the last team to drop zippers. 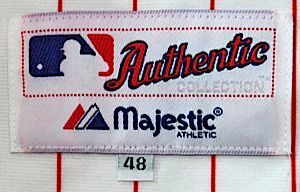 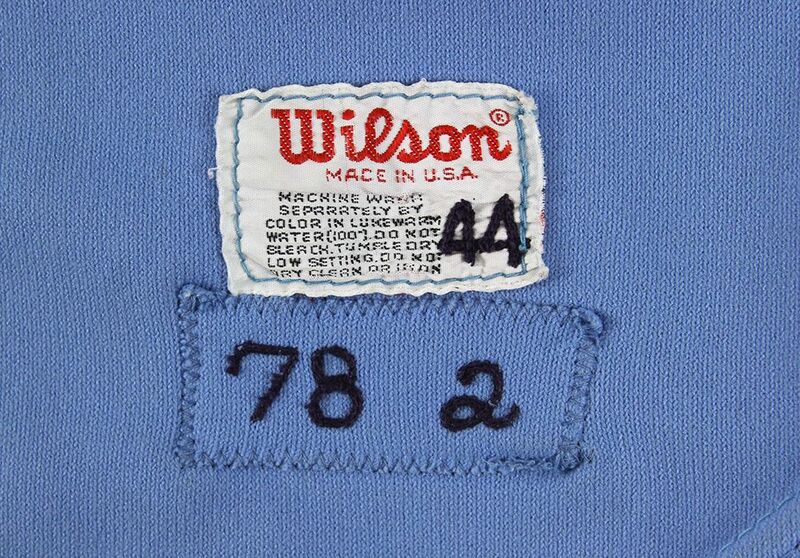 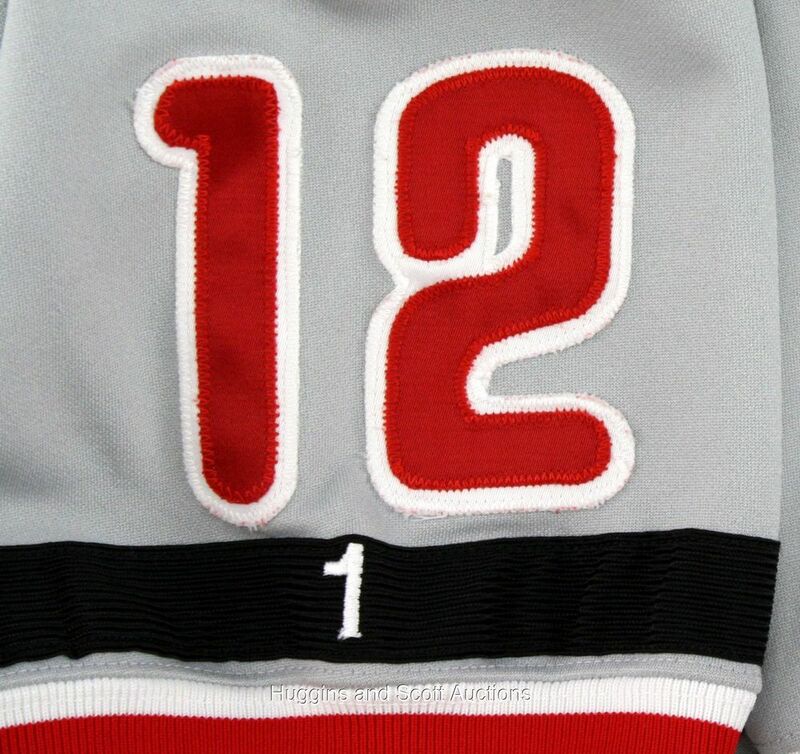 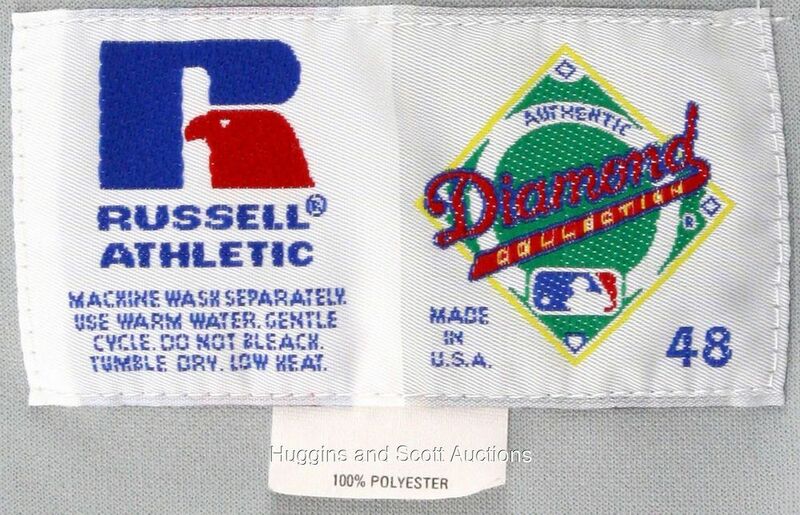 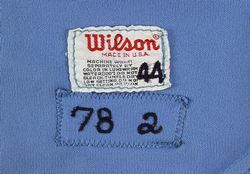 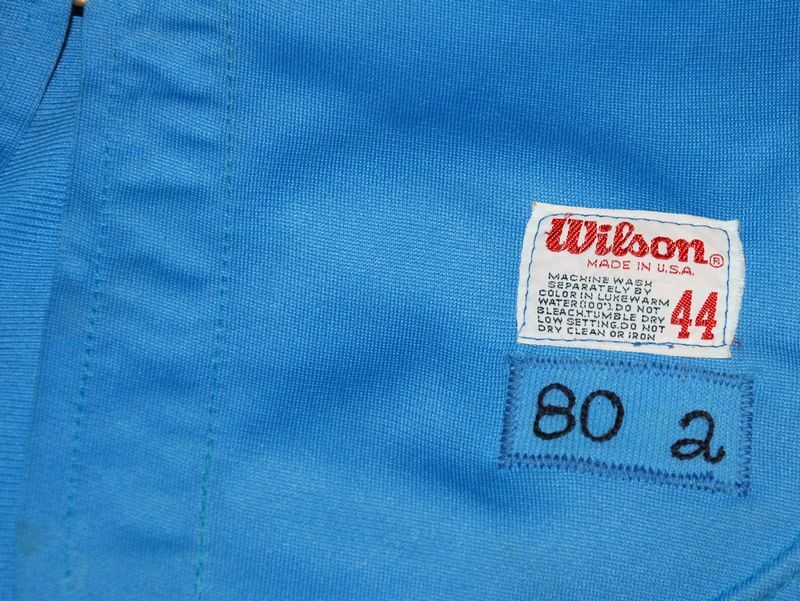 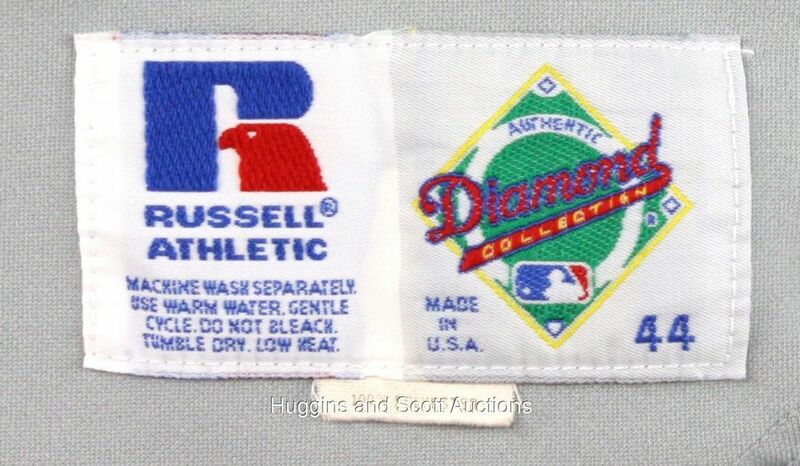 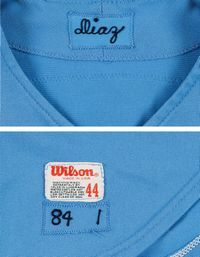 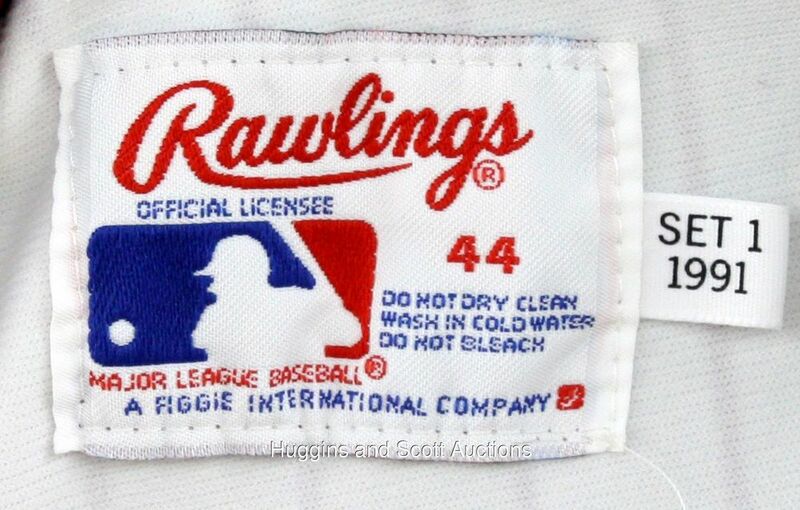 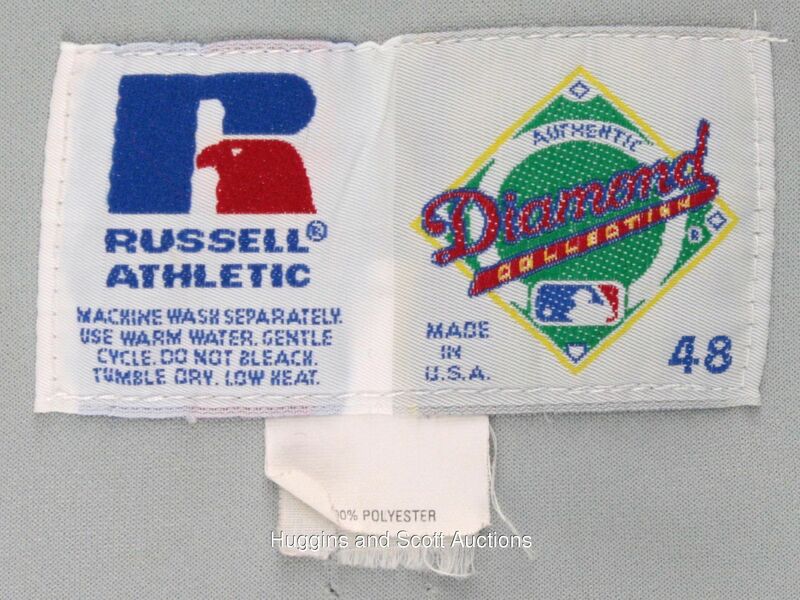 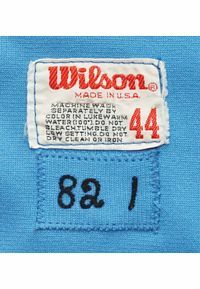 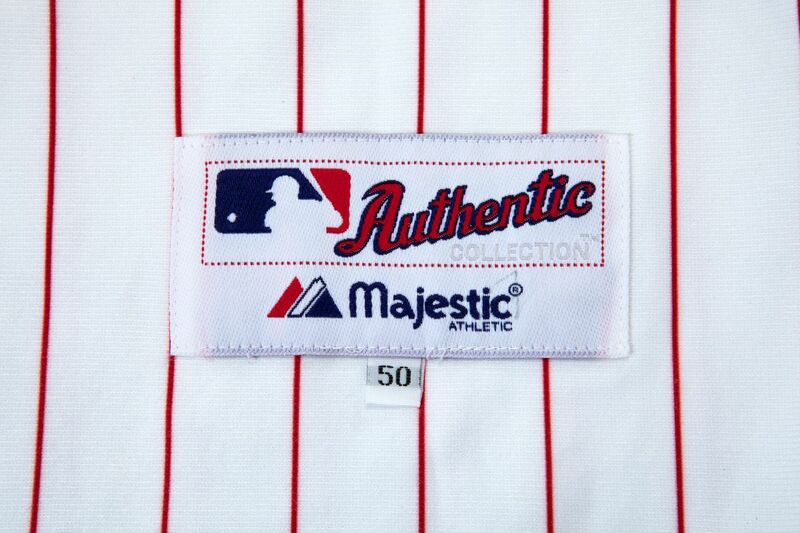 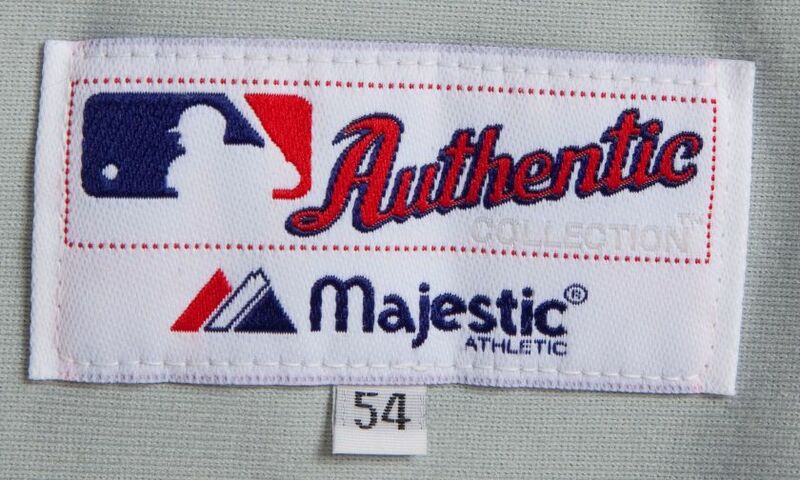 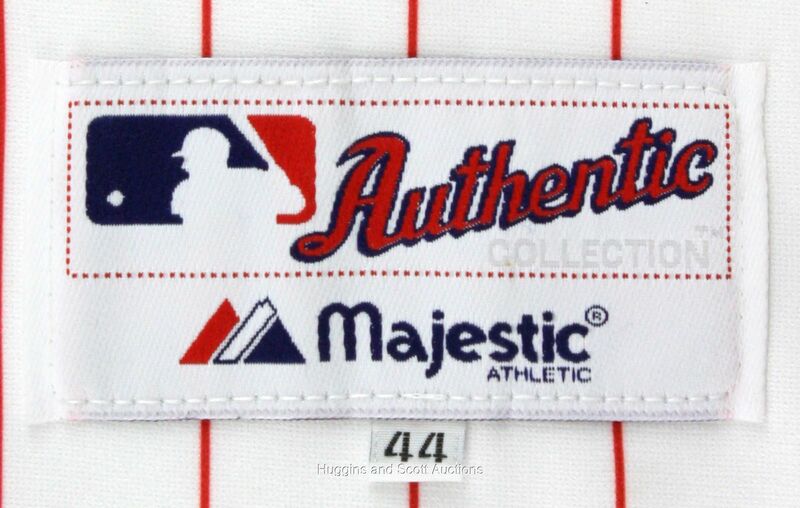 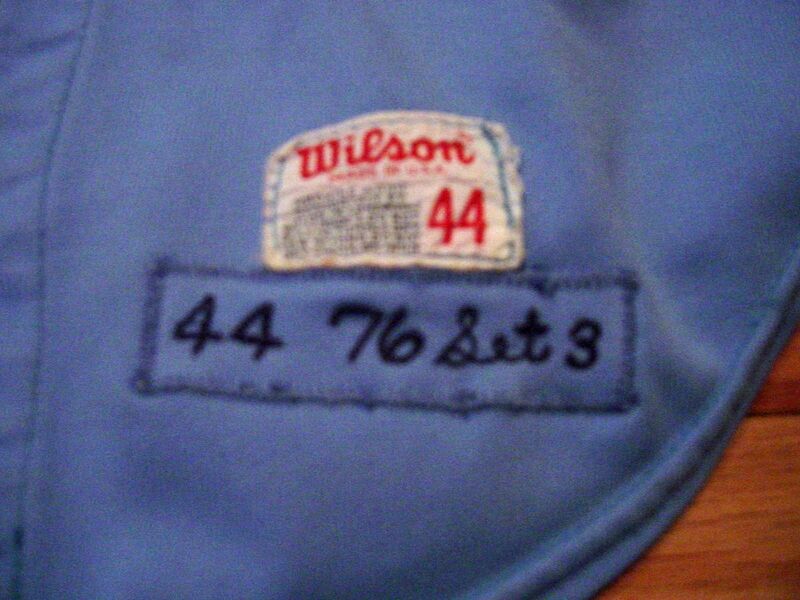 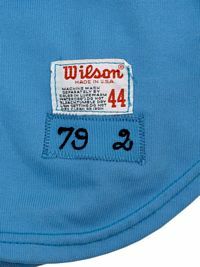 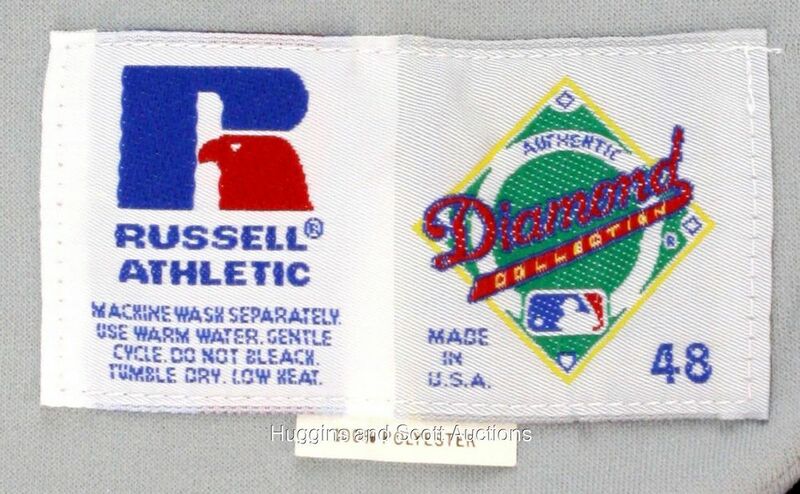 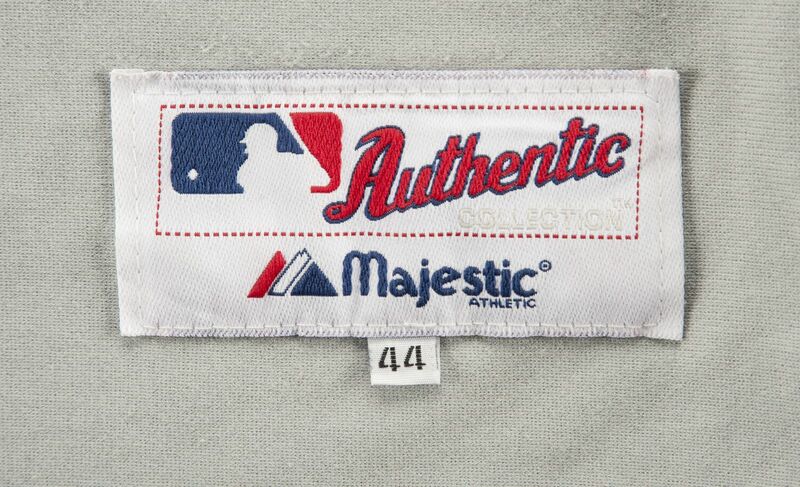 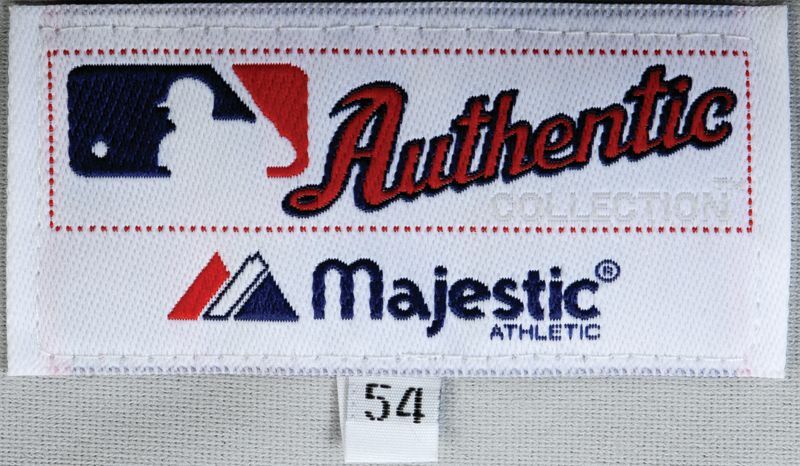 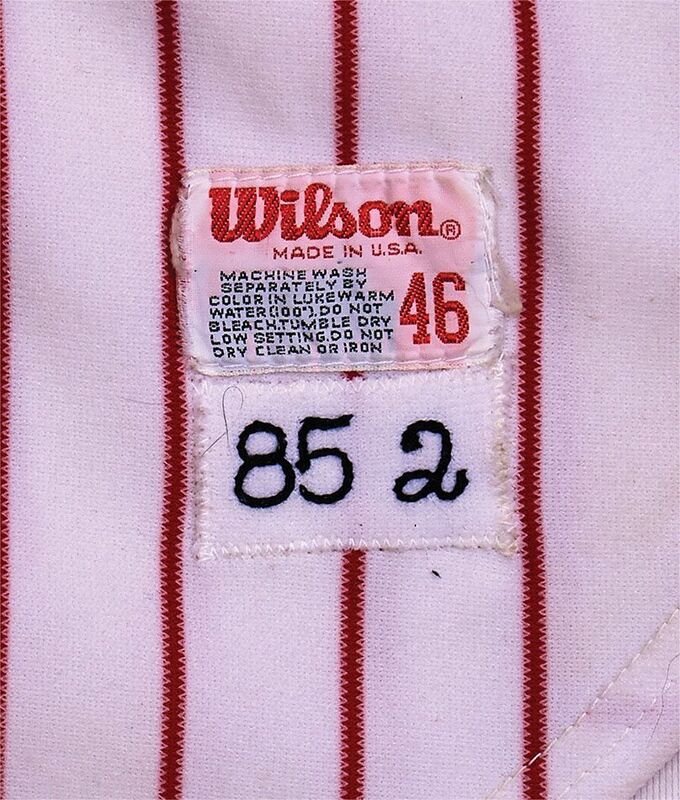 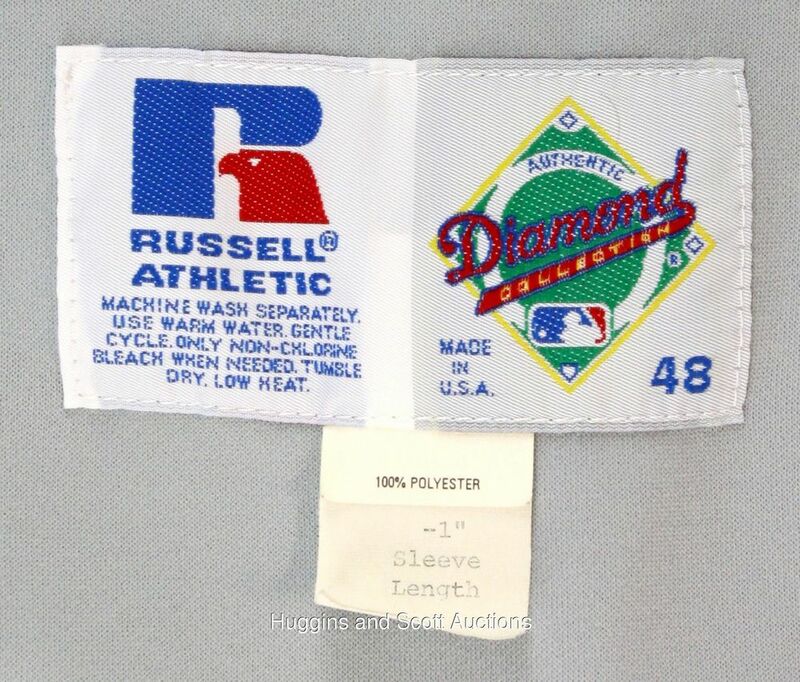 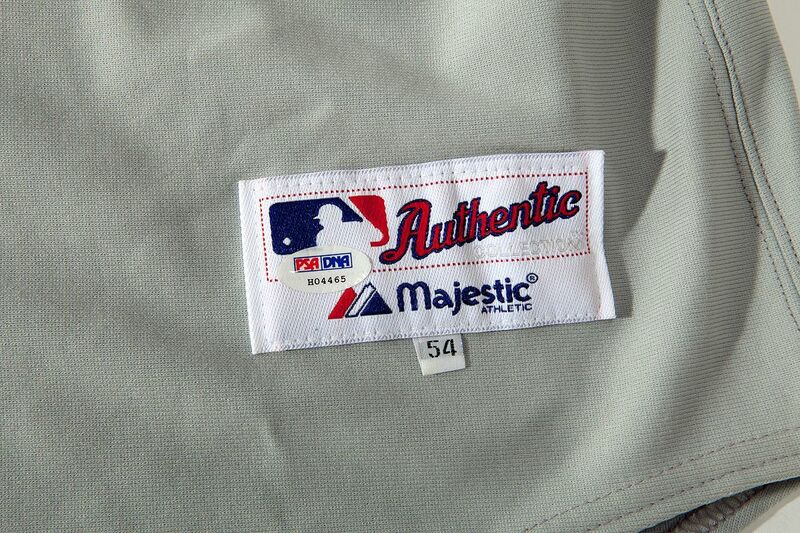 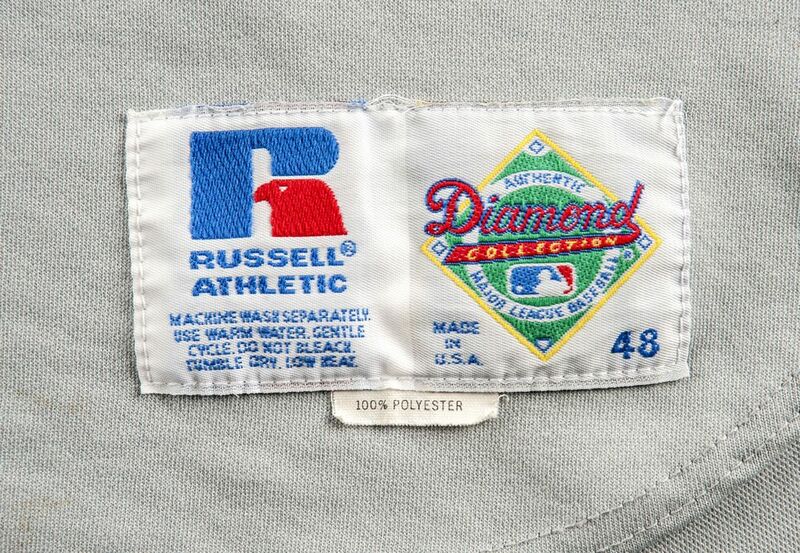 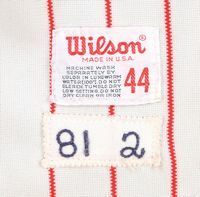 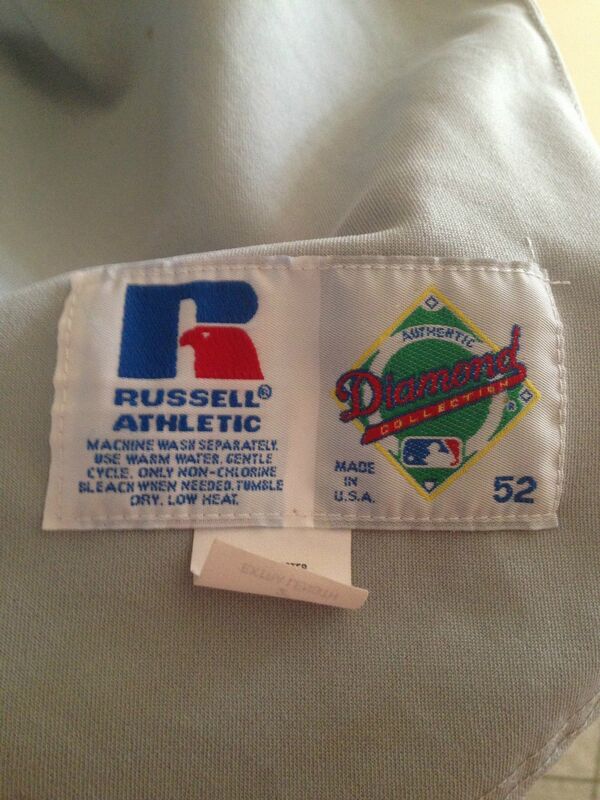 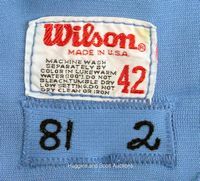 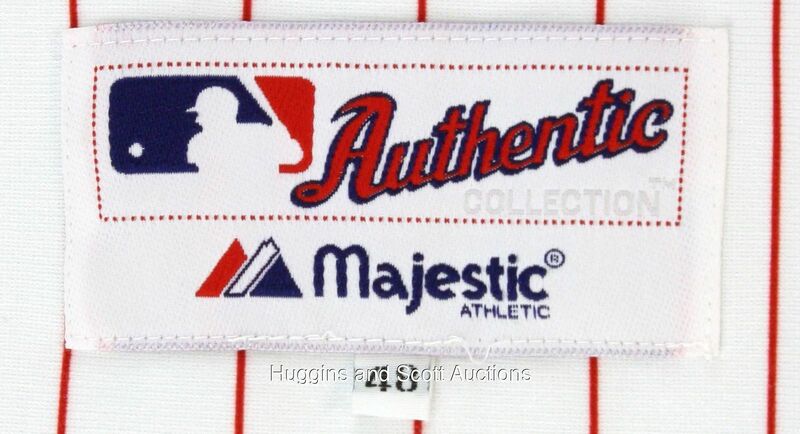 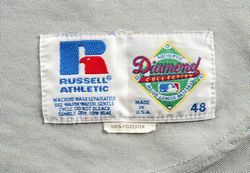 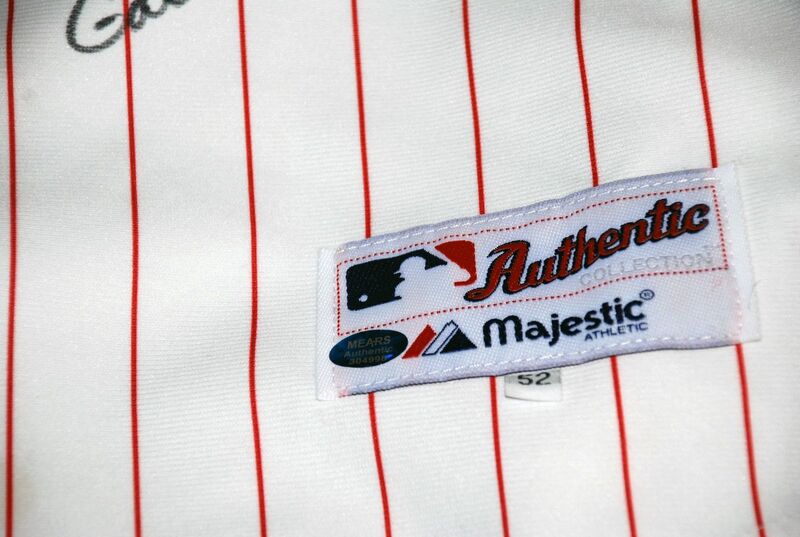 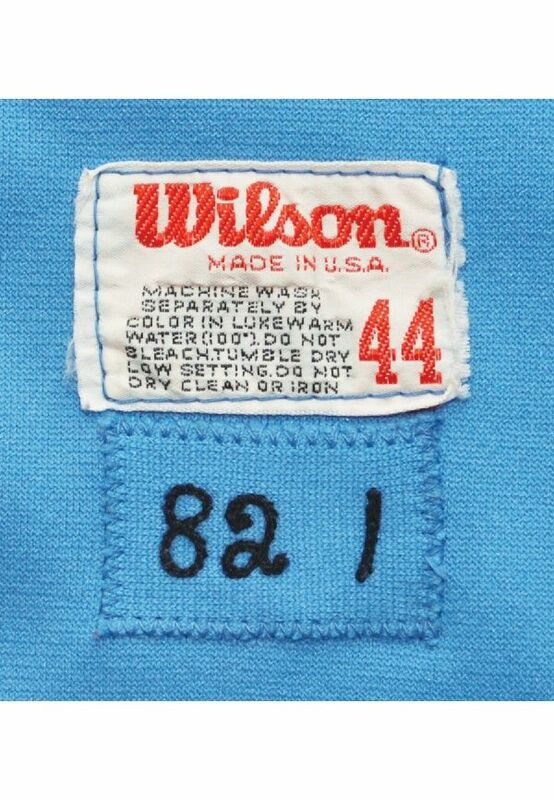 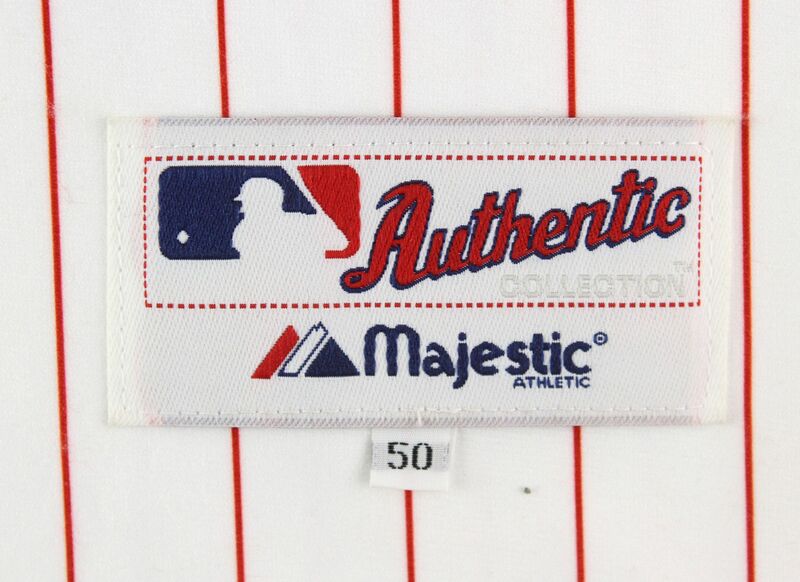 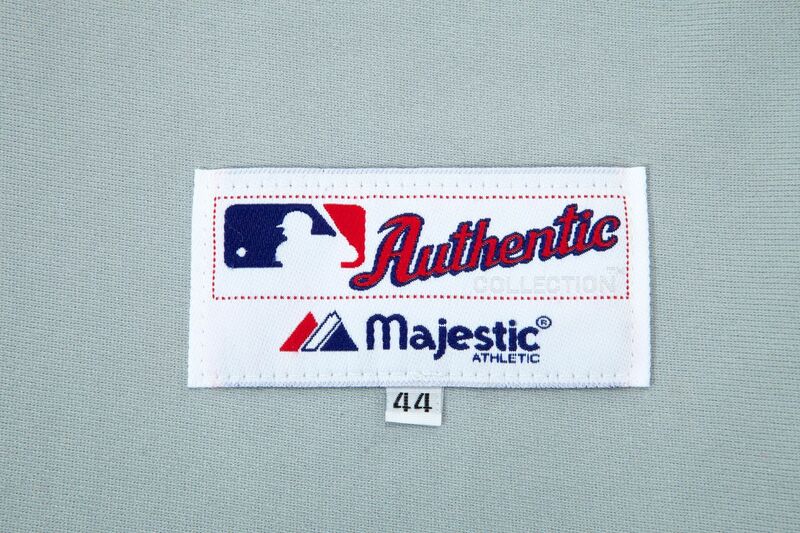 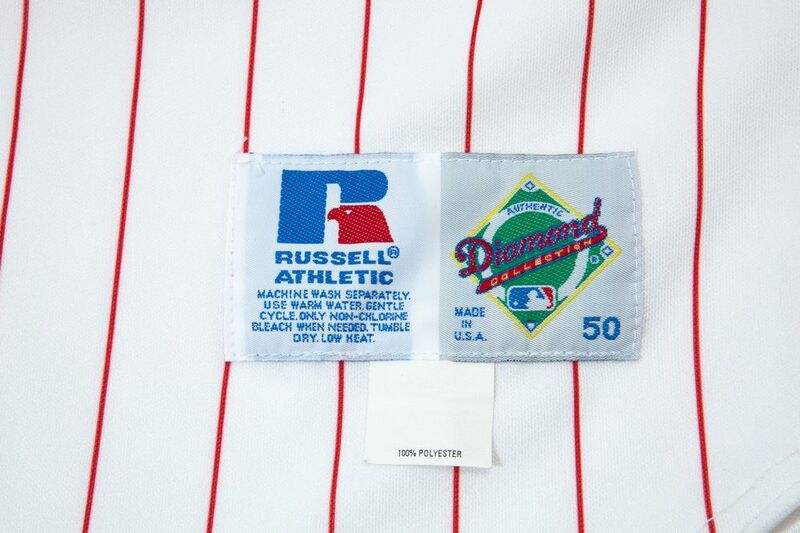 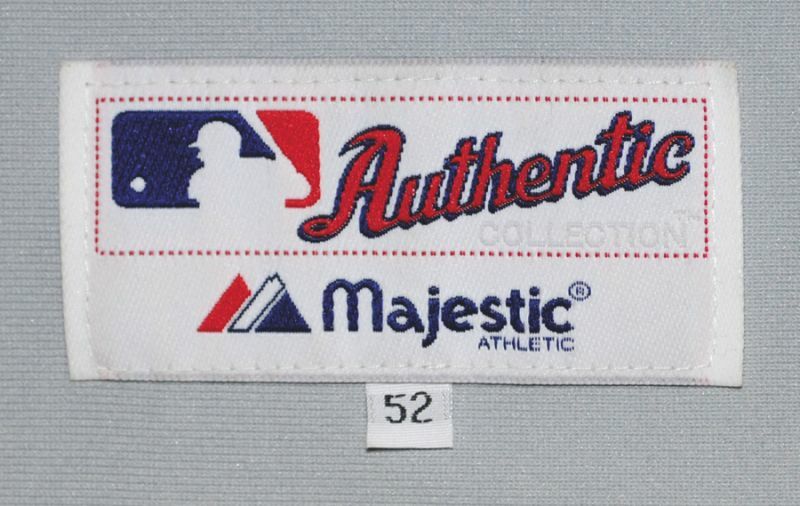 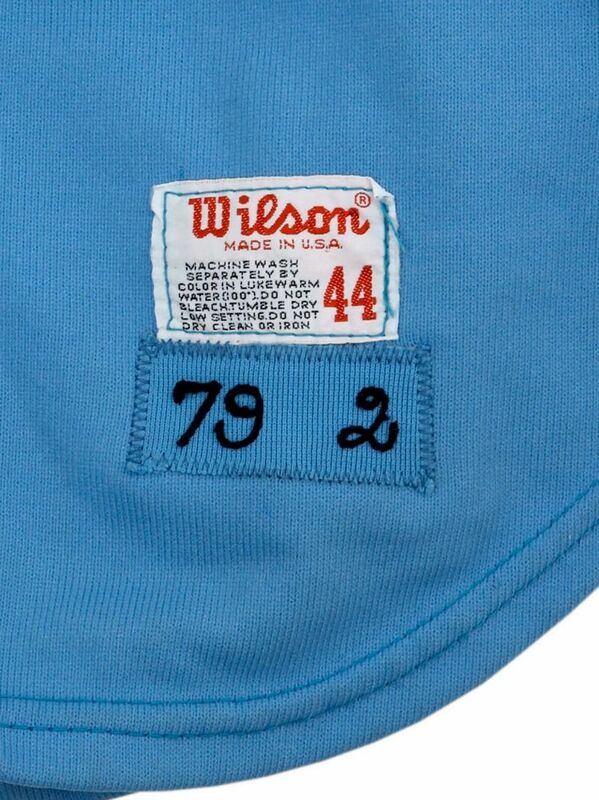 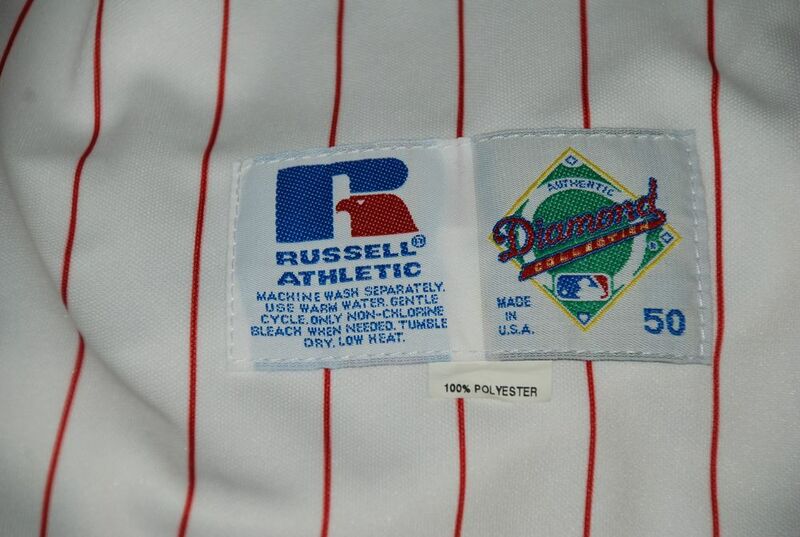 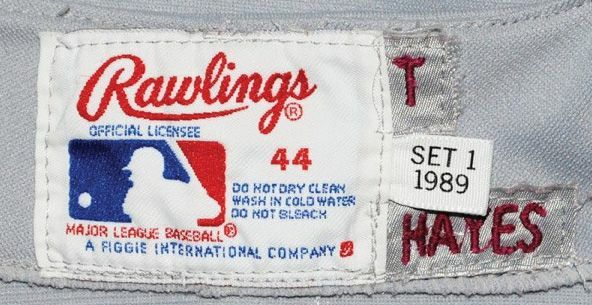 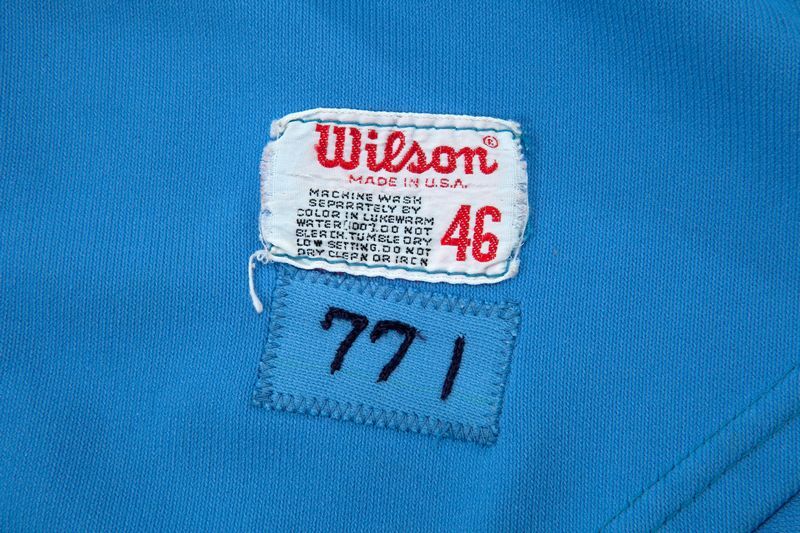 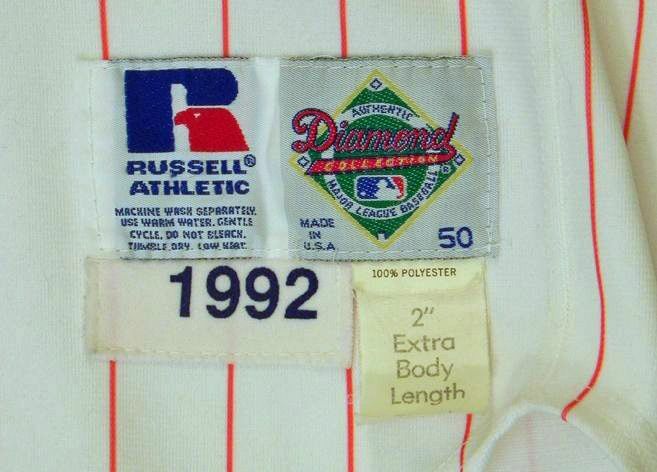 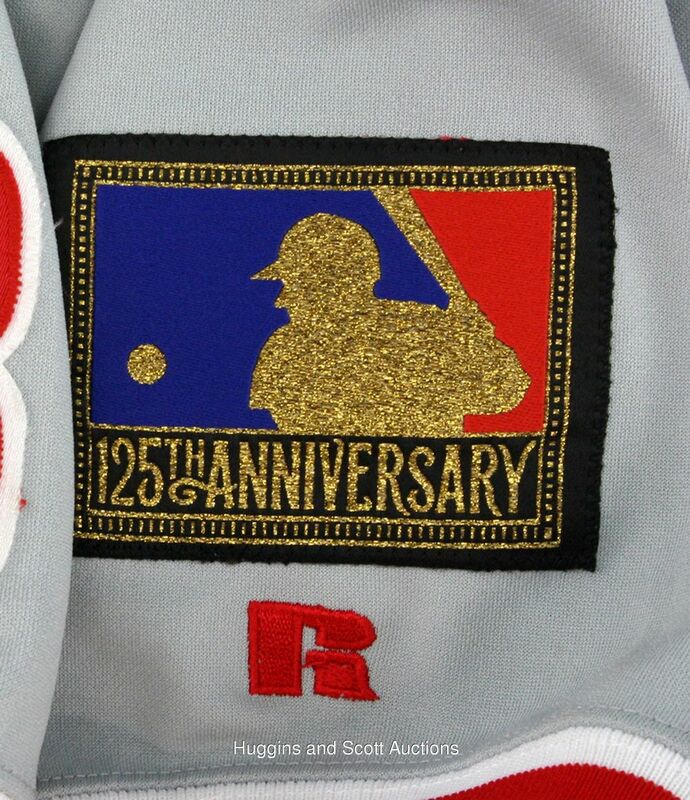 The "baseball stitch" line in the logo returns. 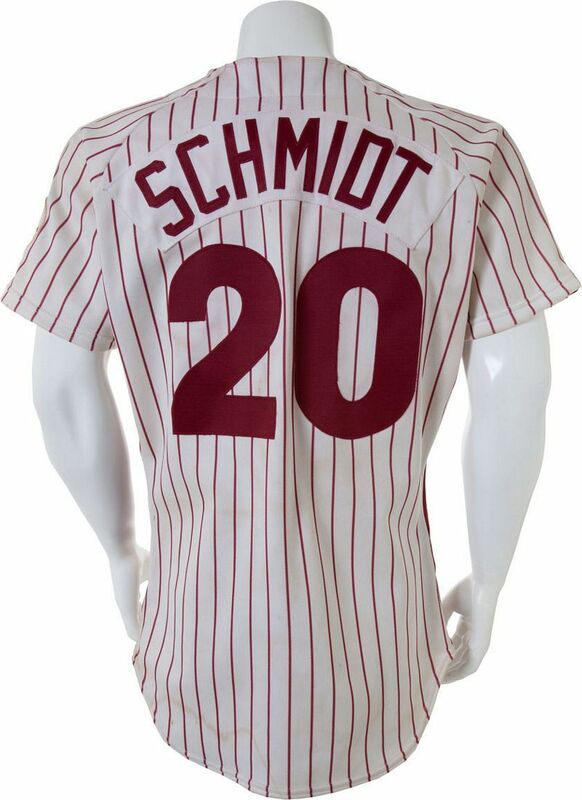 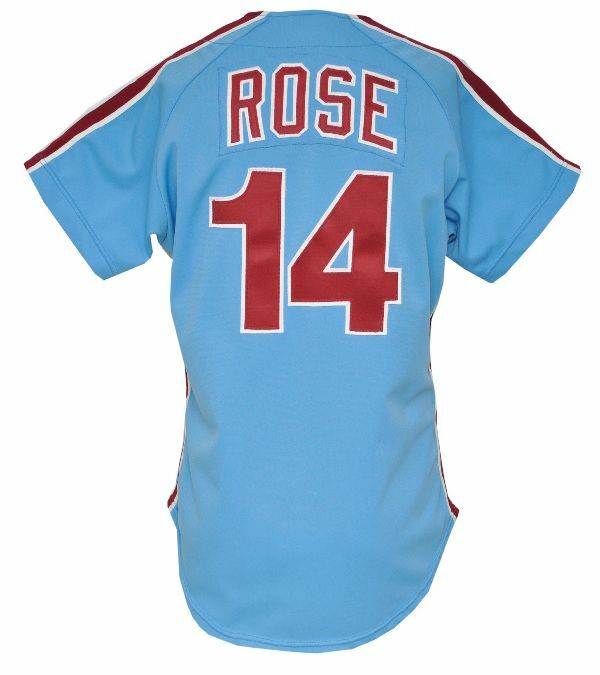 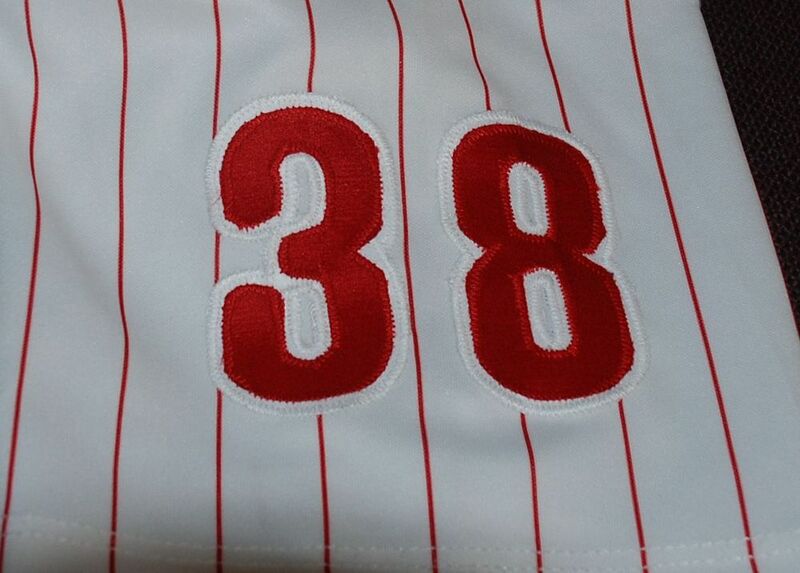 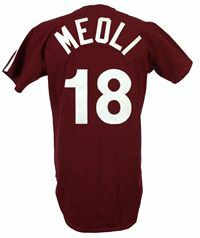 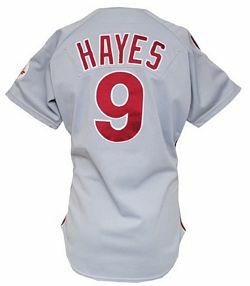 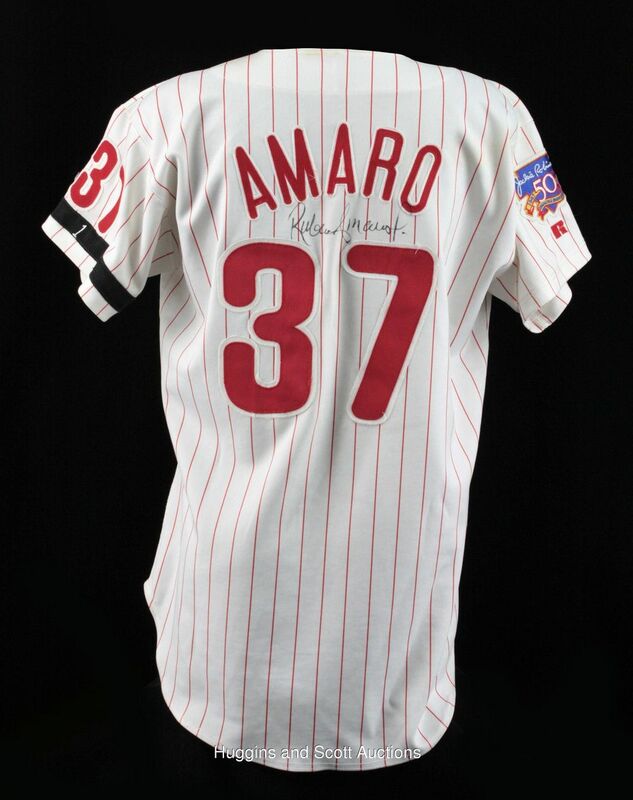 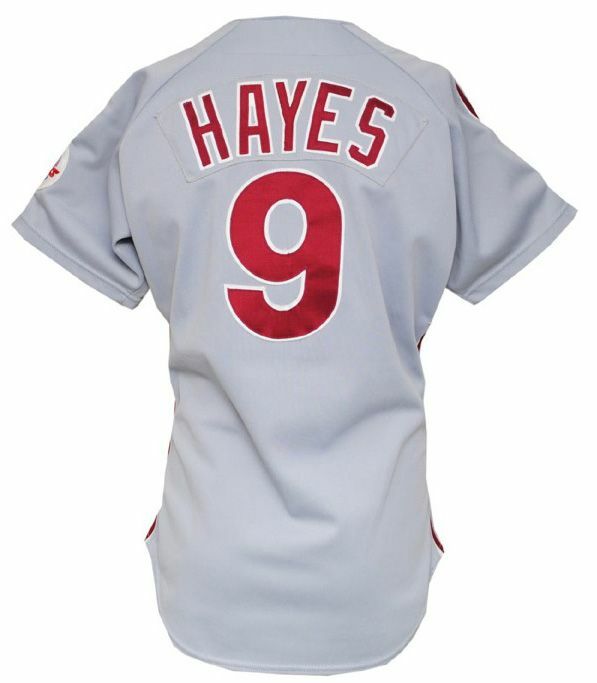 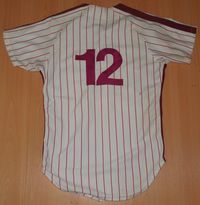 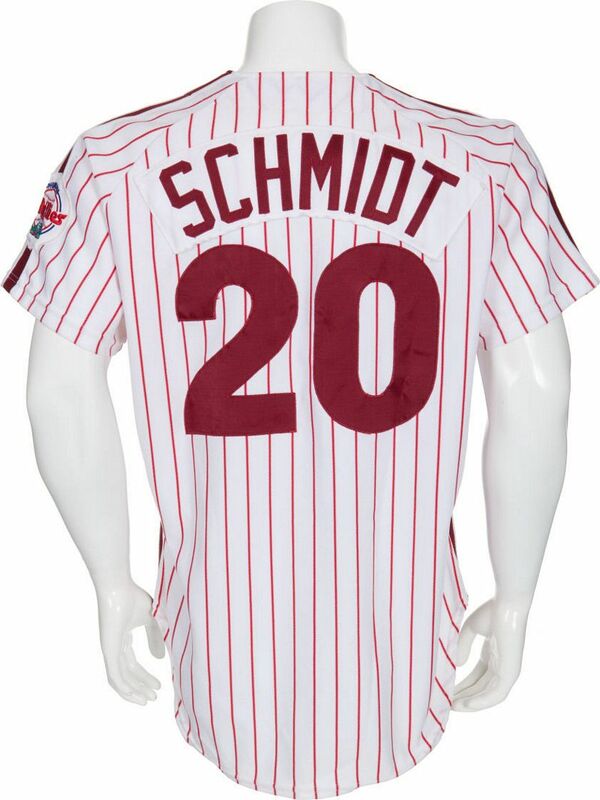 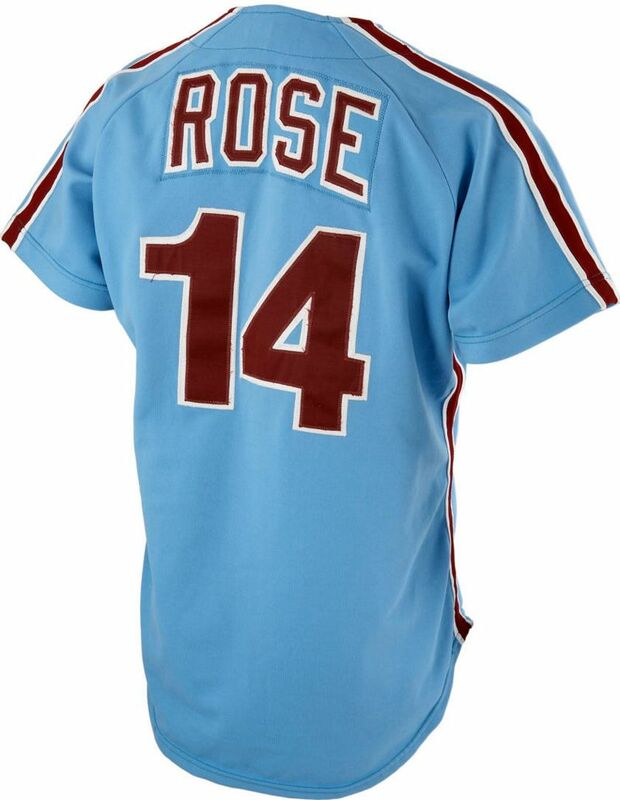 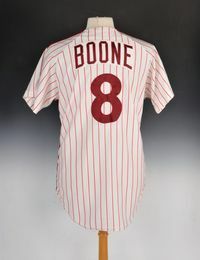 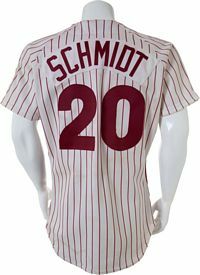 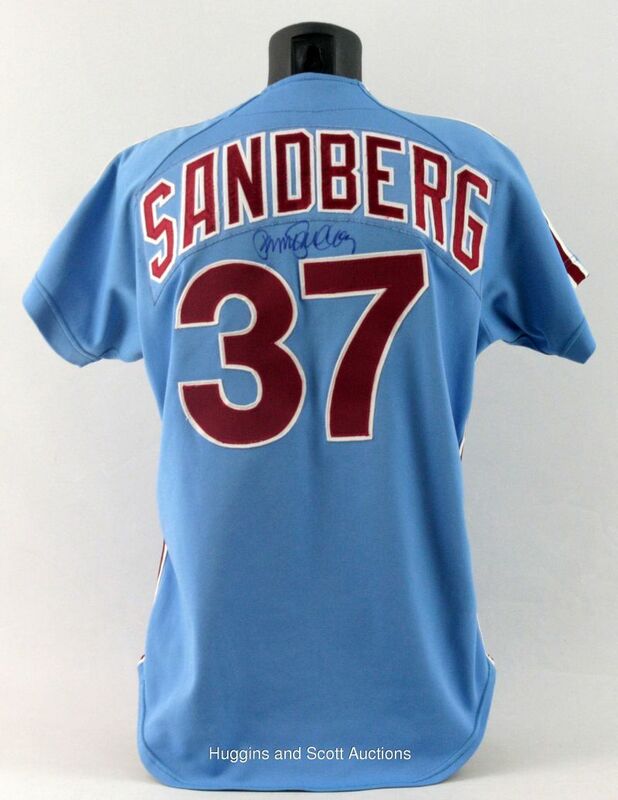 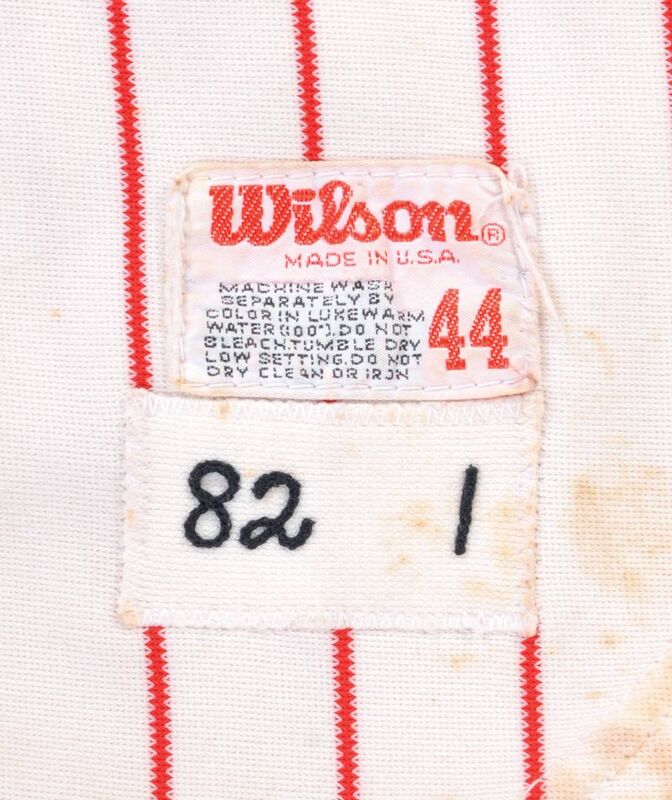 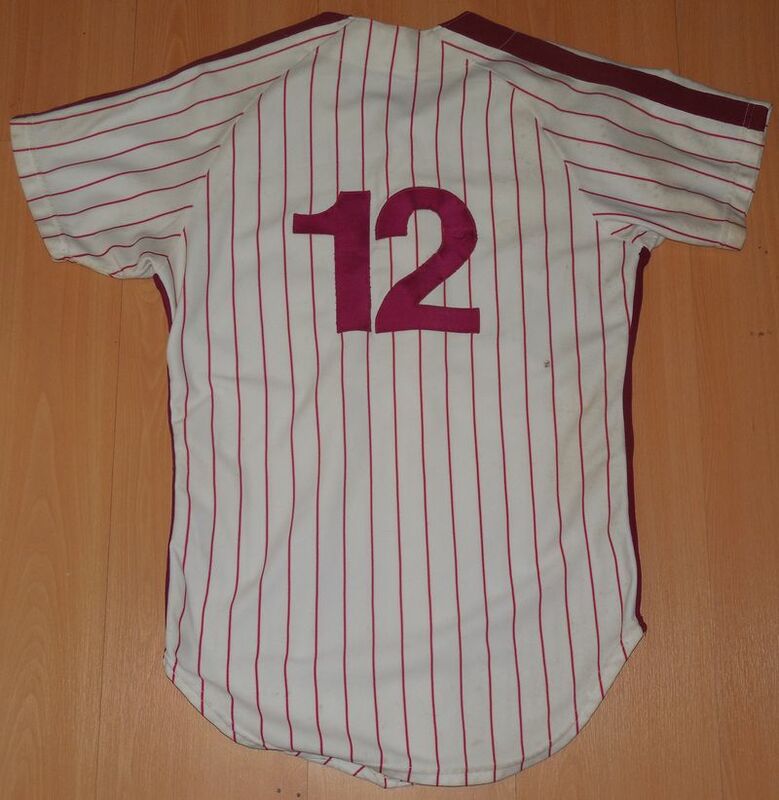 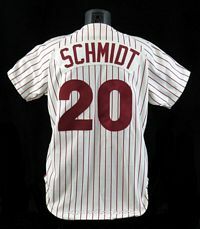 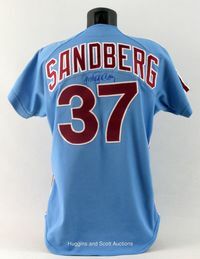 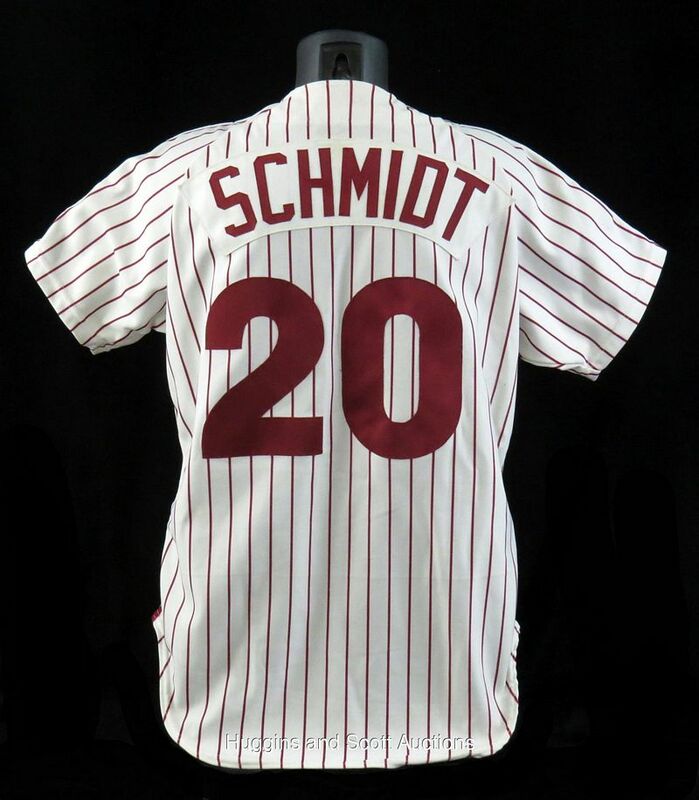 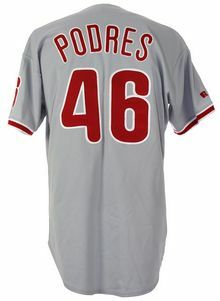 On home jerseys, the pinstripe color changes from red to maroon, matching the lettering. Powder blue roadies dumped in favor of grey. The team returns to a style influenced by the 1950-70 look. 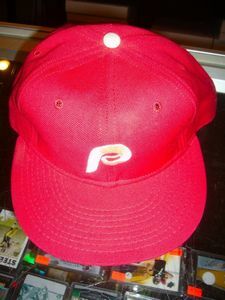 The color changes back to red. 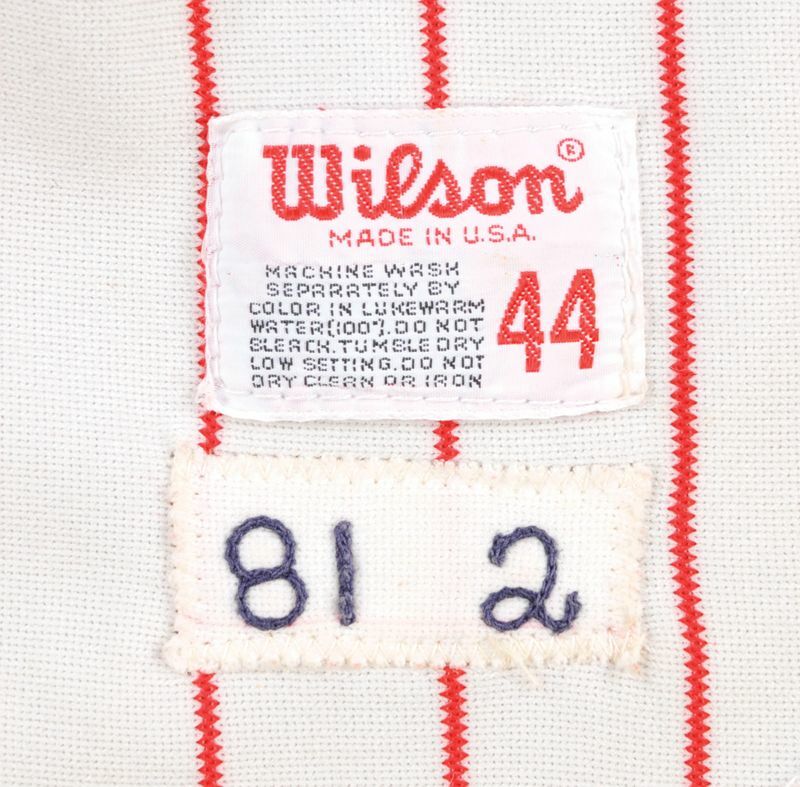 Front lettering returns to chain-stitched. 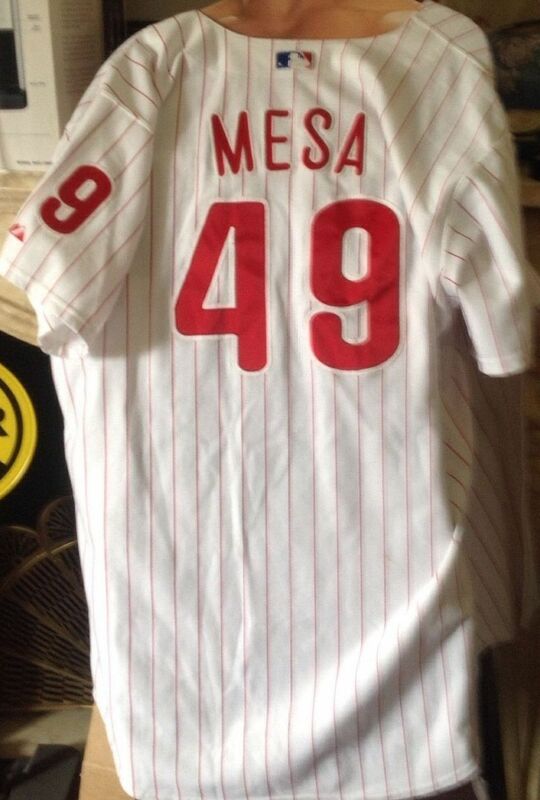 Nameplates are gone. 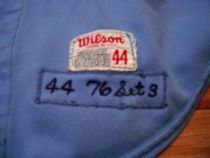 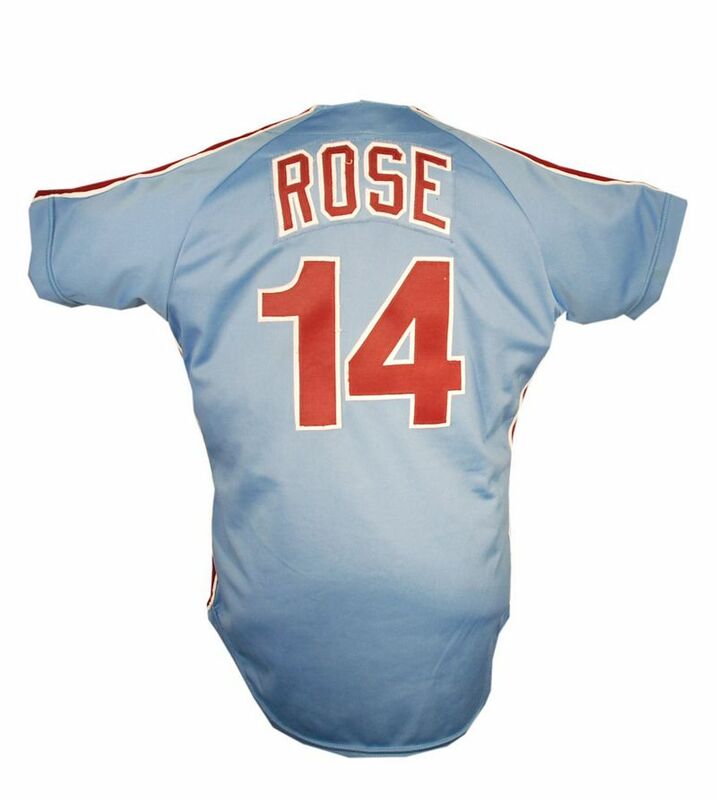 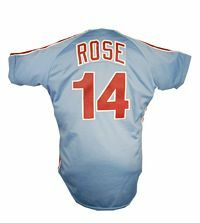 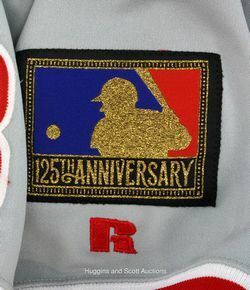 A blue cap worn on occasion both home and road in 1994, and MLB 125th anniversary patch worn on sleeve. 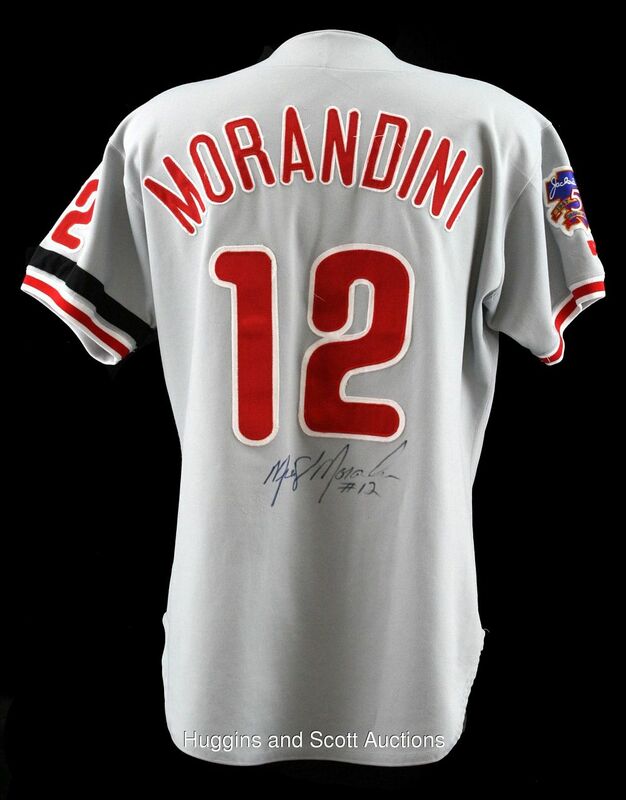 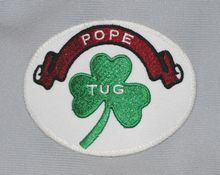 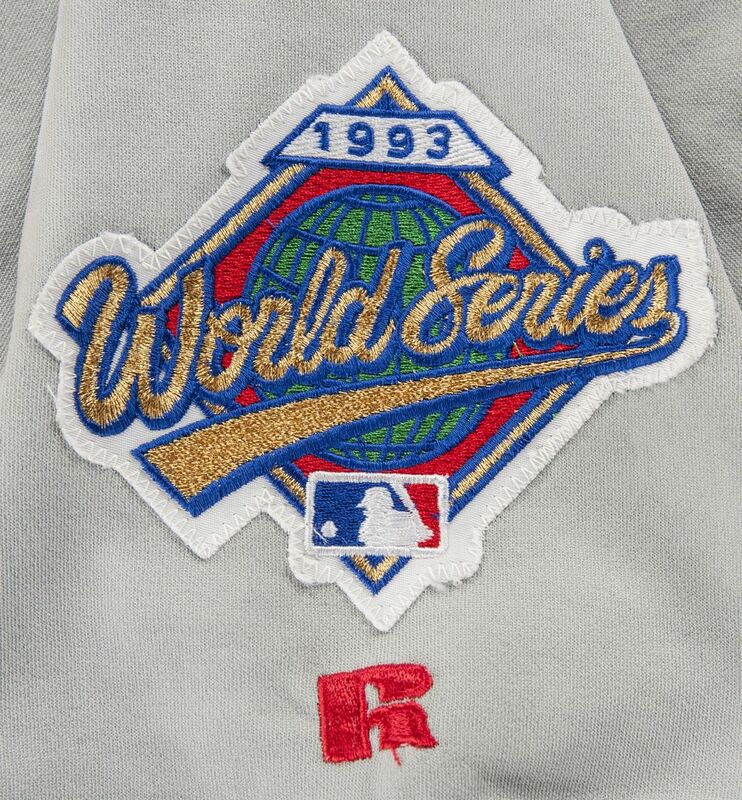 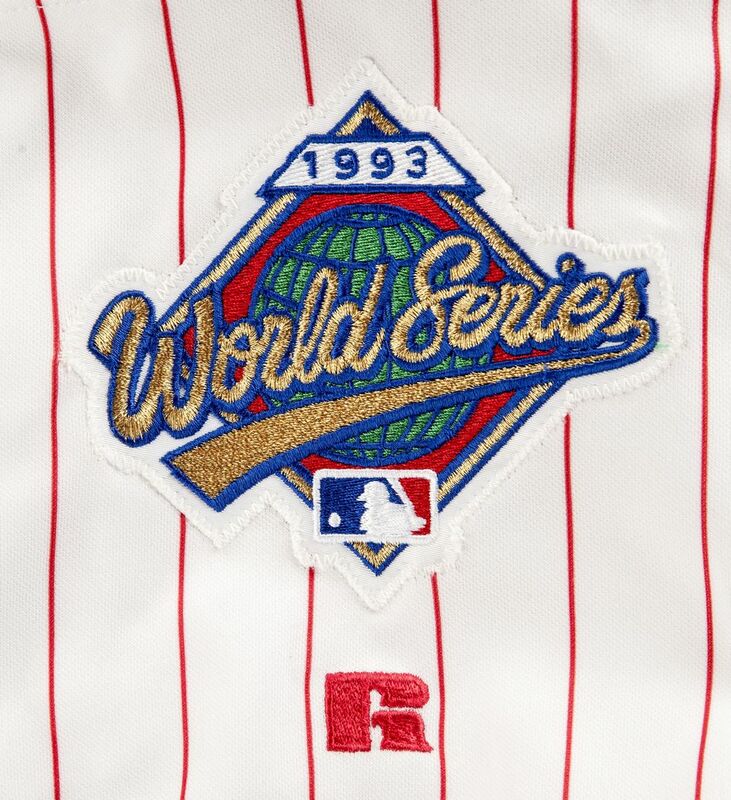 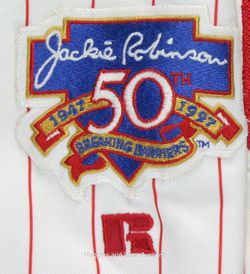 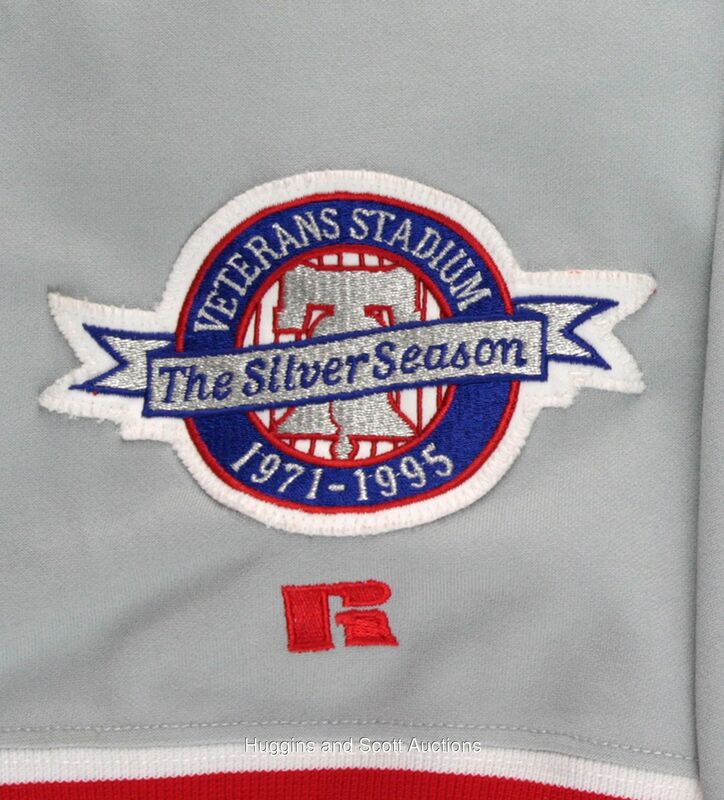 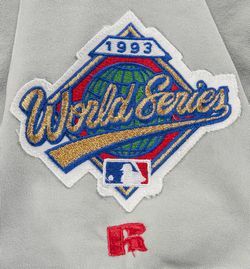 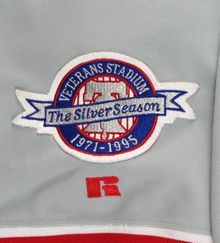 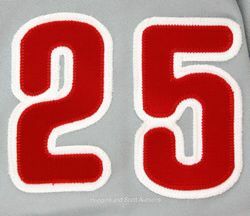 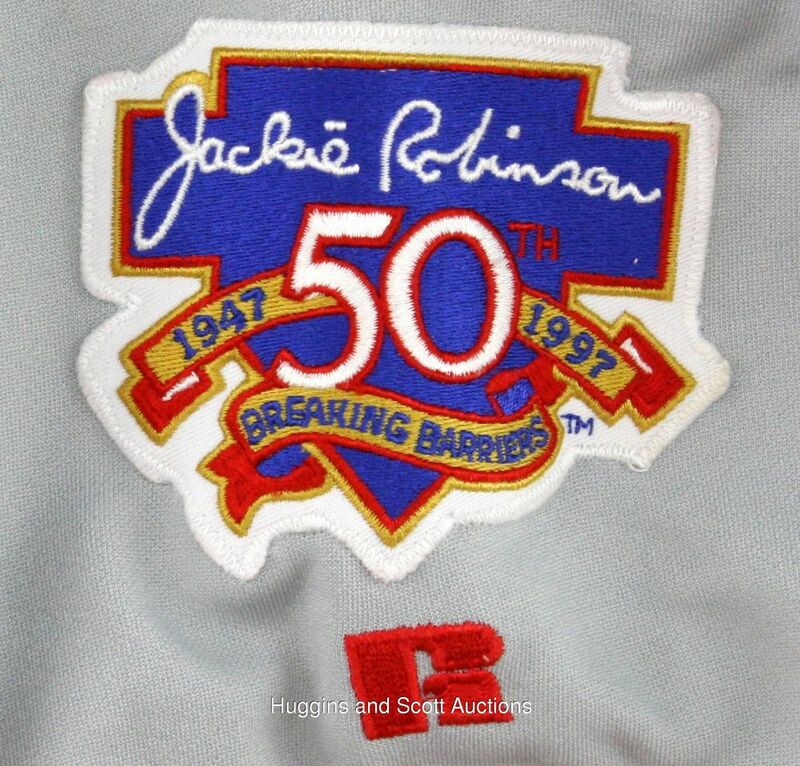 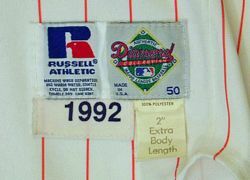 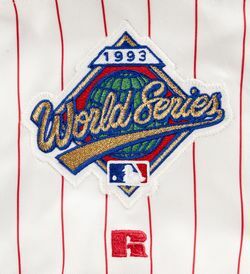 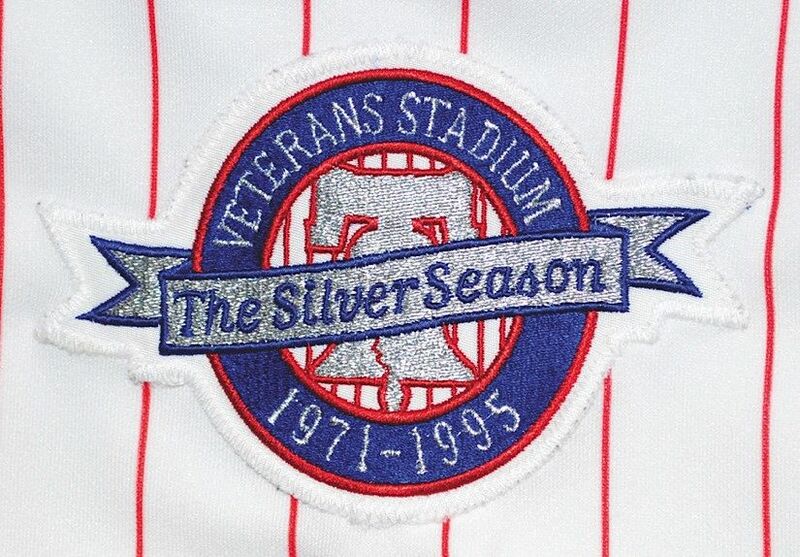 Veterans Stadium anniversary patch worn in 1995. 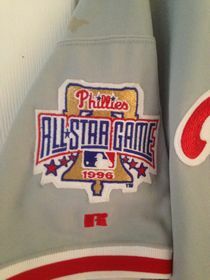 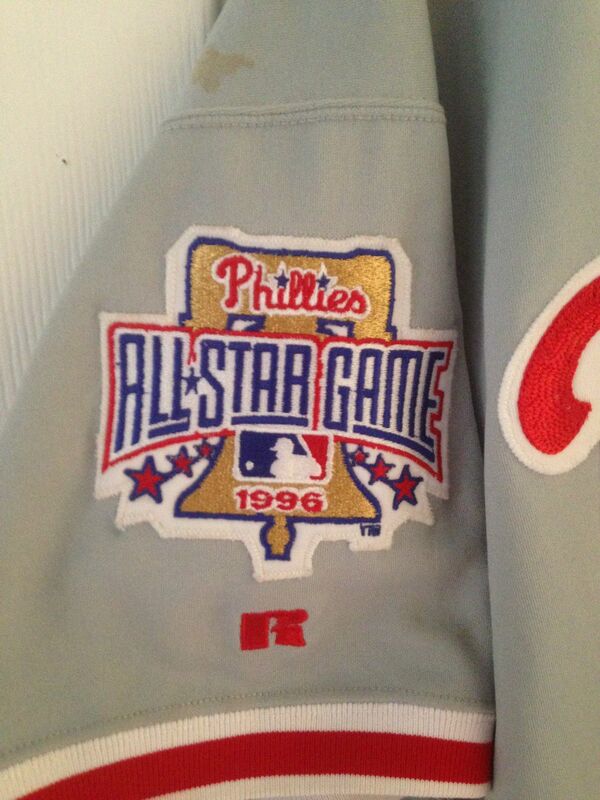 All Star game patch worn in 1996. 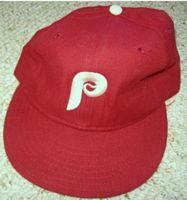 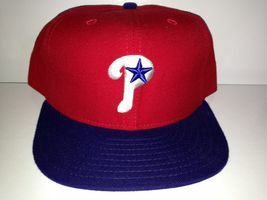 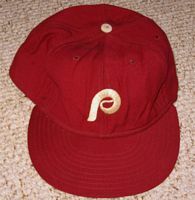 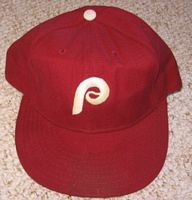 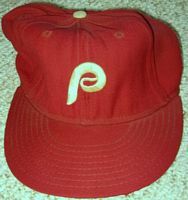 An alternate cap introduced in 1997 and worn only at home. 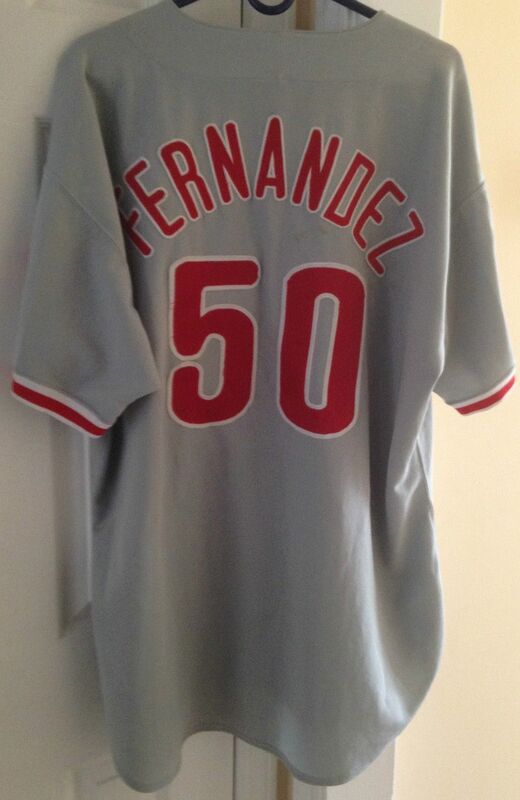 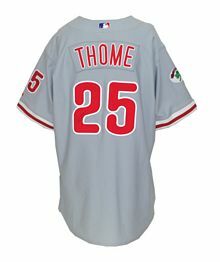 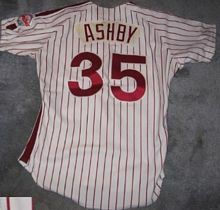 Nameplate now used for road jersey NOB. 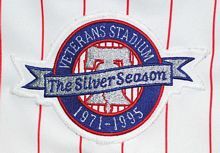 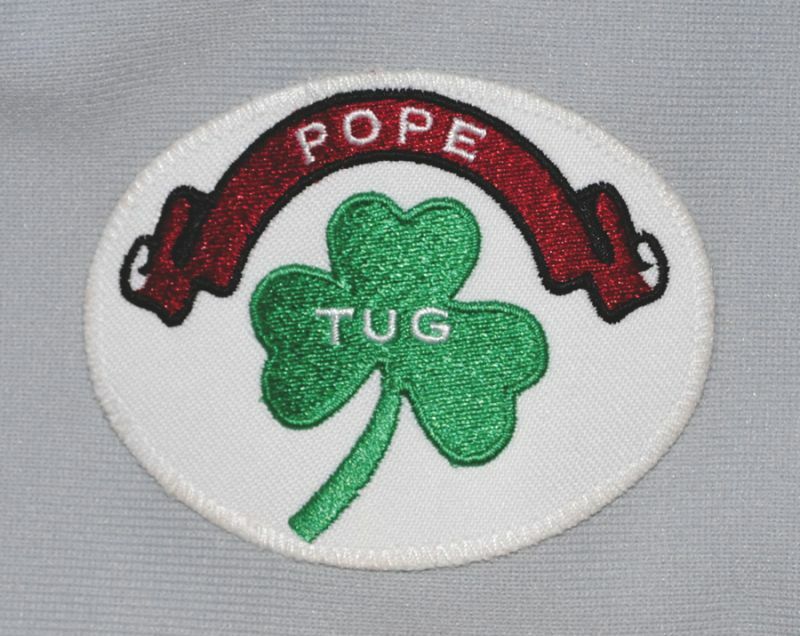 Veterans Stadium final year patch worn at home in 2003. 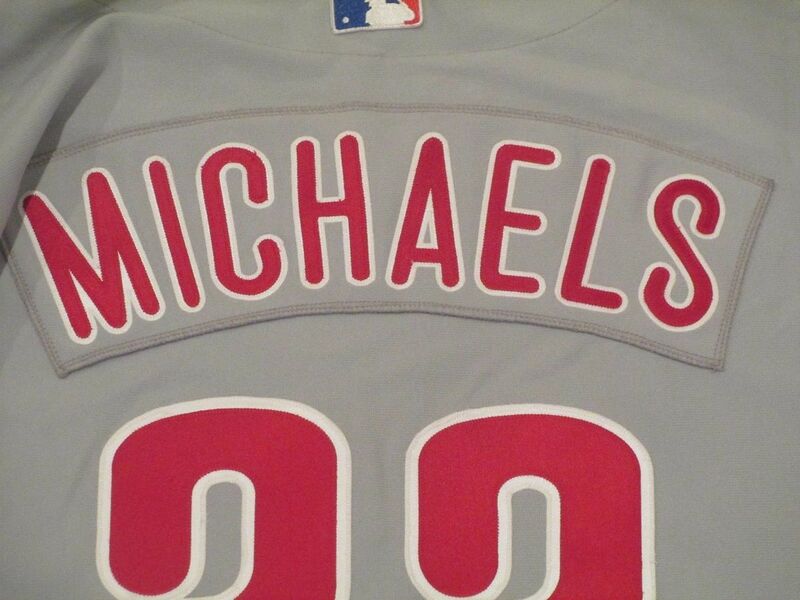 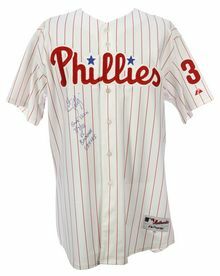 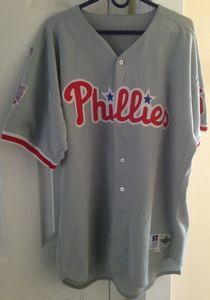 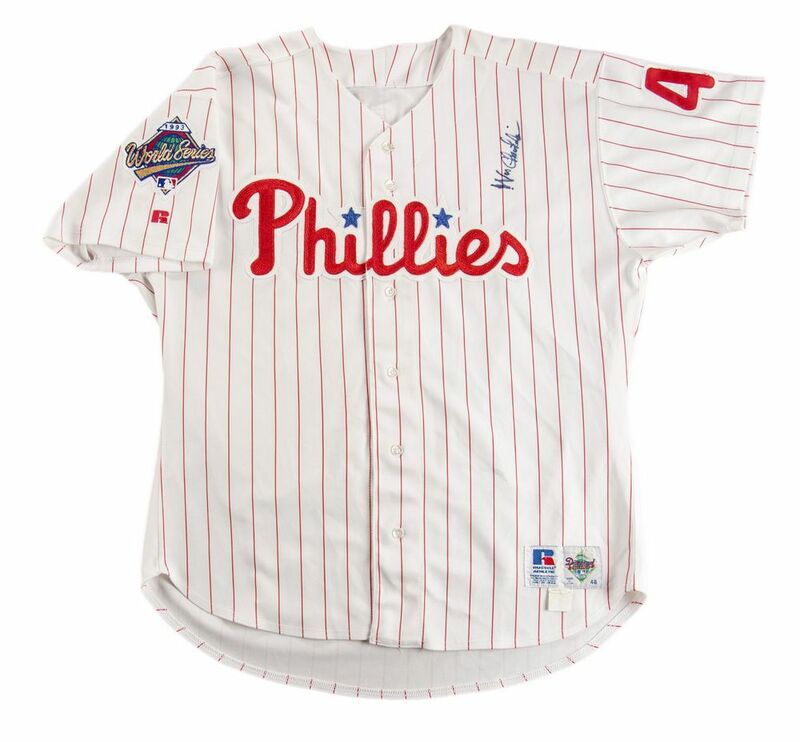 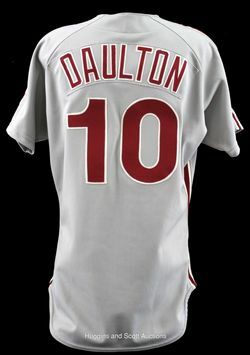 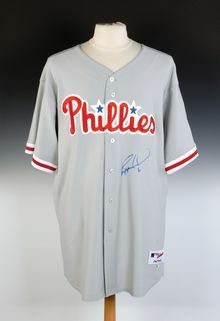 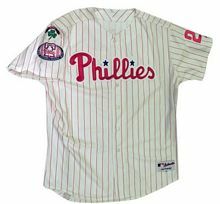 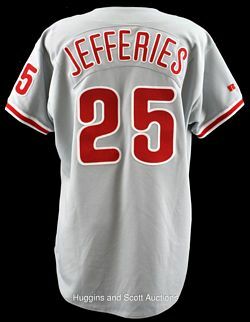 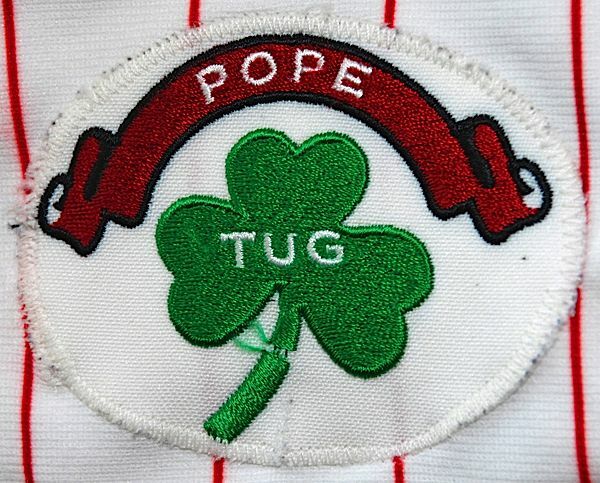 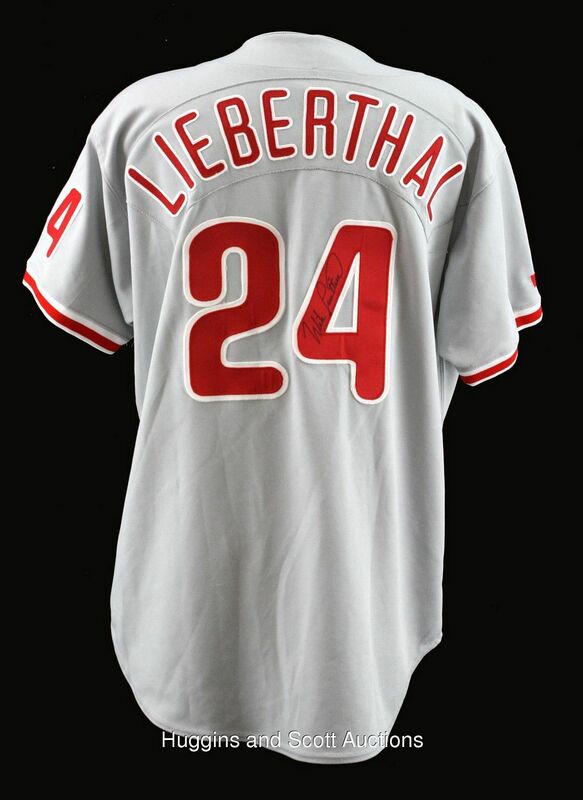 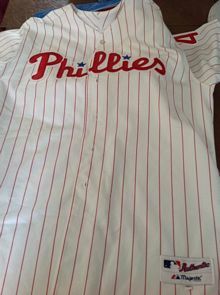 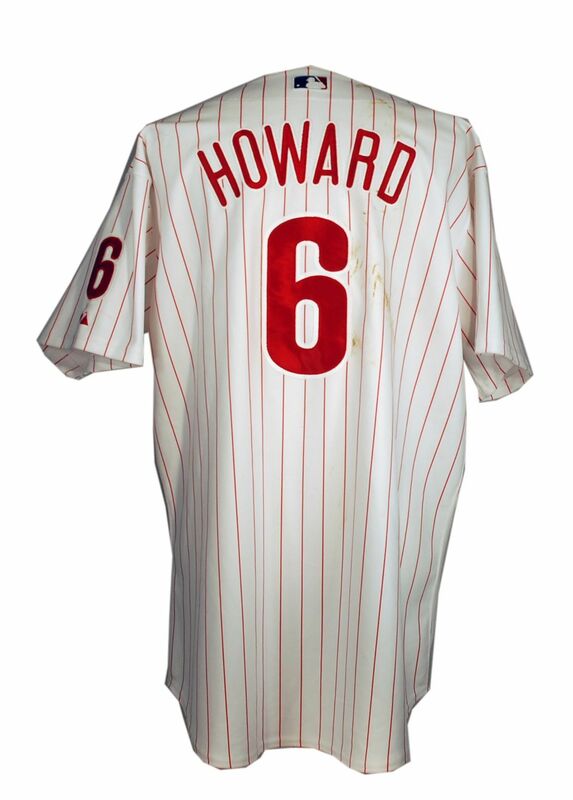 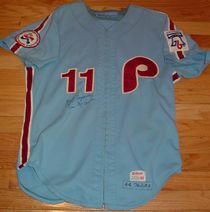 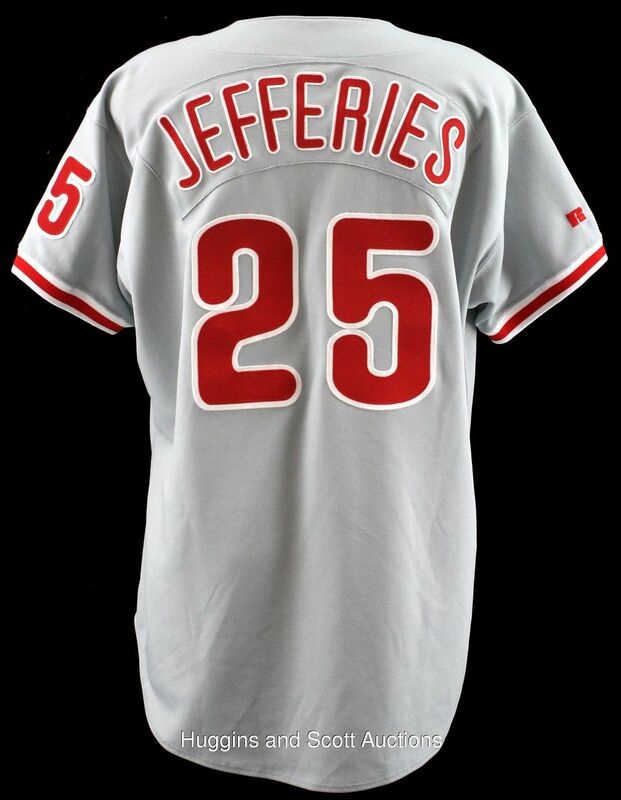 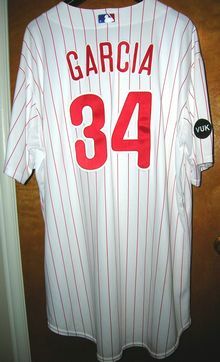 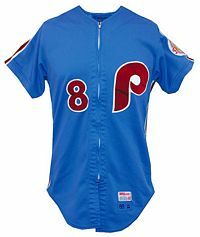 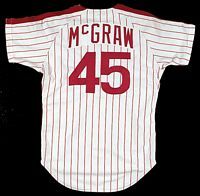 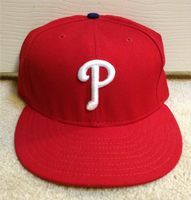 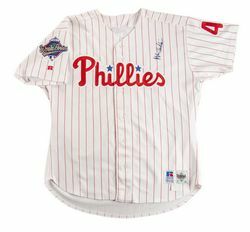 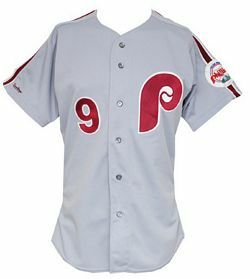 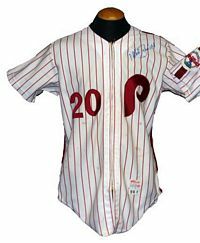 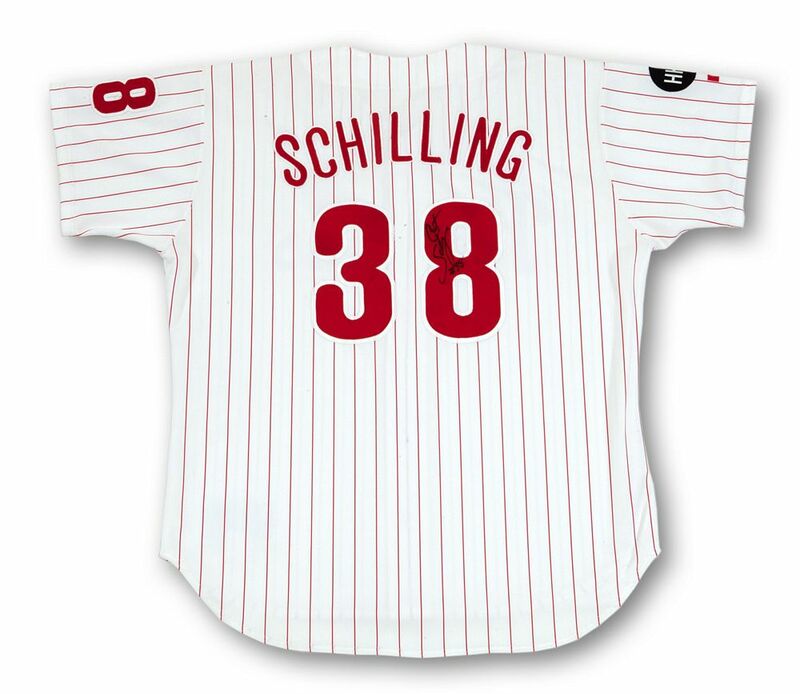 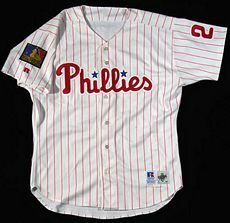 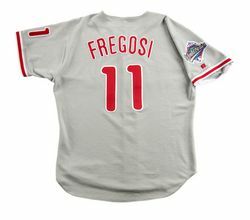 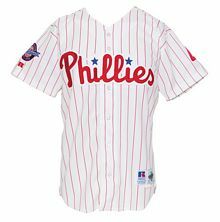 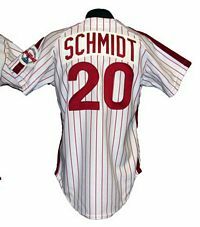 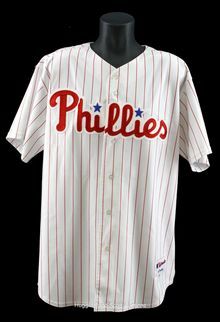 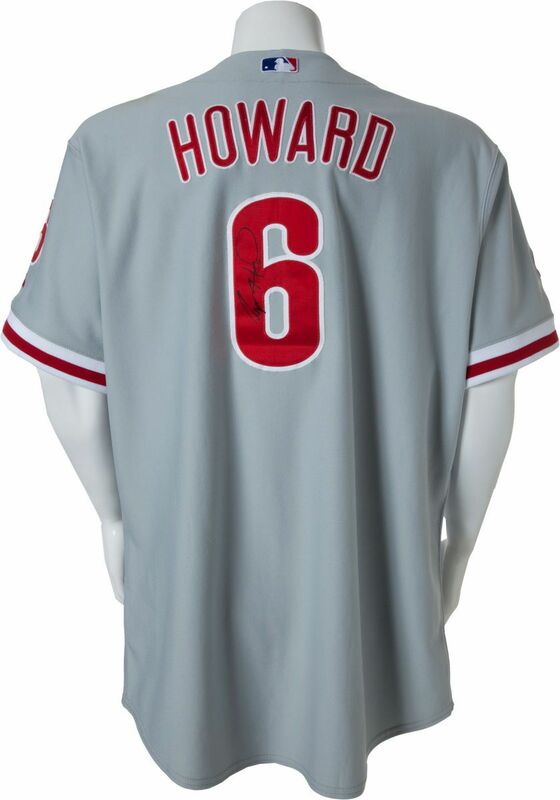 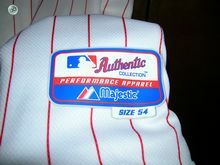 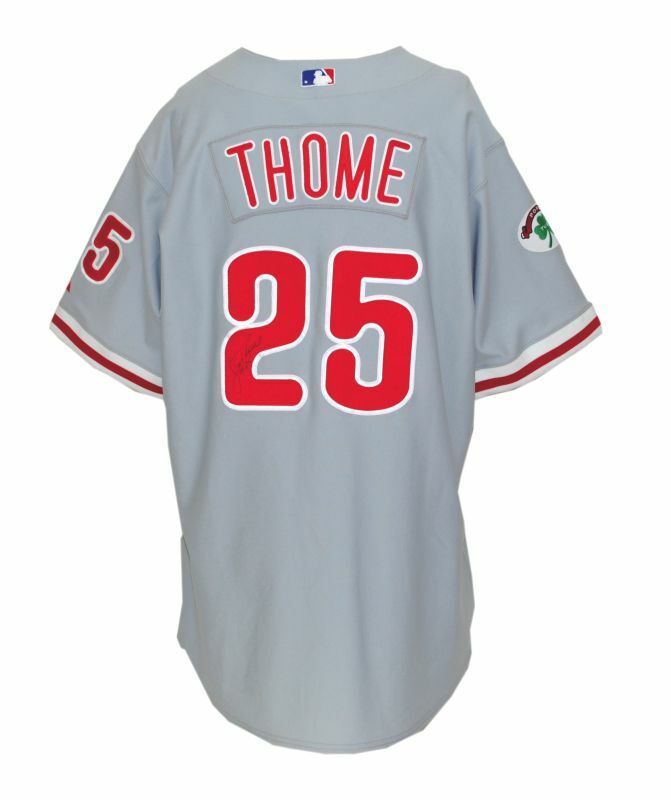 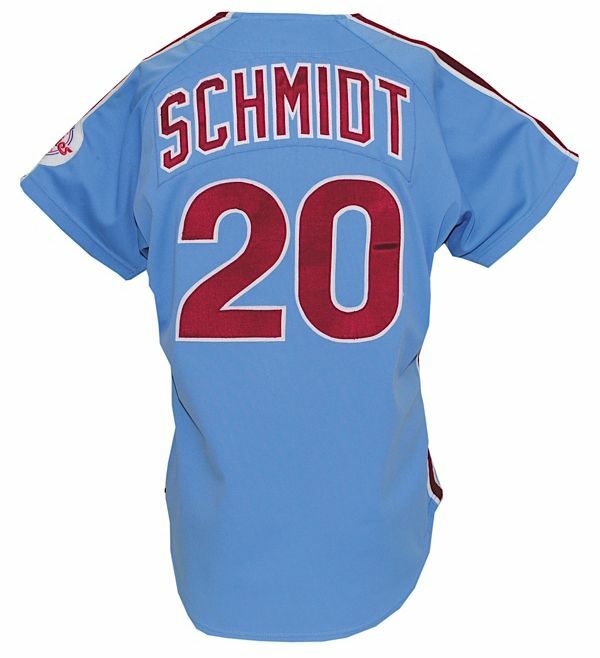 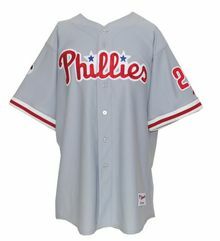 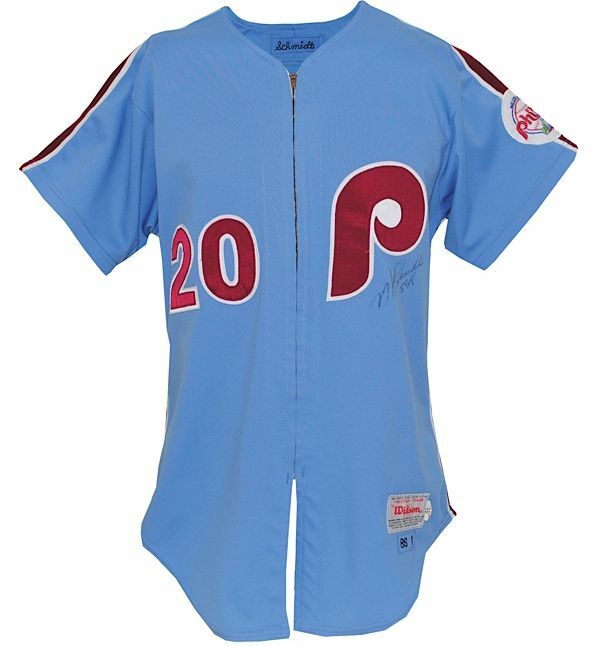 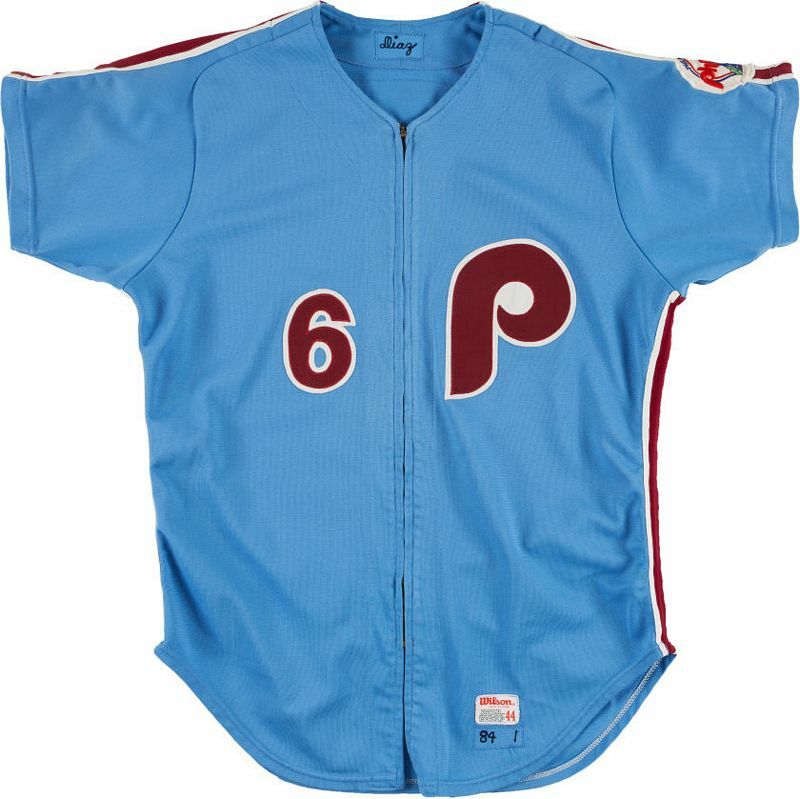 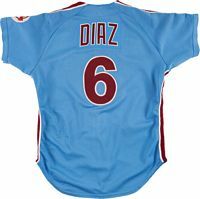 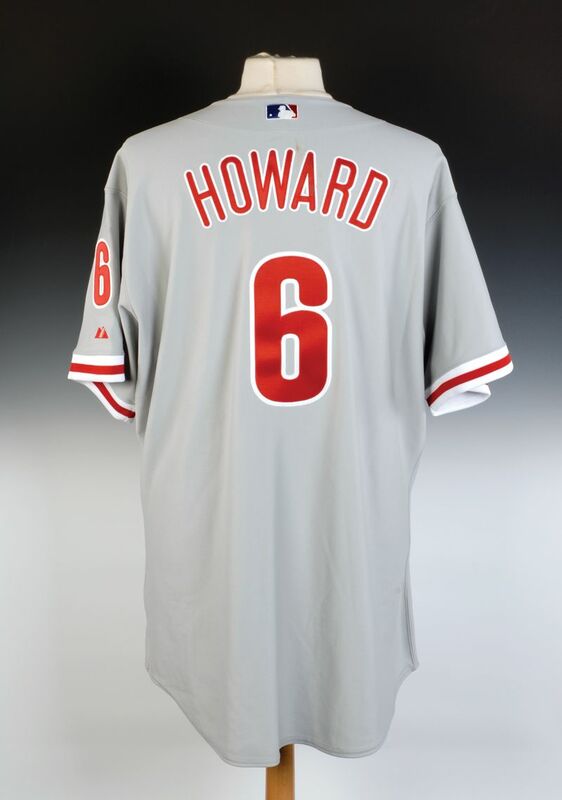 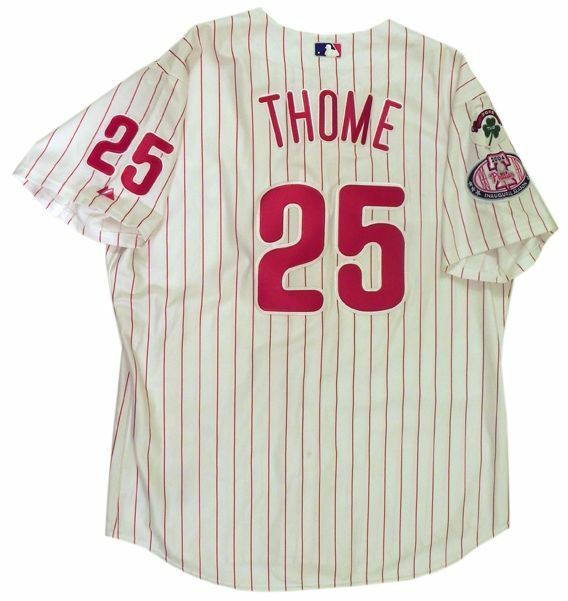 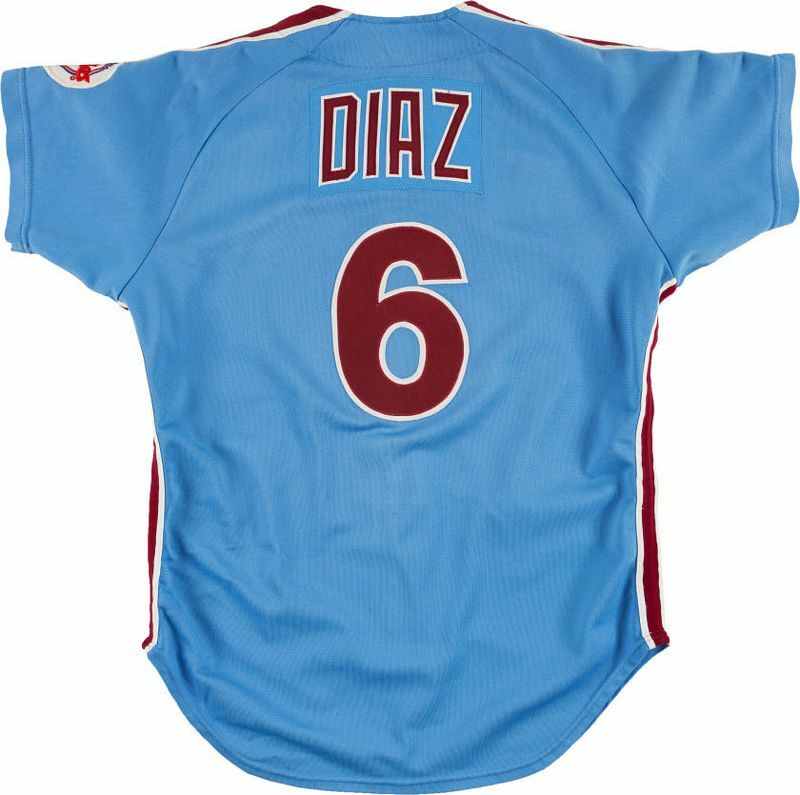 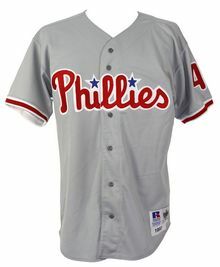 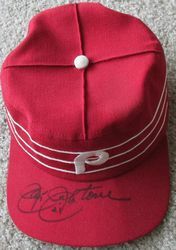 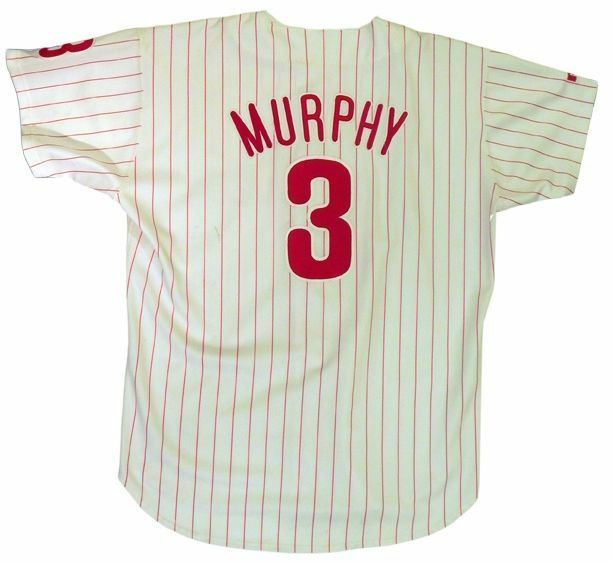 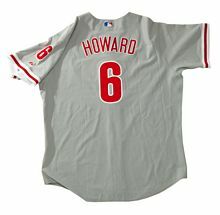 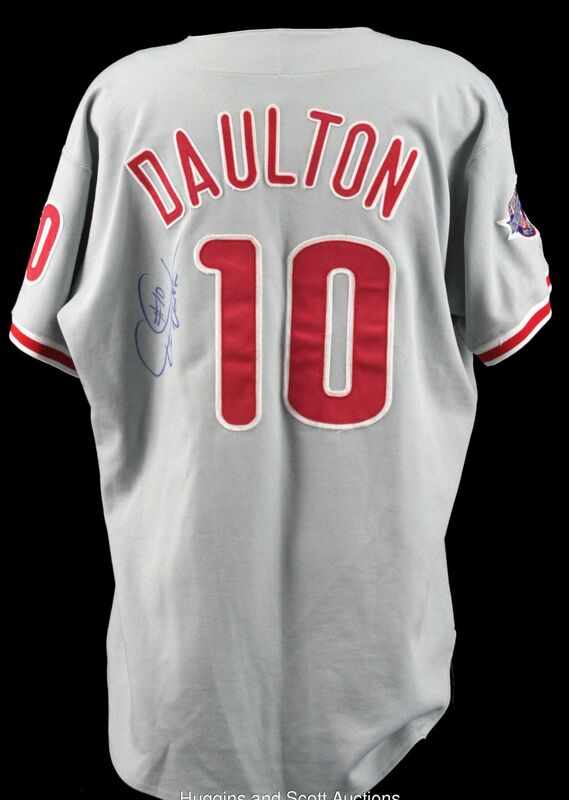 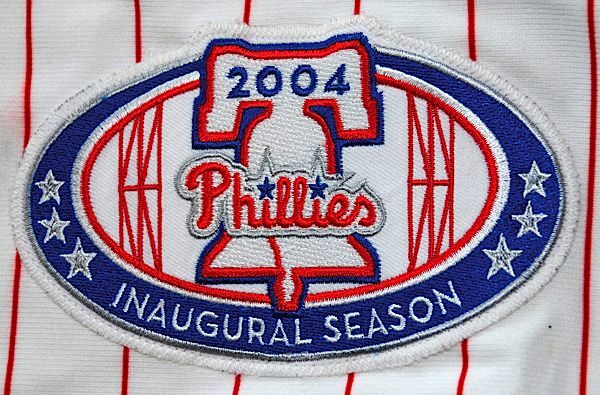 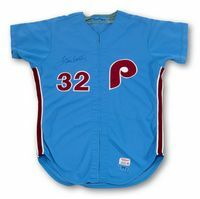 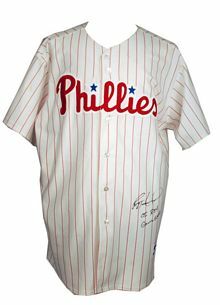 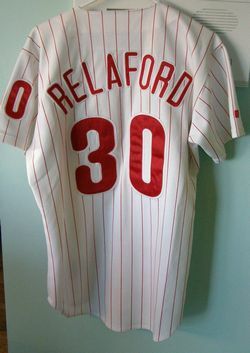 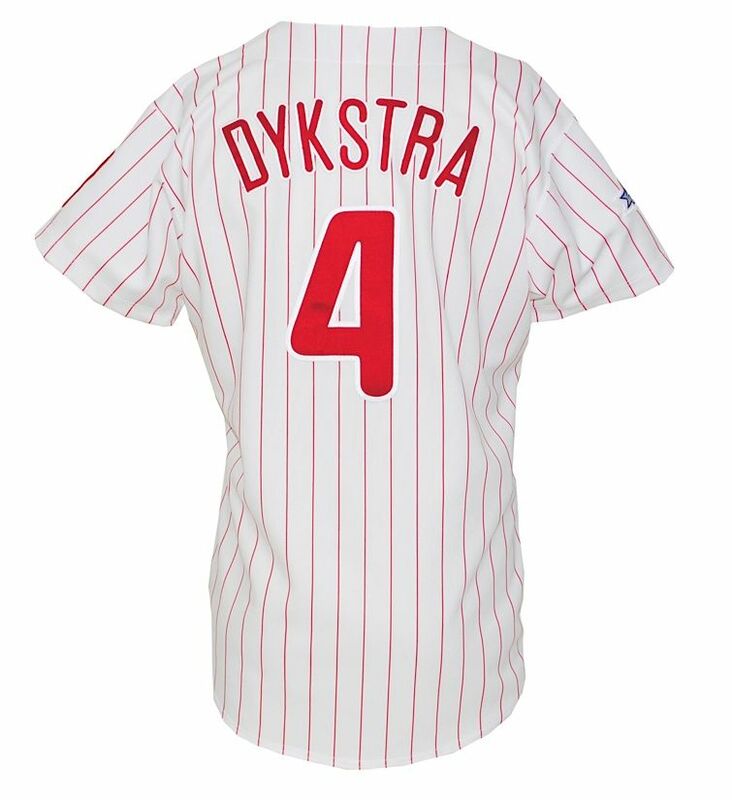 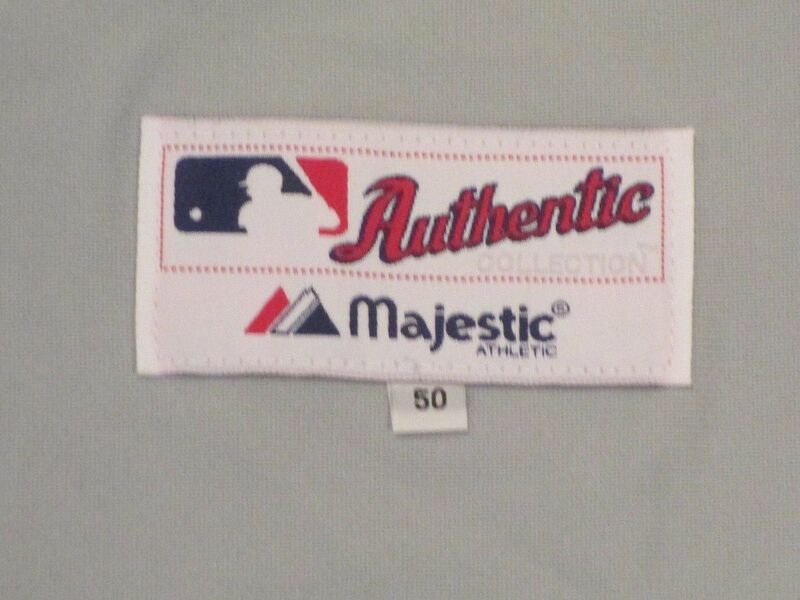 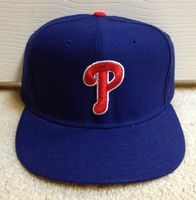 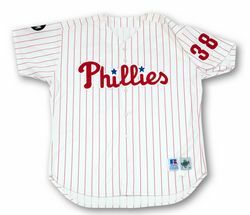 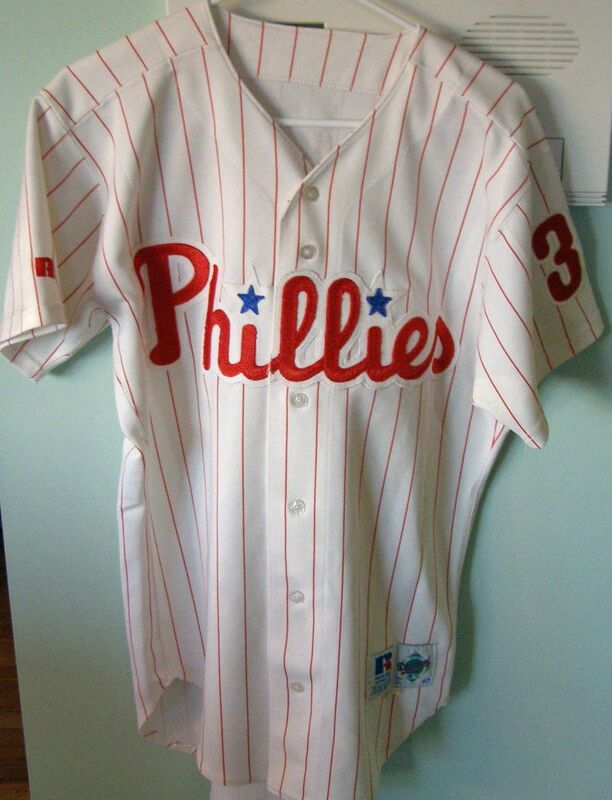 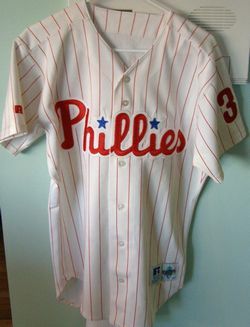 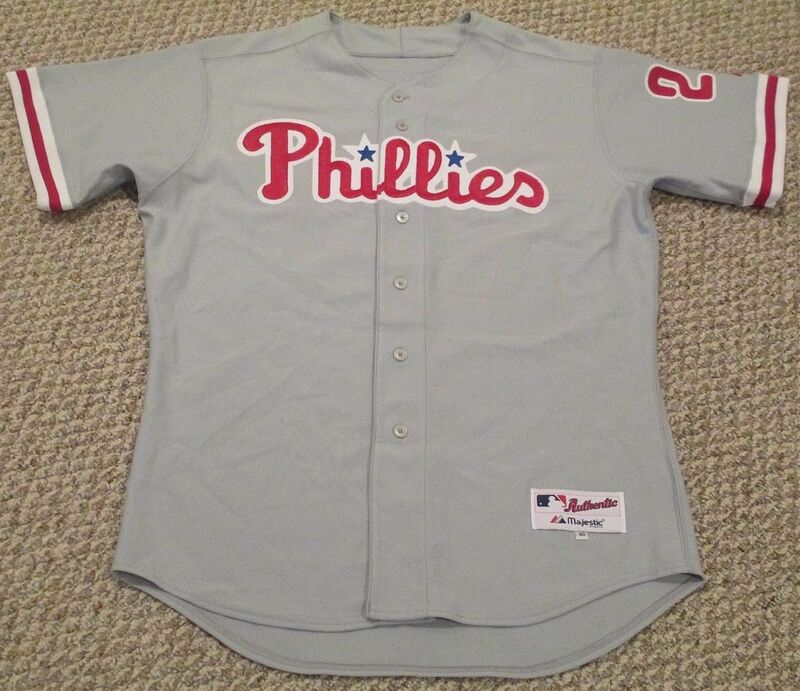 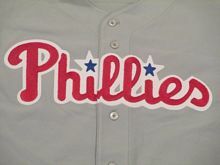 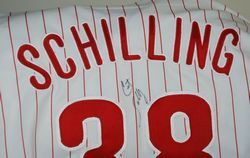 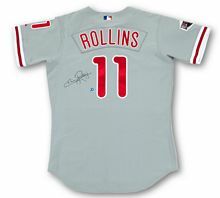 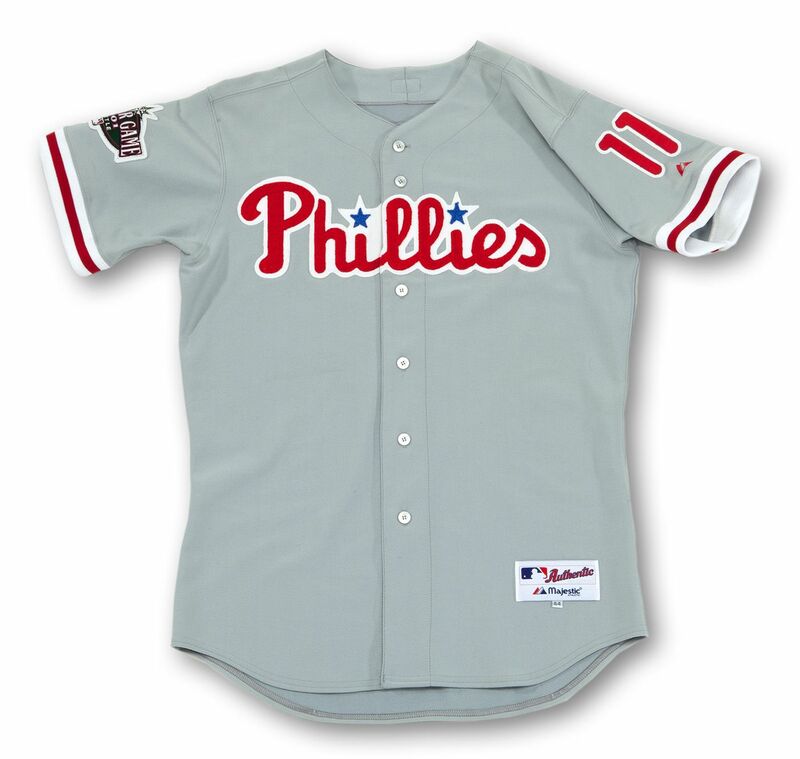 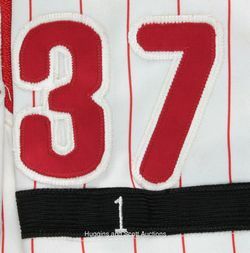 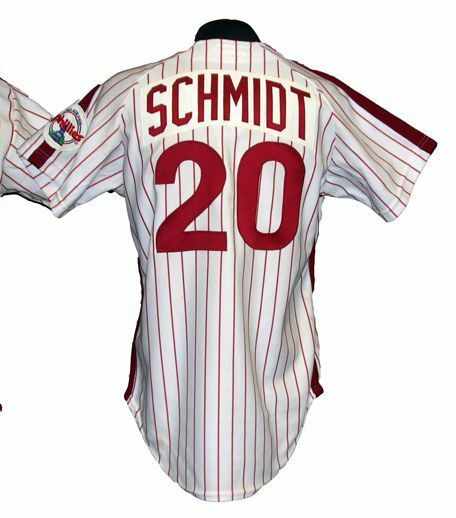 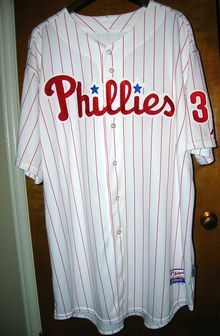 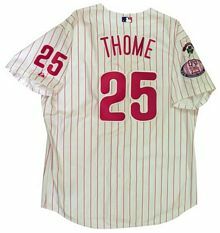 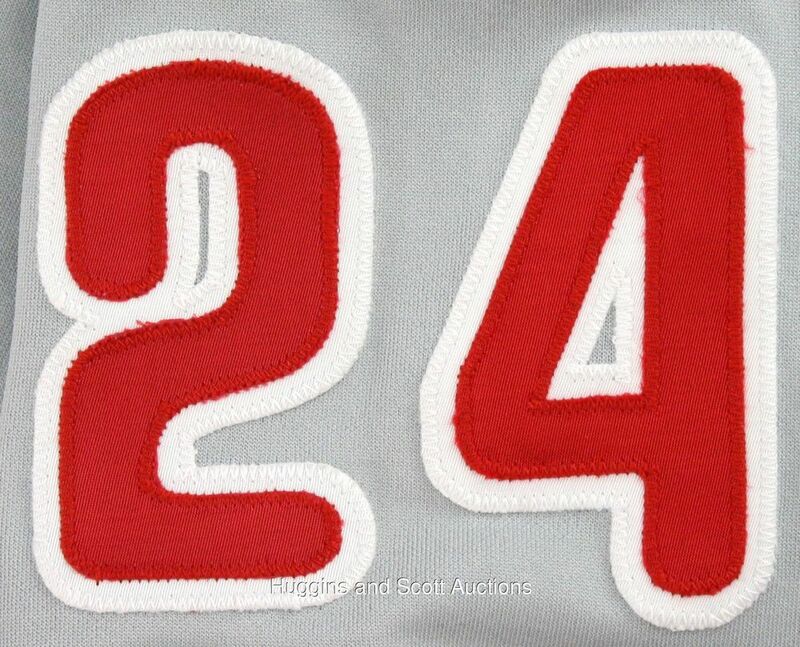 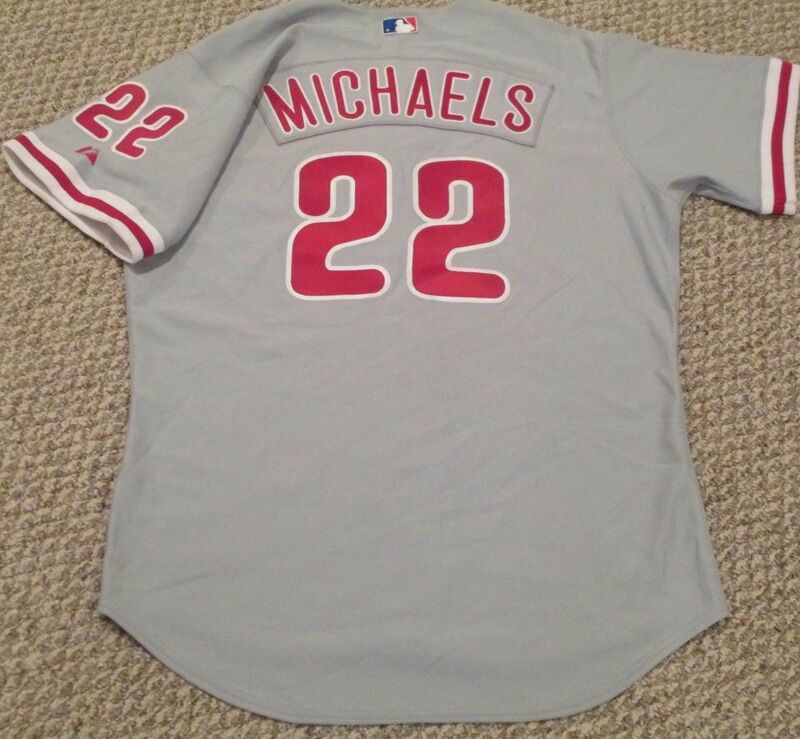 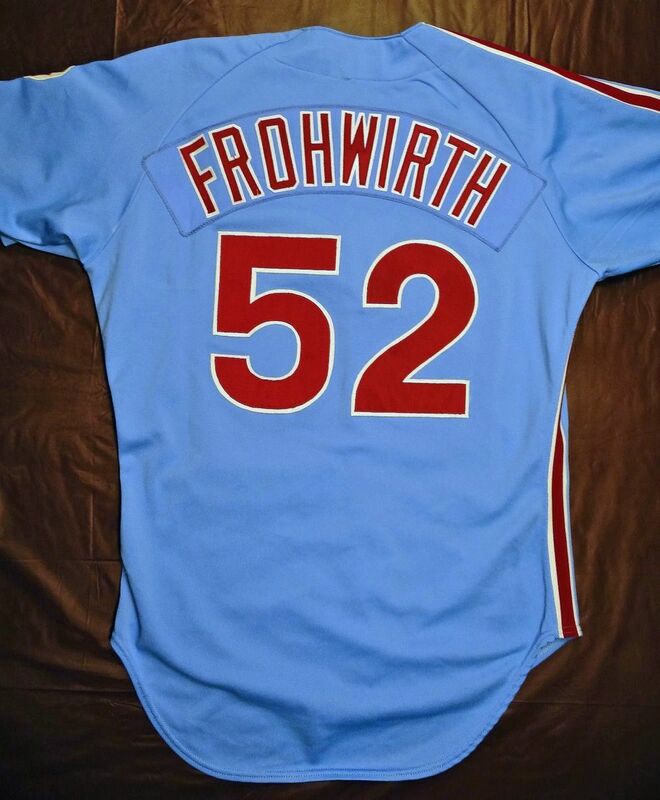 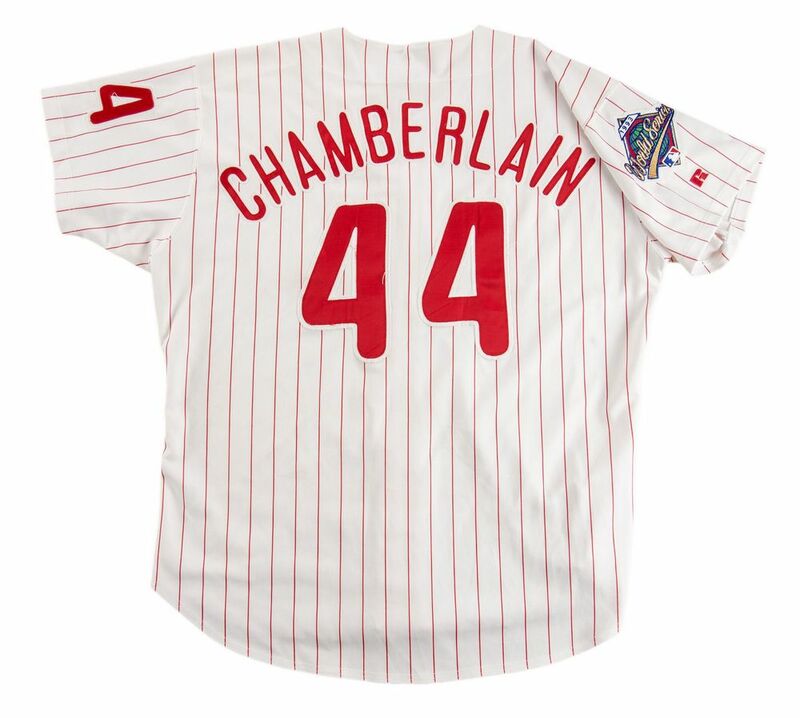 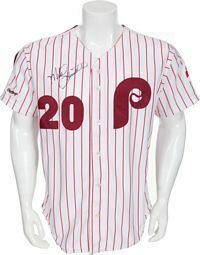 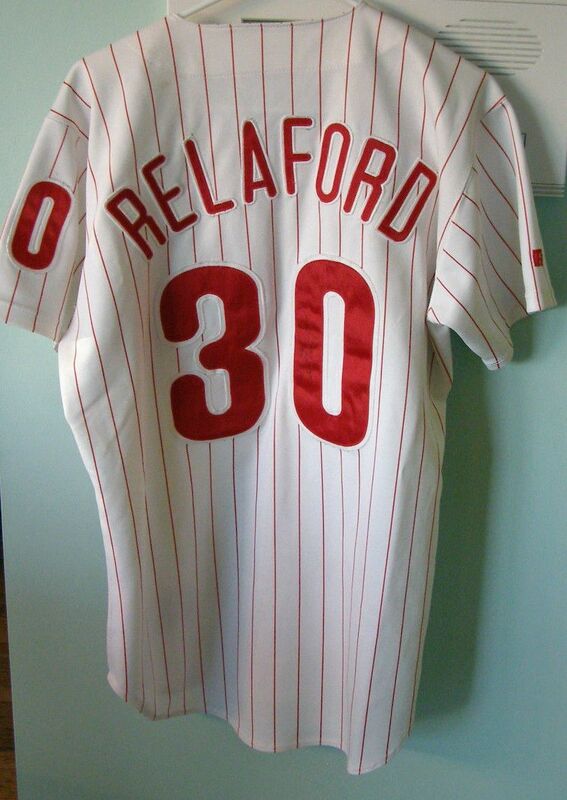 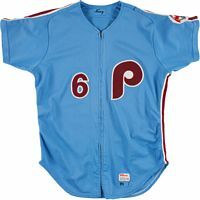 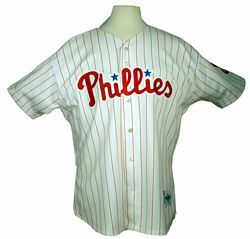 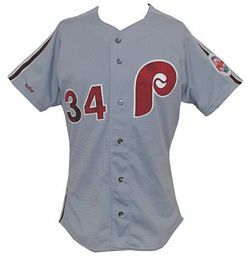 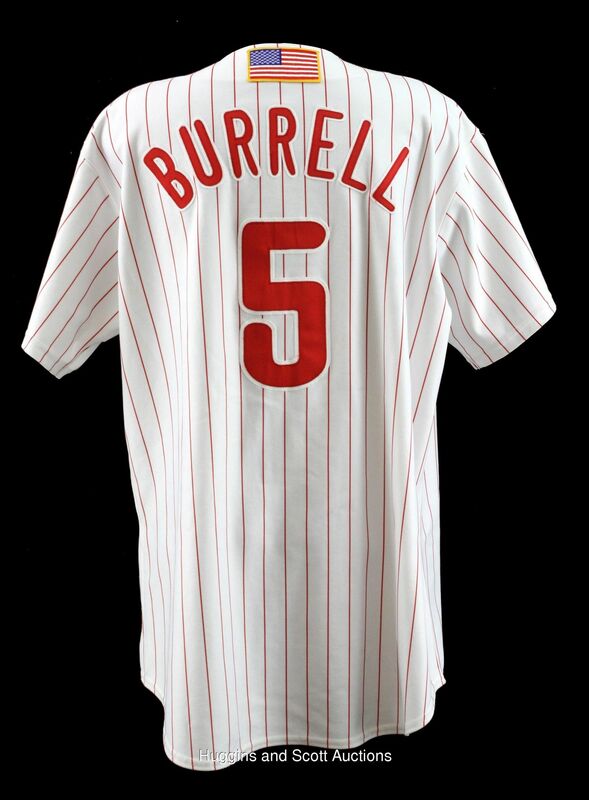 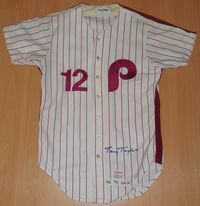 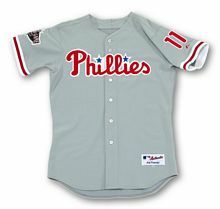 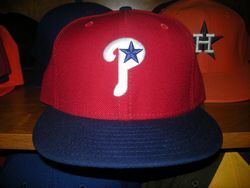 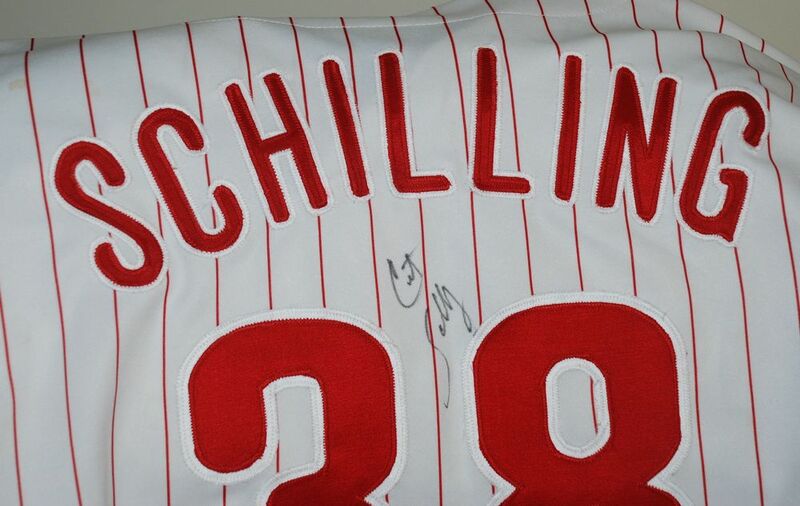 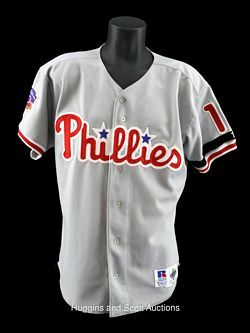 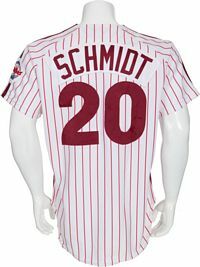 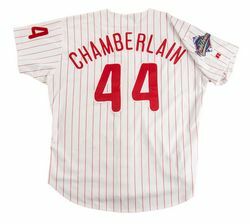 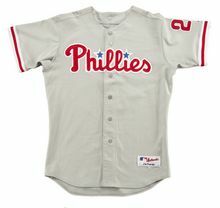 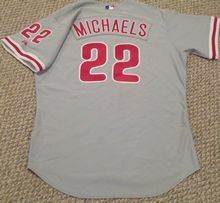 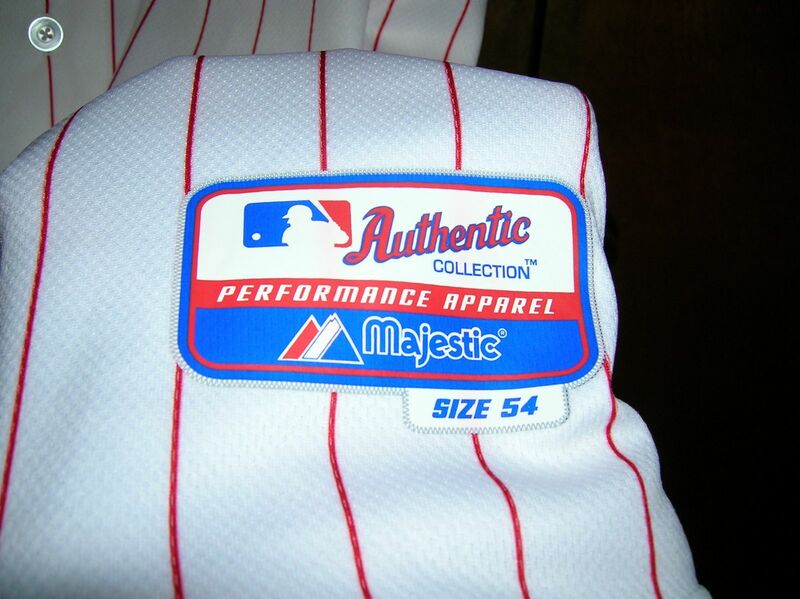 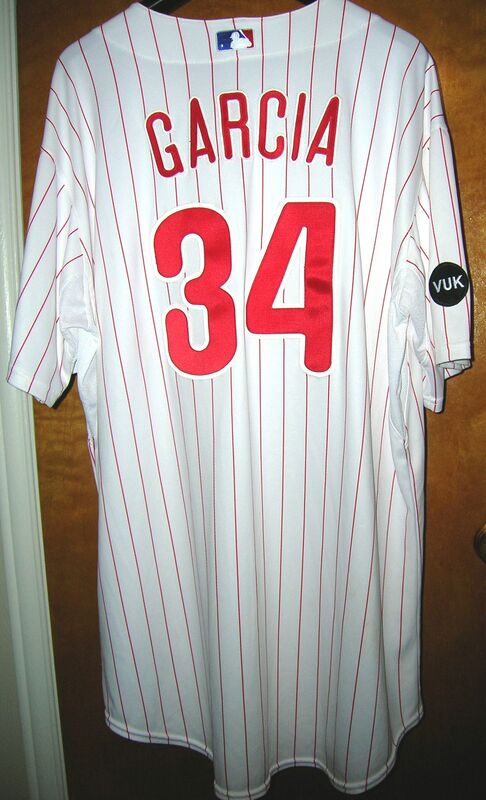 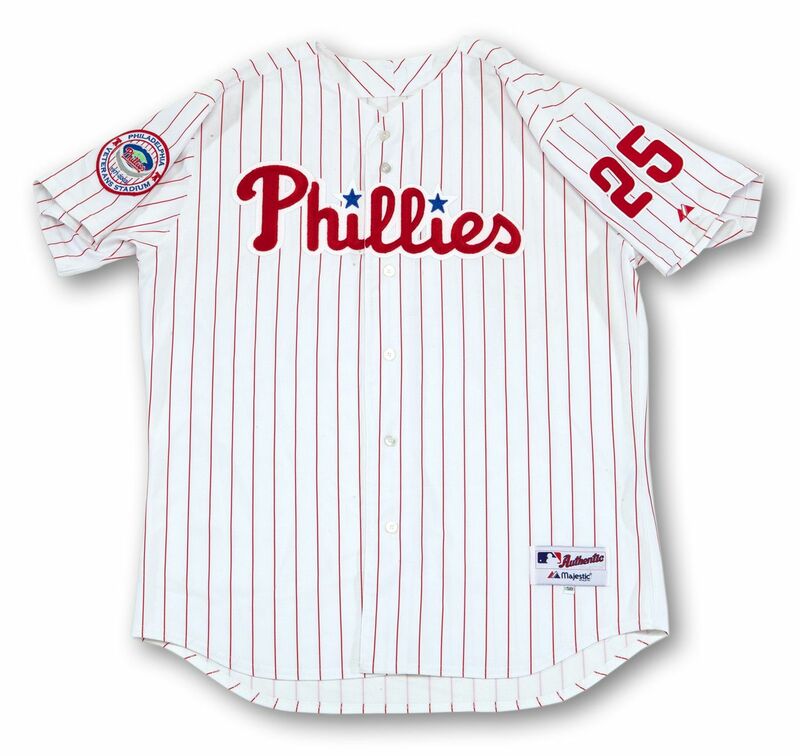 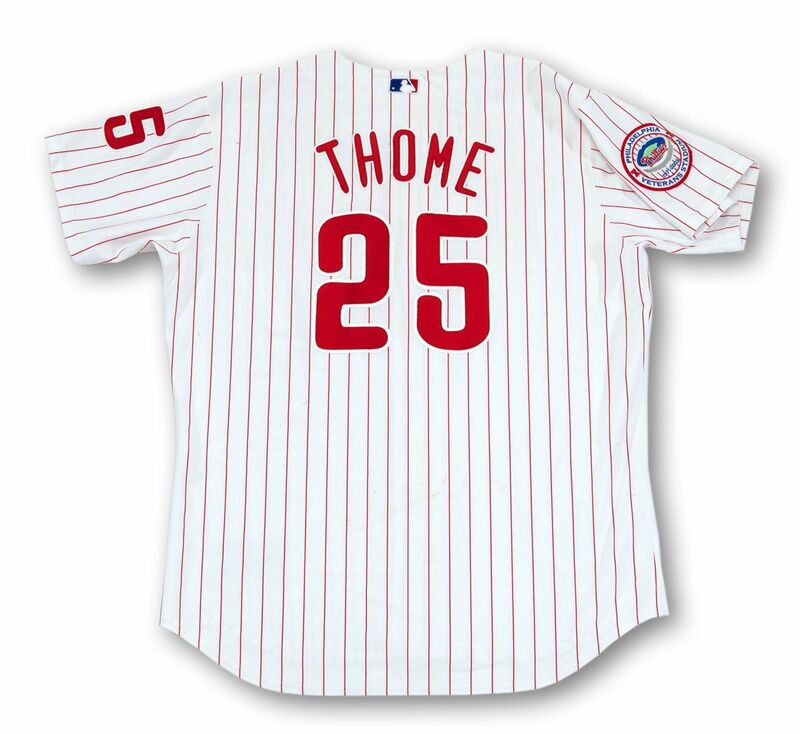 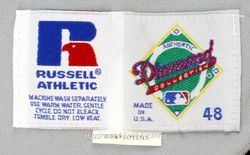 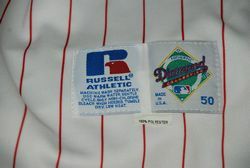 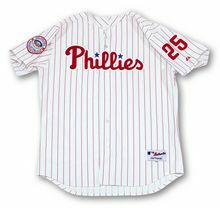 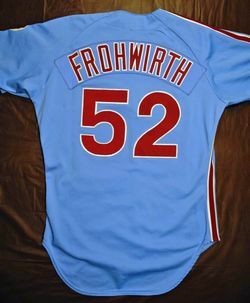 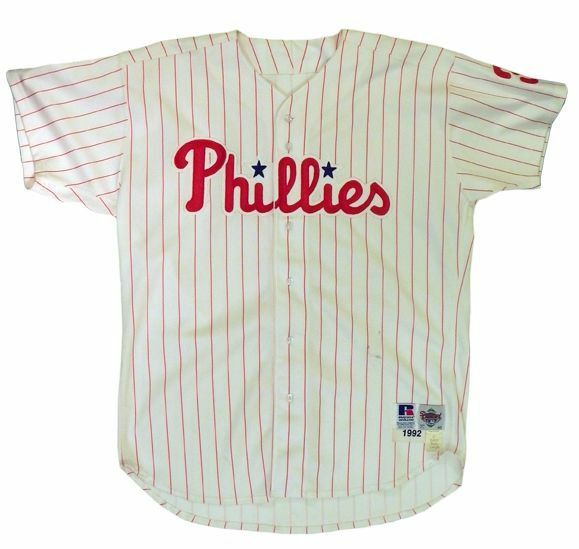 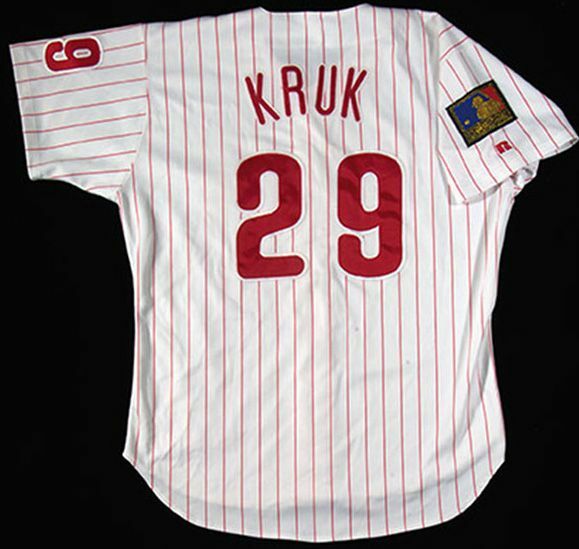 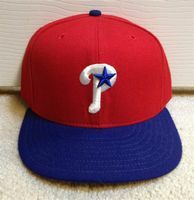 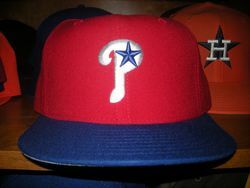 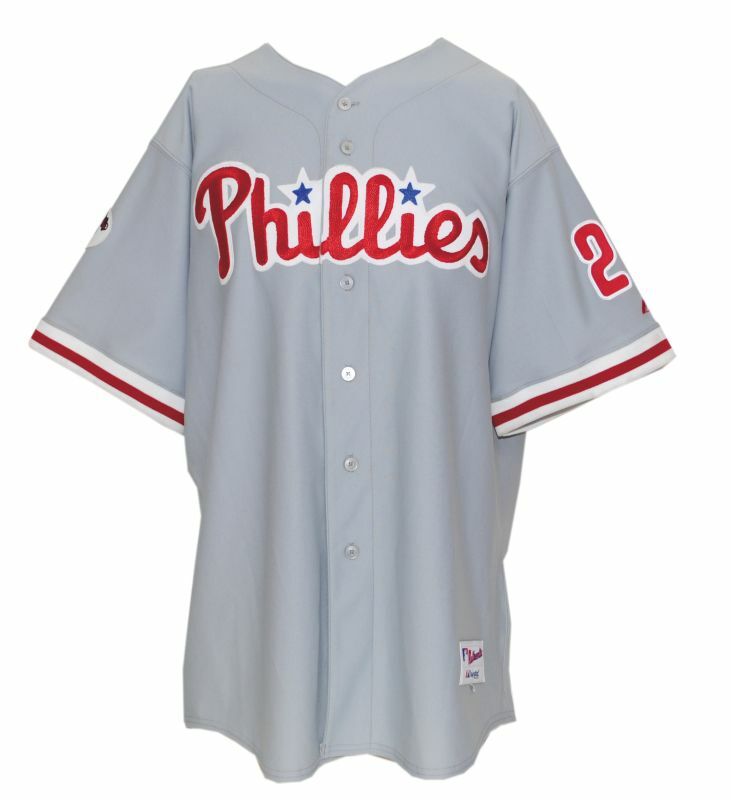 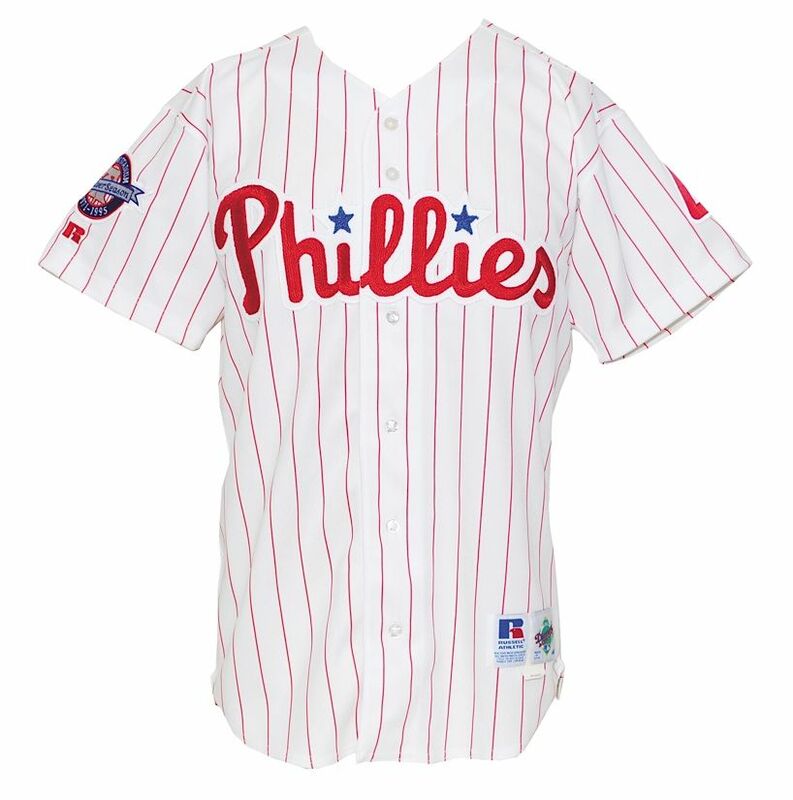 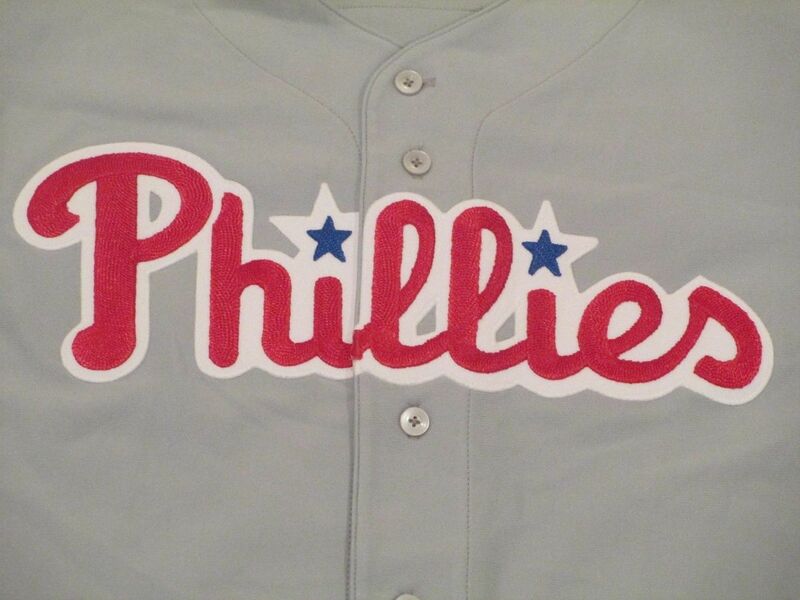 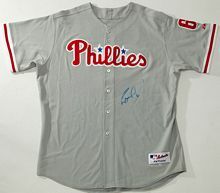 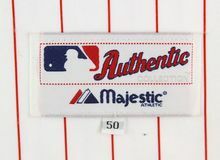 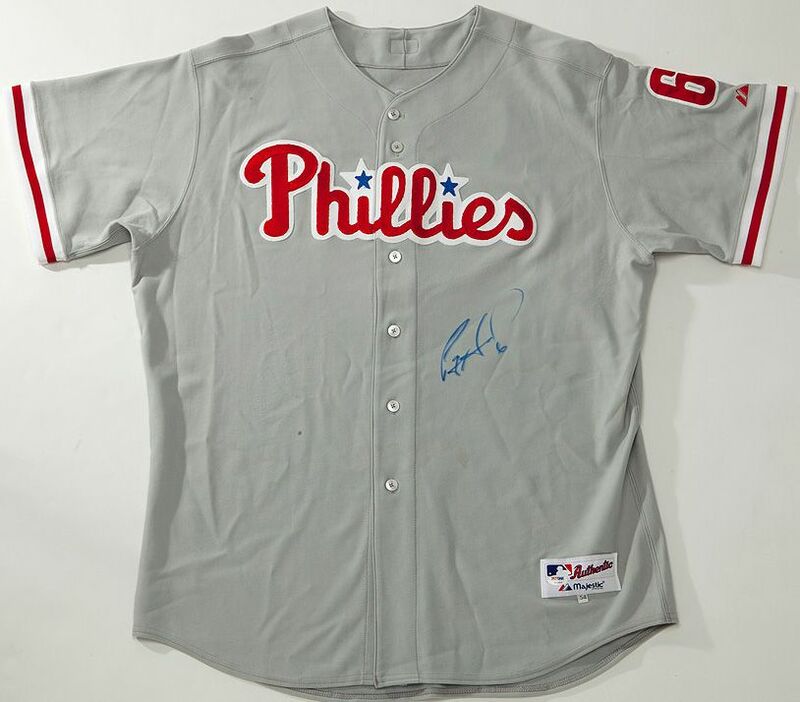 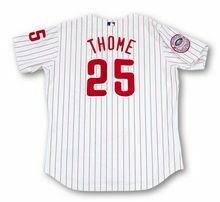 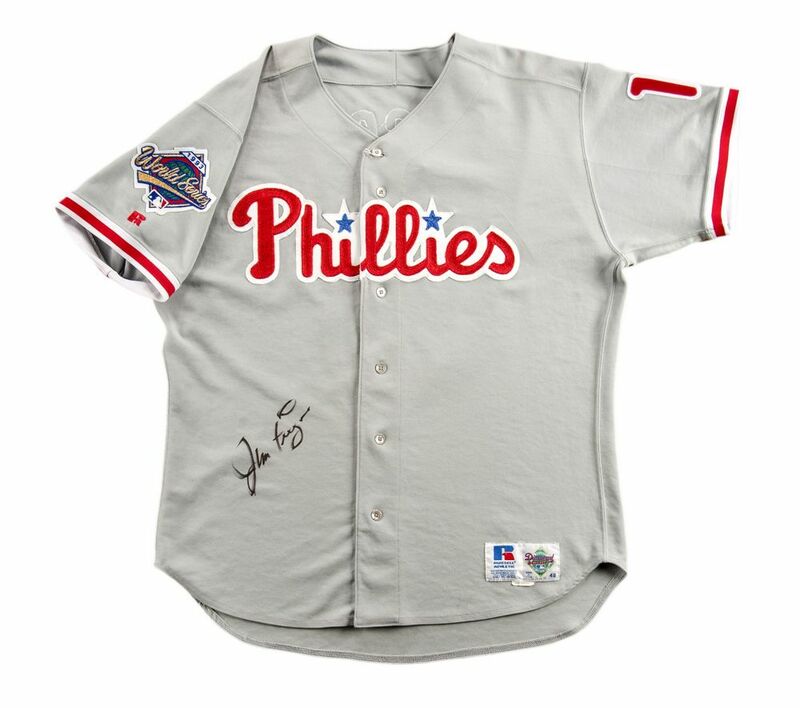 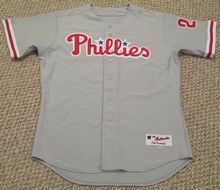 New Phillies Stadium patch worn at home in 2004. 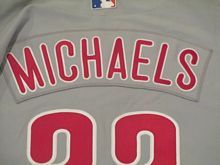 Road jersey NOB nameplates are dropped.